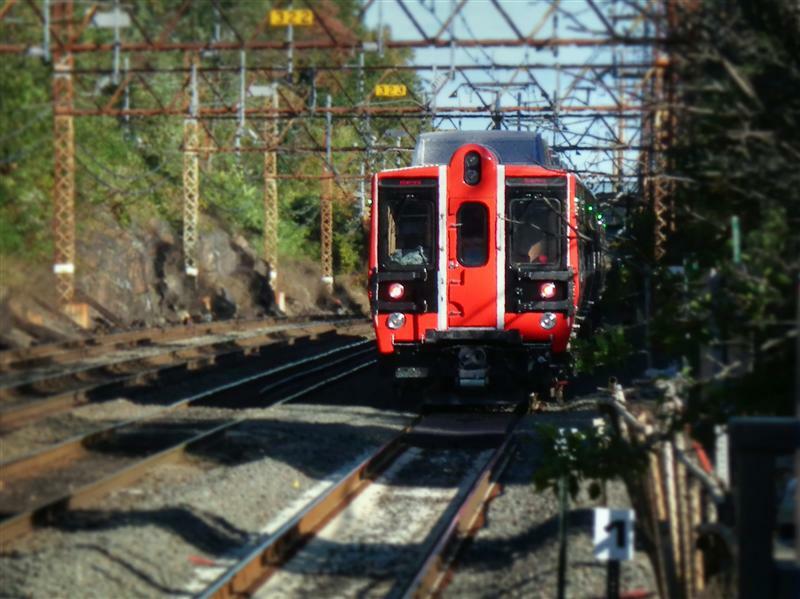 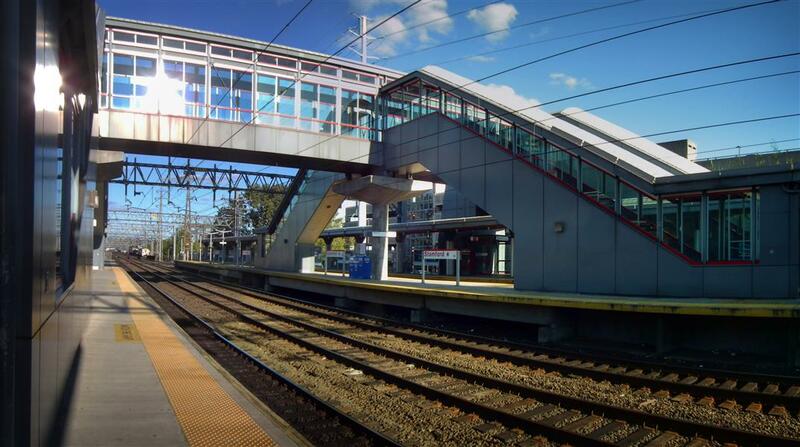 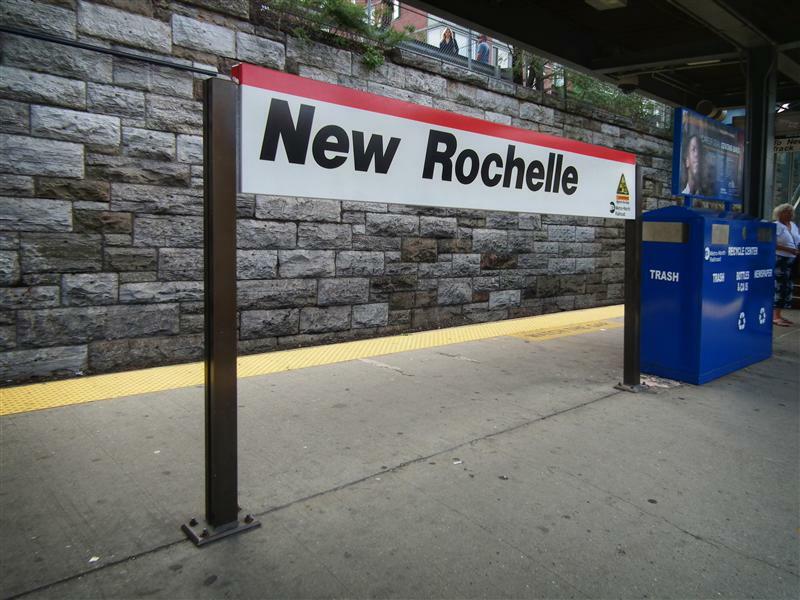 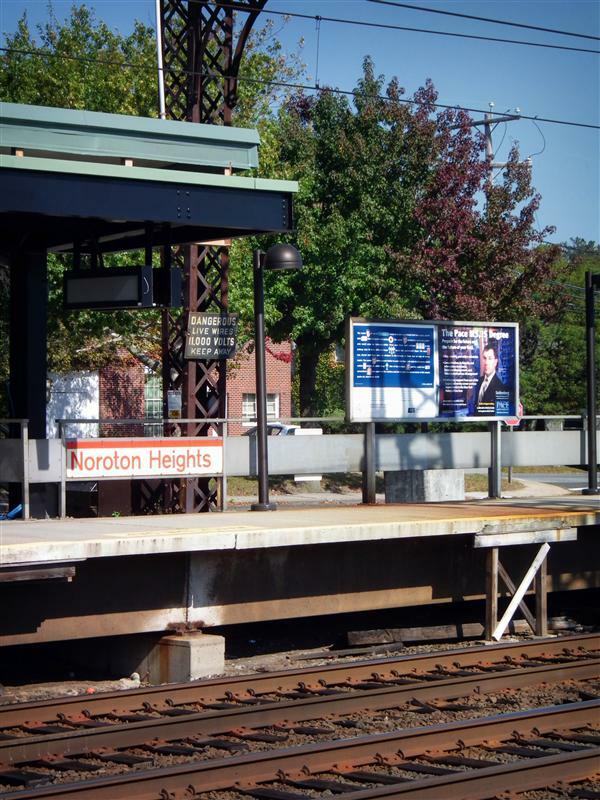 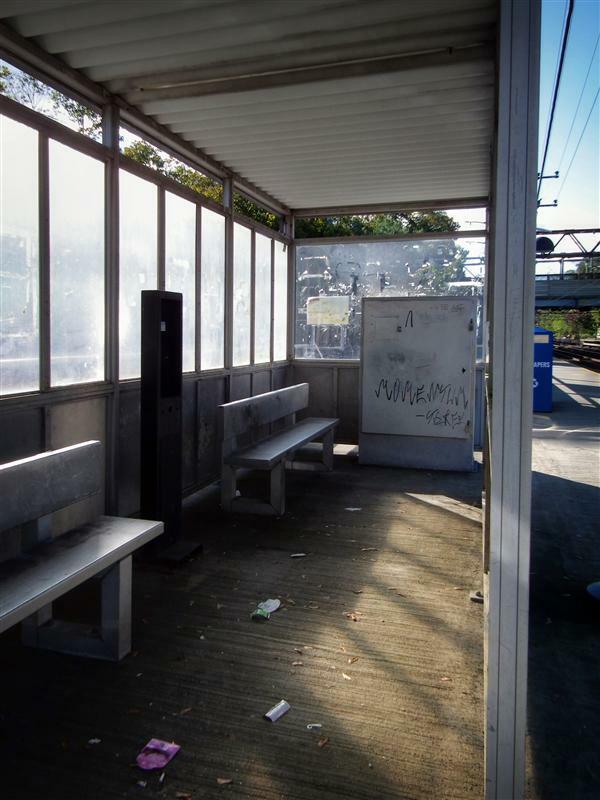 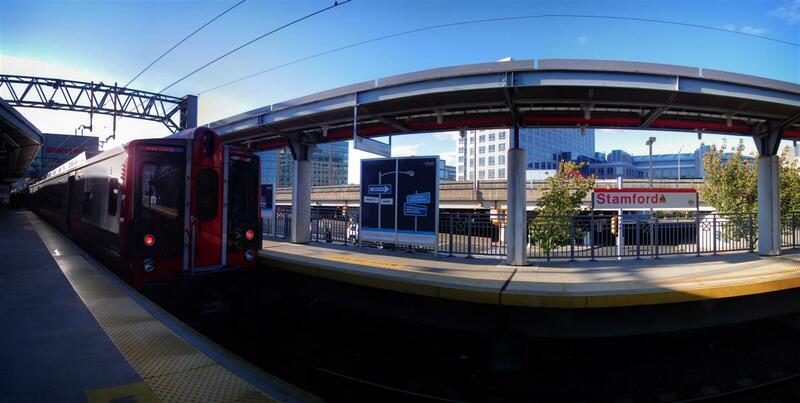 Welcome to New Rochelle, our next stop on our tour of the New Haven Line. 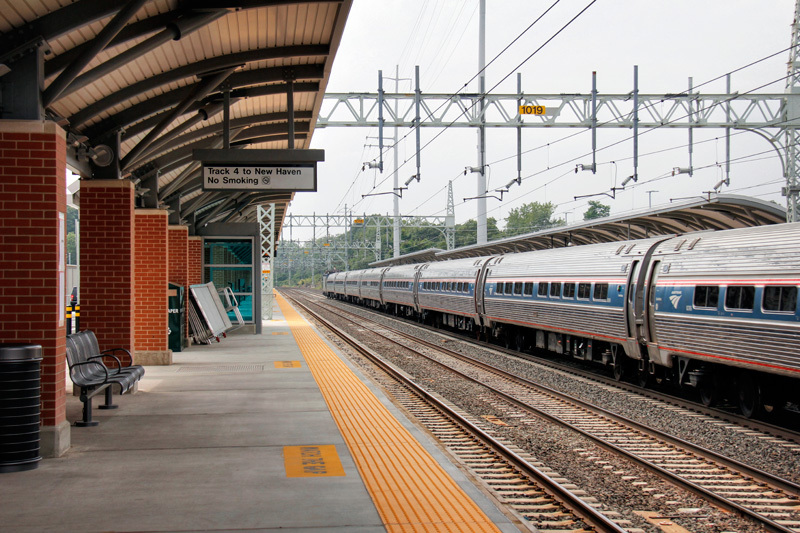 Located about 17 miles from Grand Central, a train ride to the city takes about 35 minutes – leaving plenty of time to get to Broadway in 45. 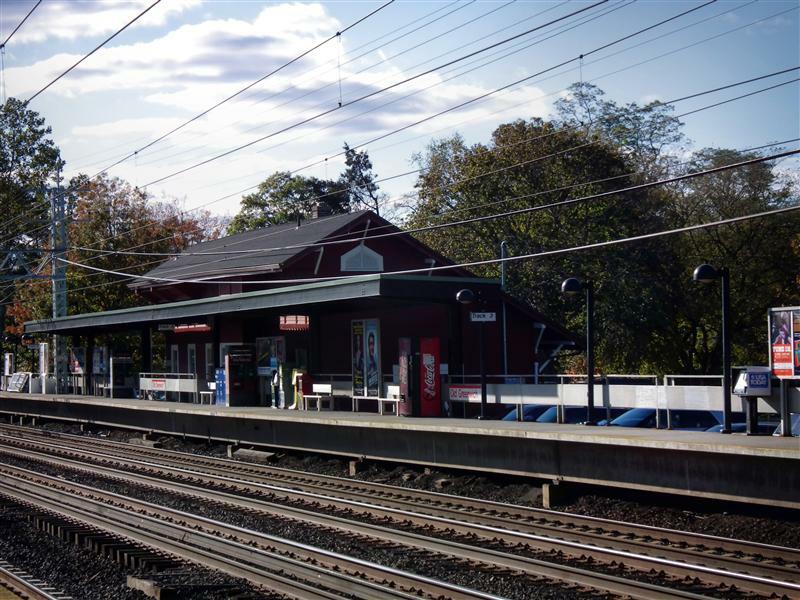 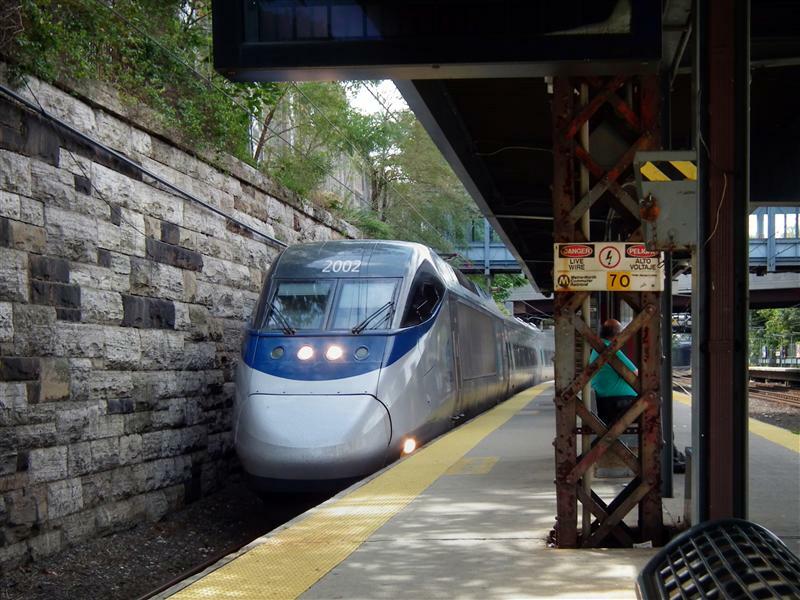 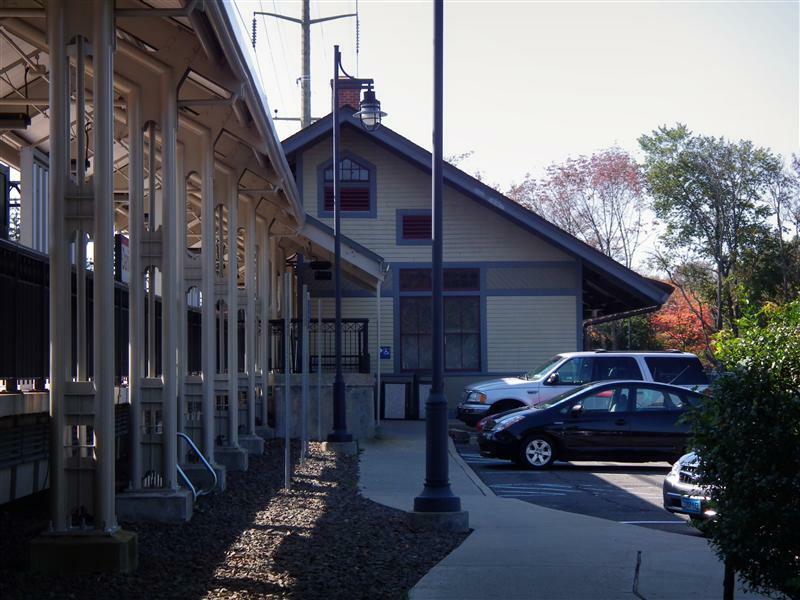 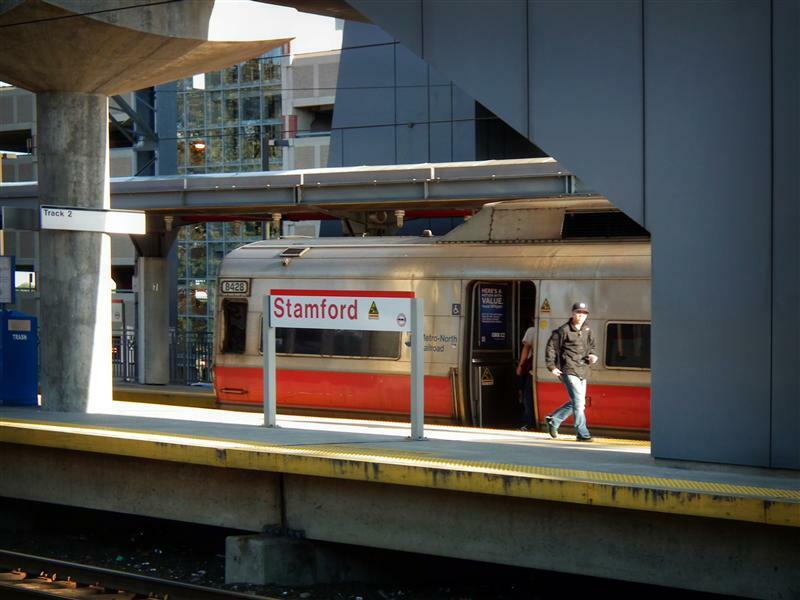 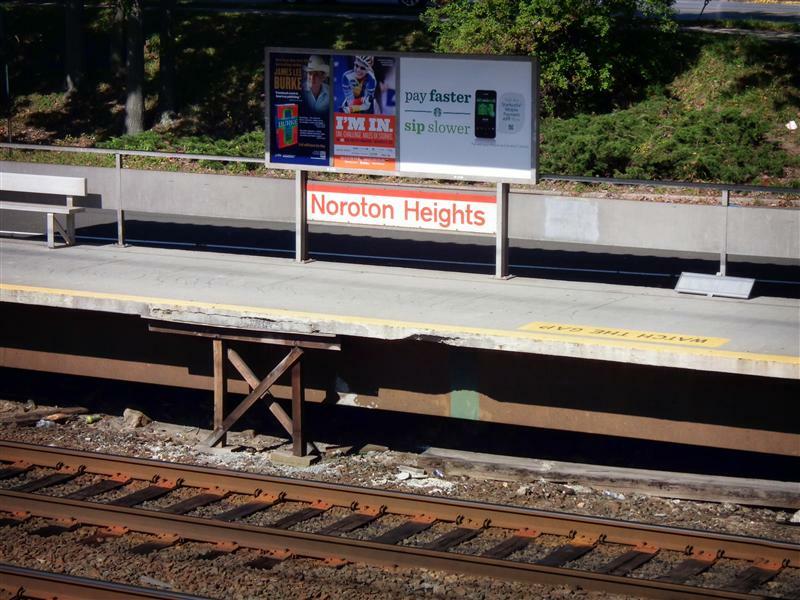 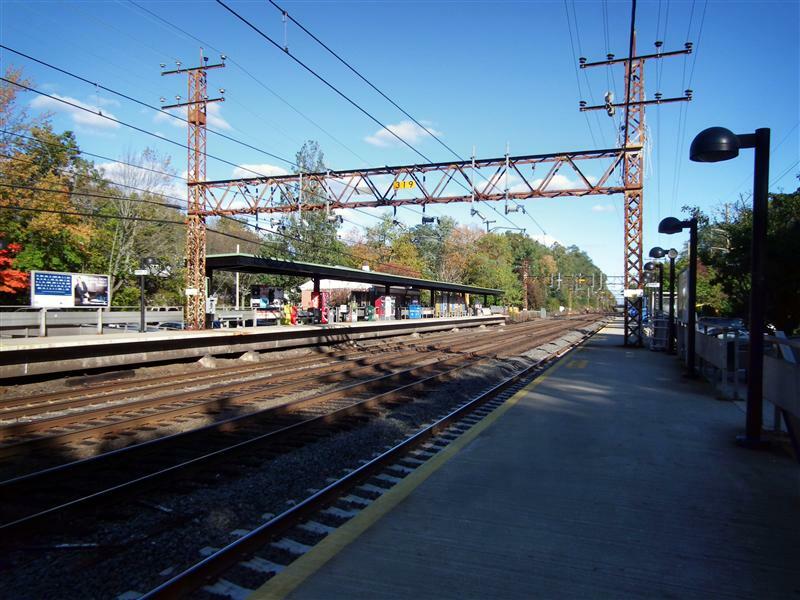 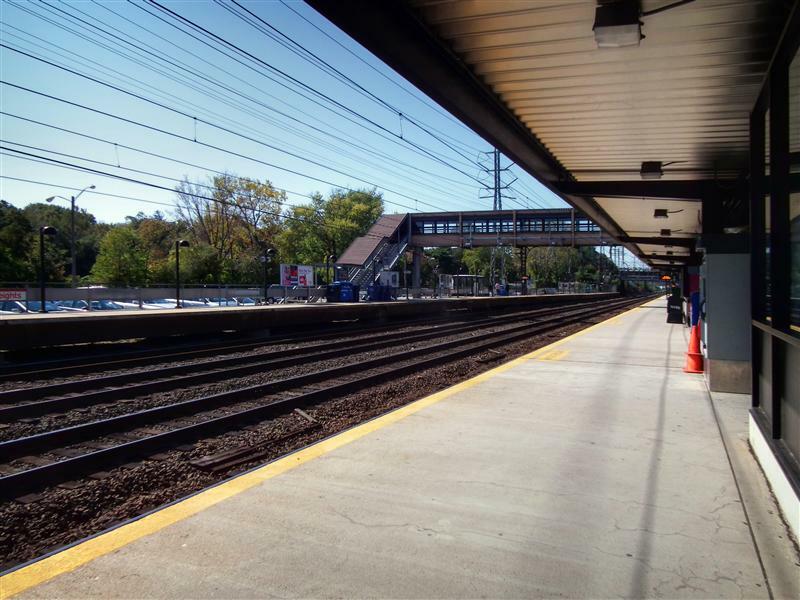 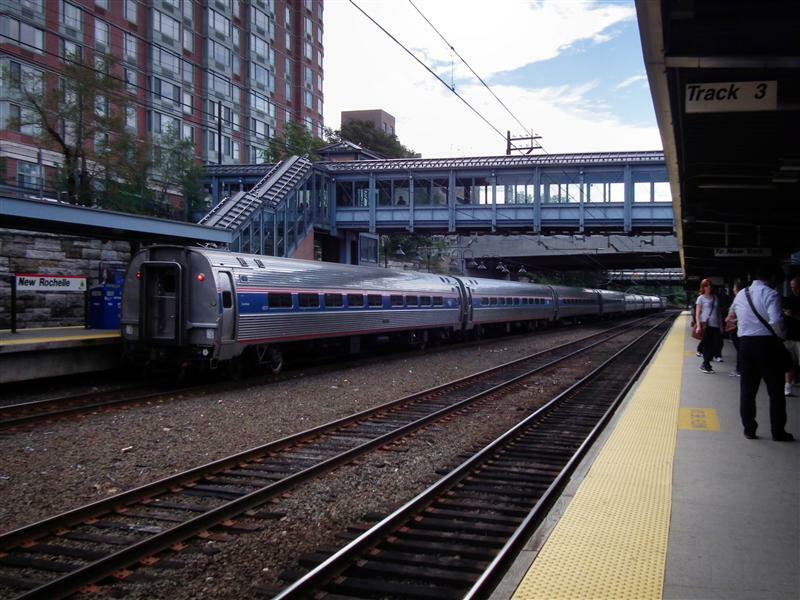 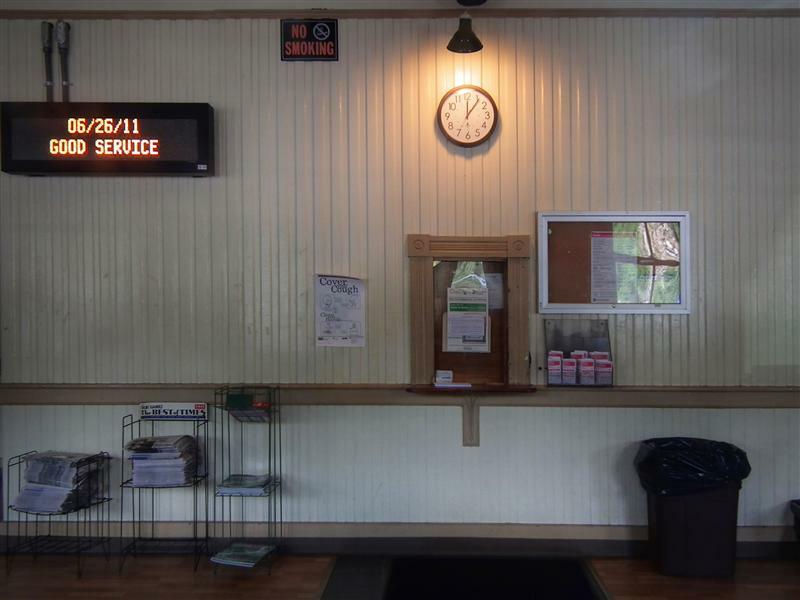 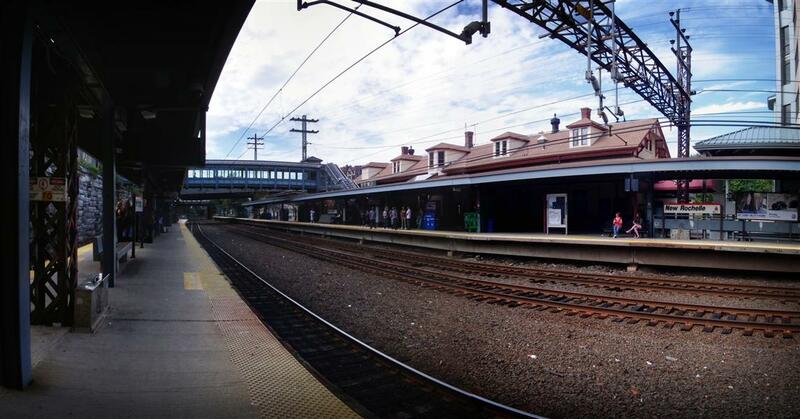 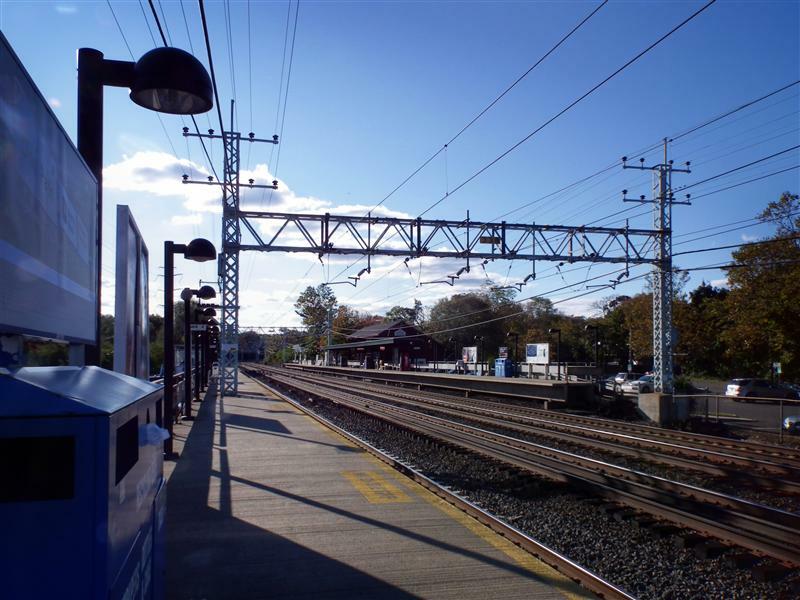 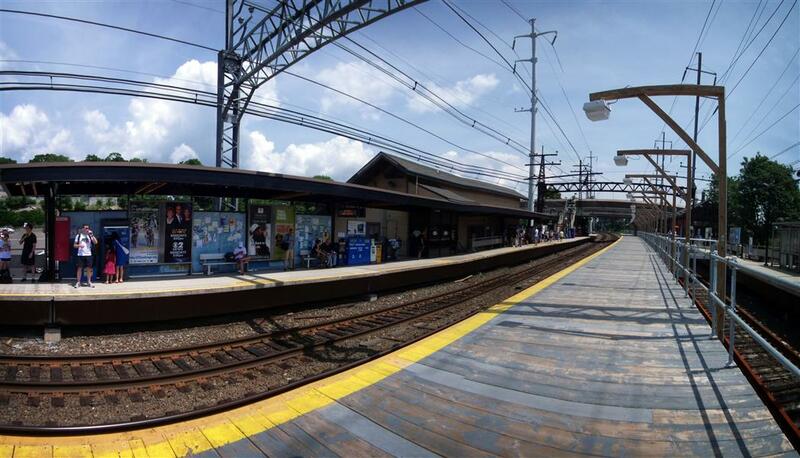 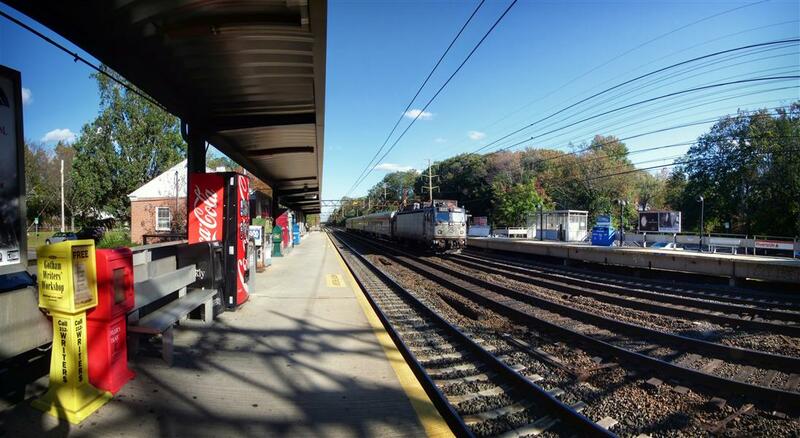 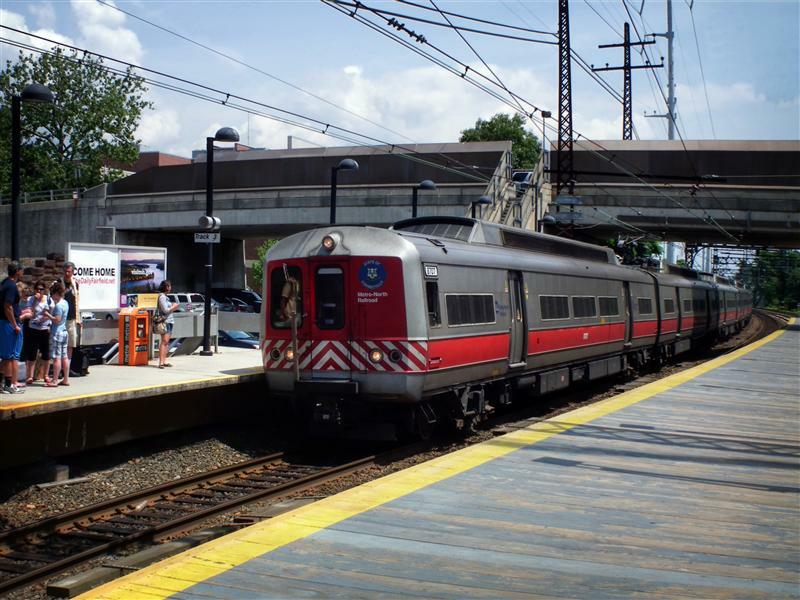 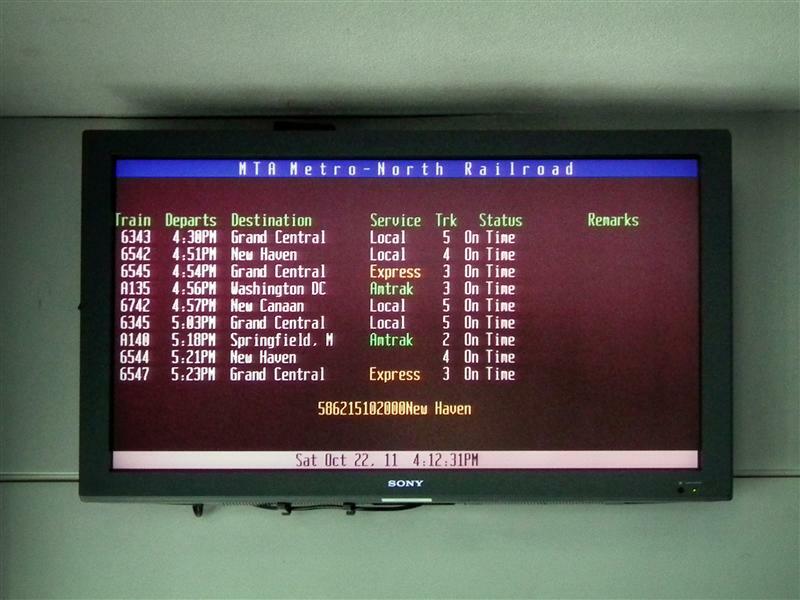 The station services both Metro-North passengers, as well as Amtrak passengers on the Northeast Regional. 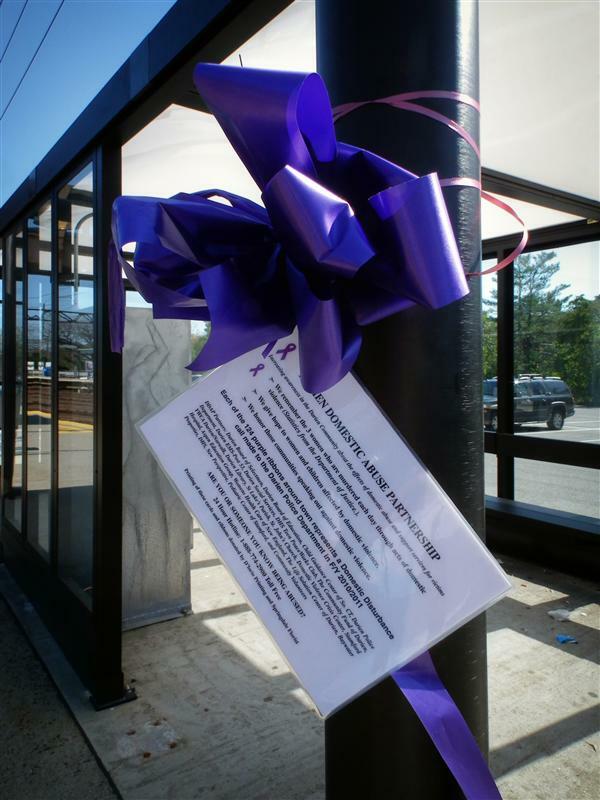 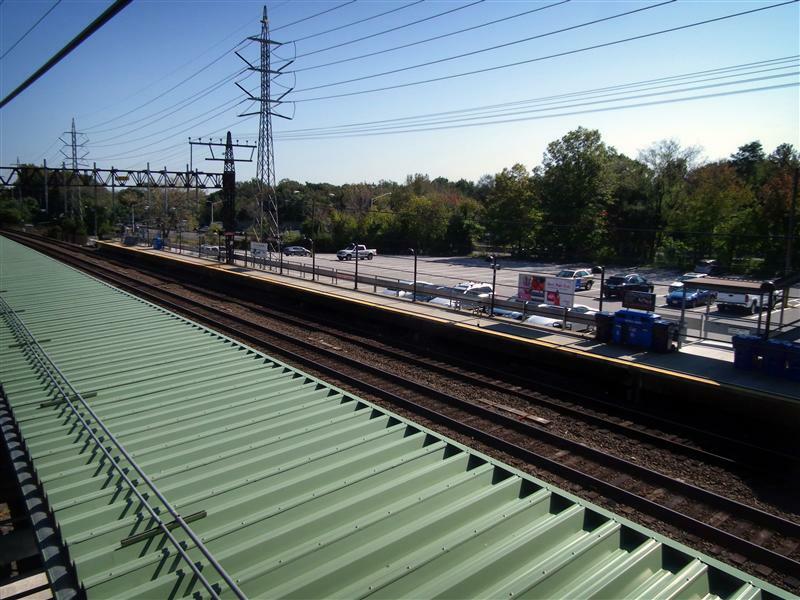 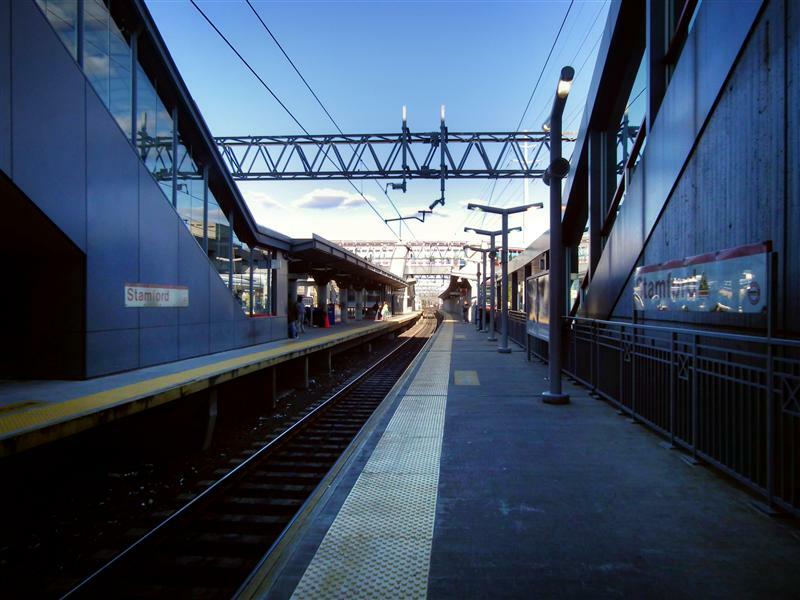 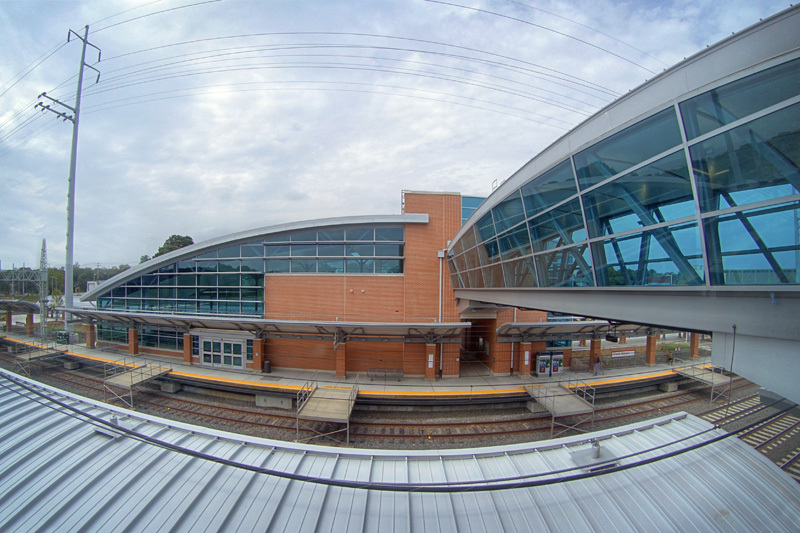 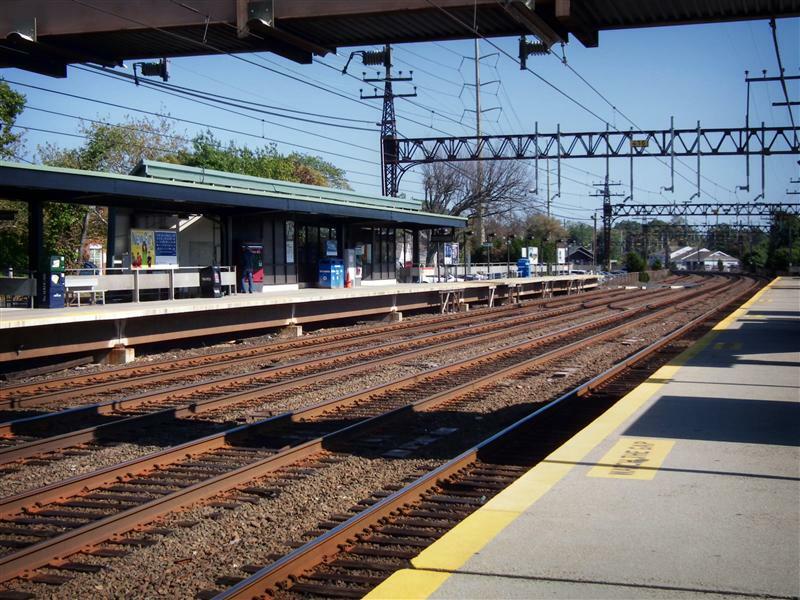 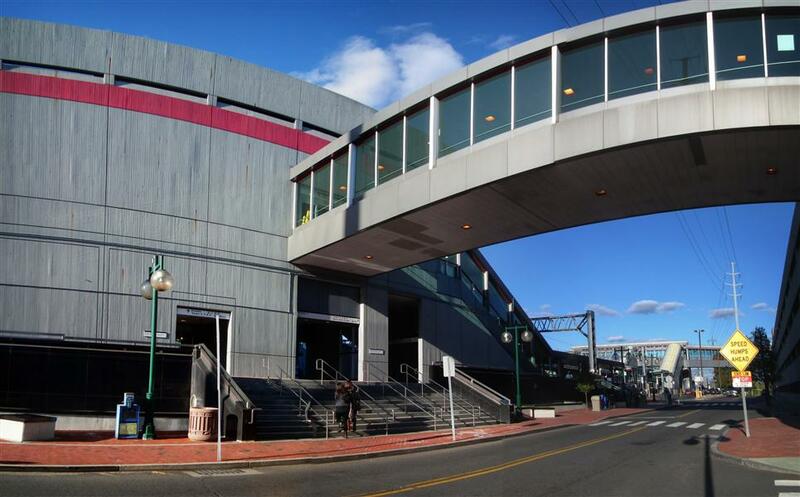 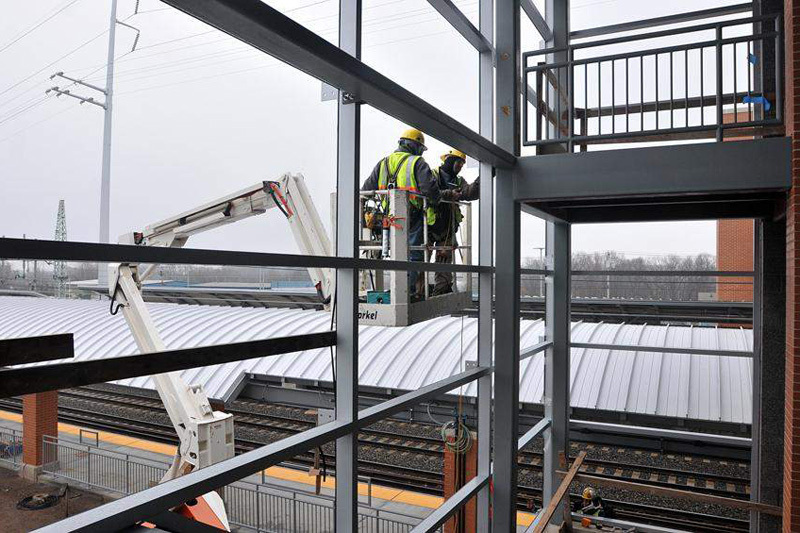 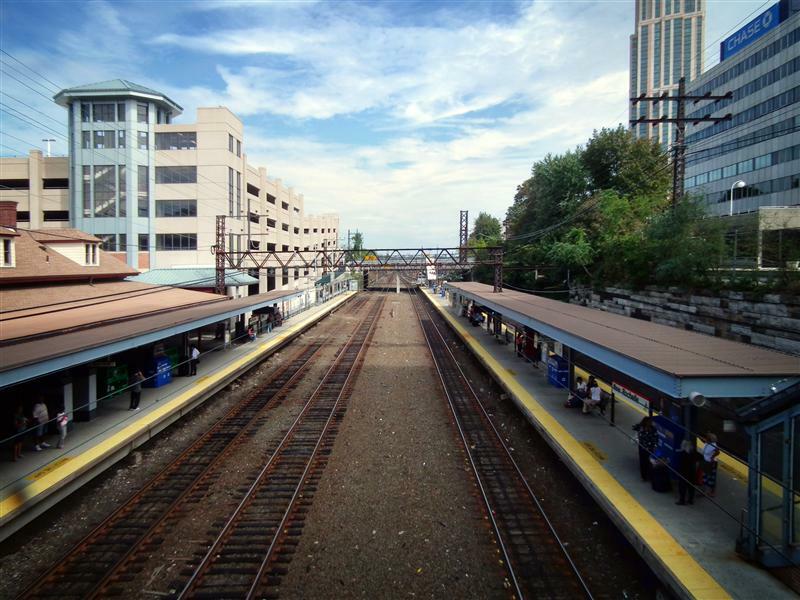 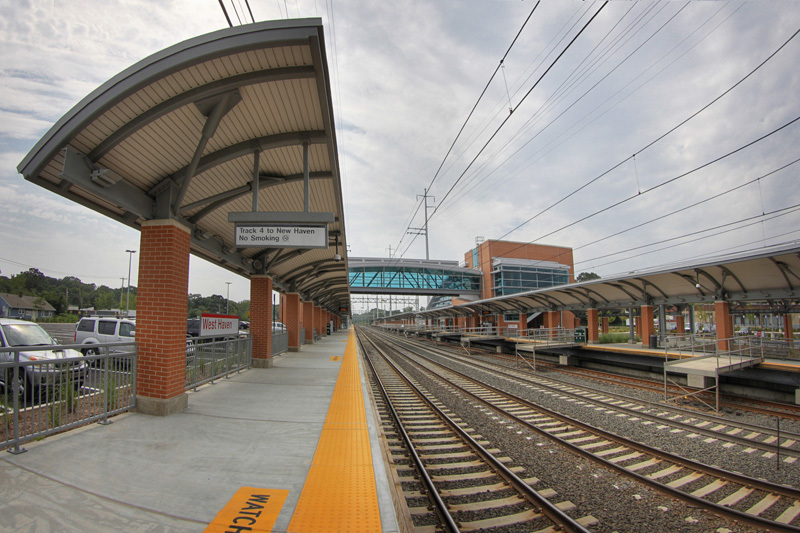 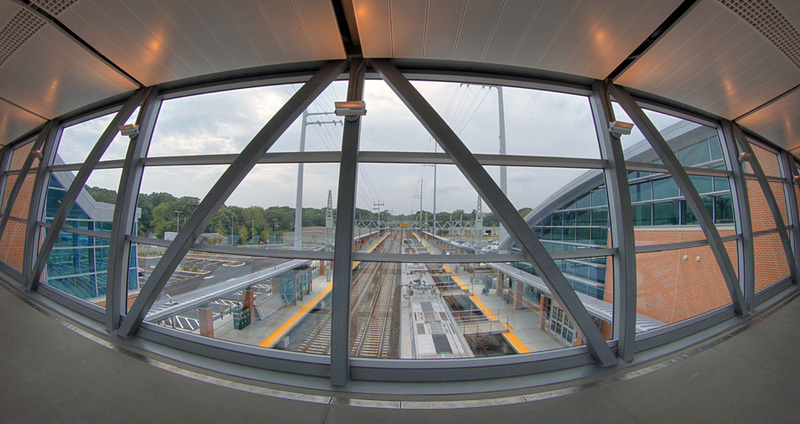 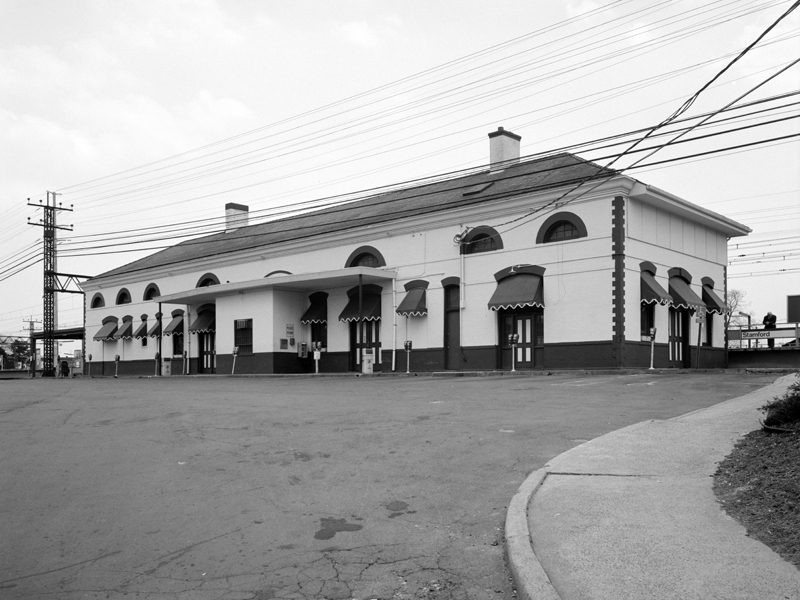 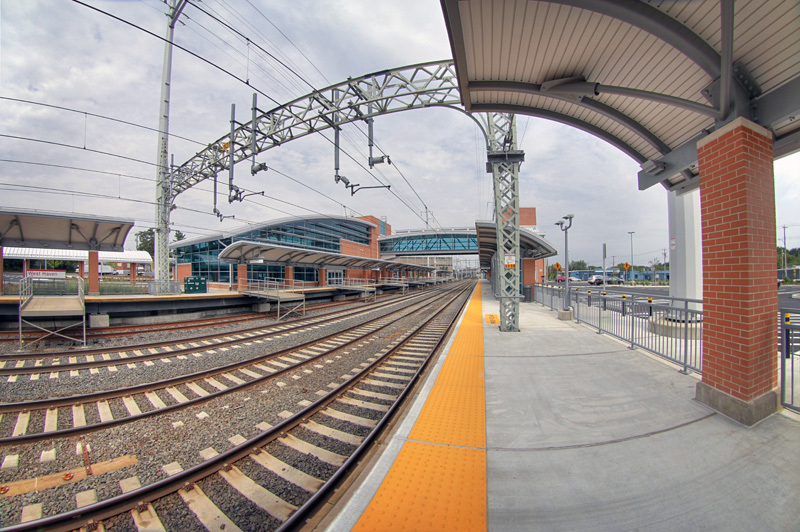 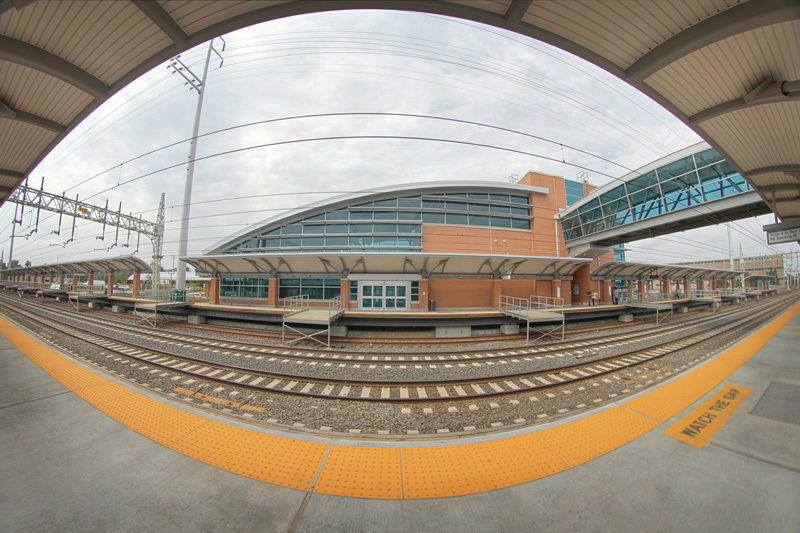 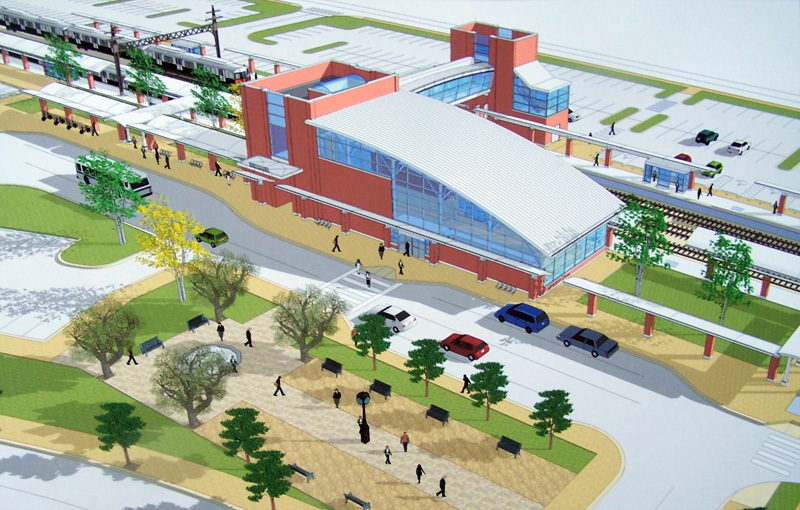 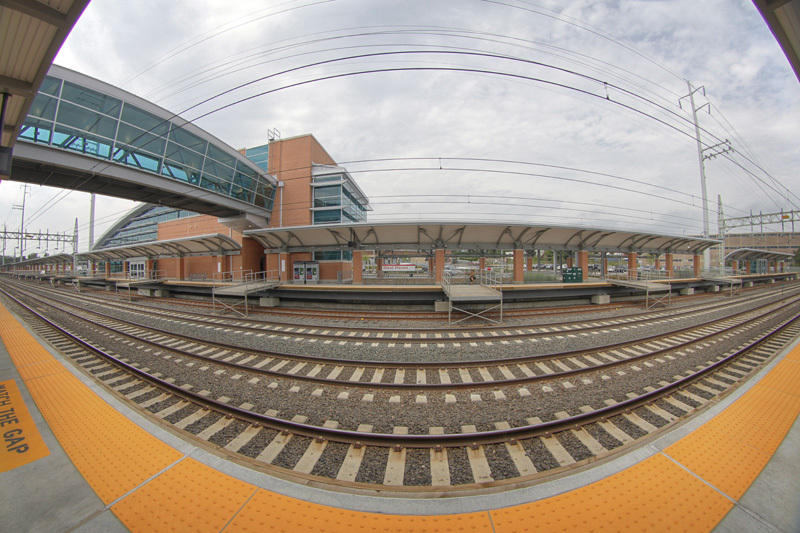 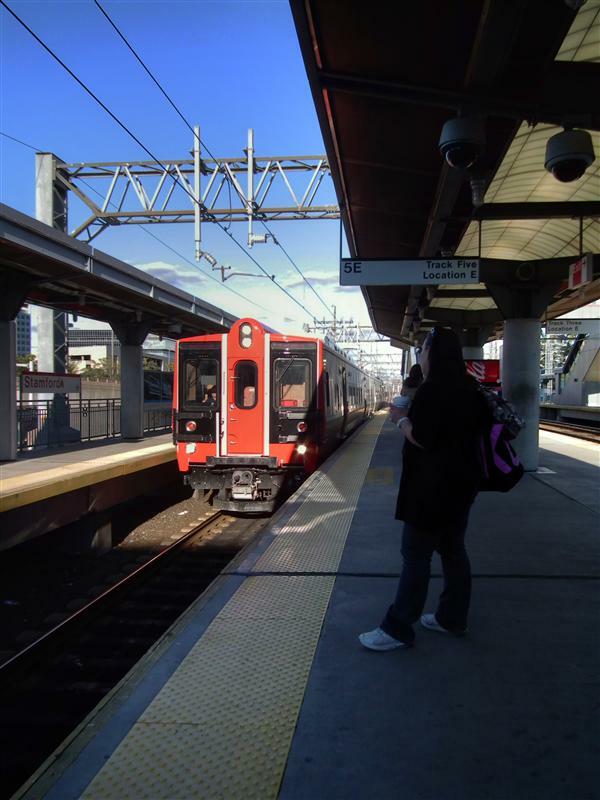 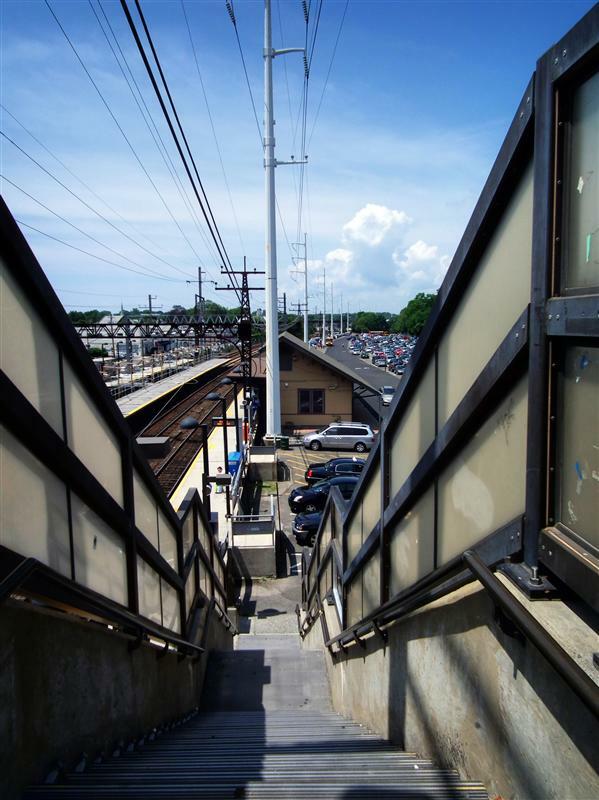 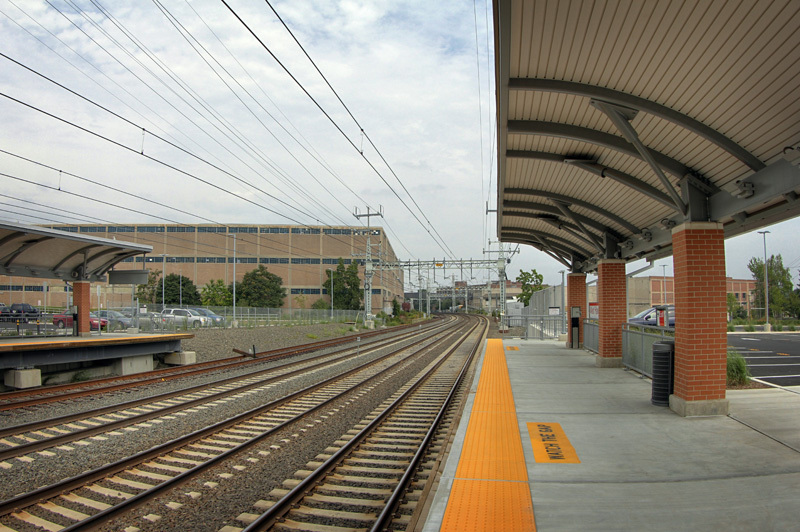 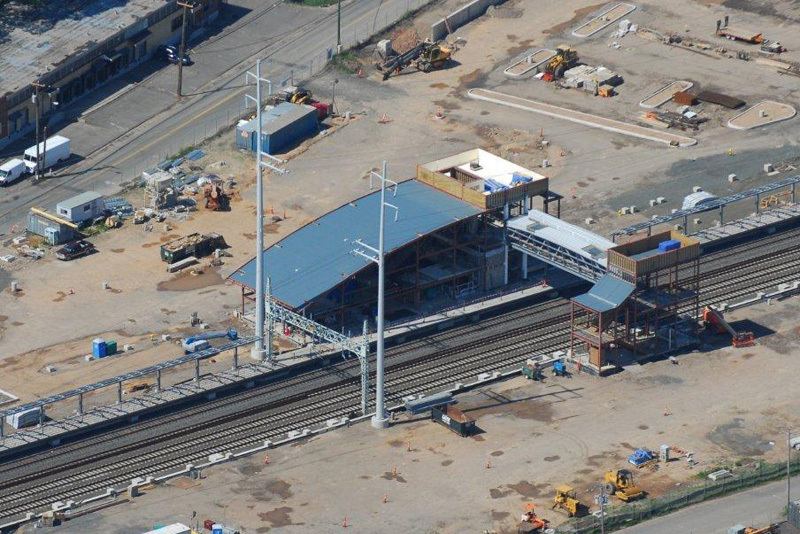 The station is part of New Rochelle’s “transportation center” with connections available to taxis and Bee-Line buses, and a large parking garage available for commuters. 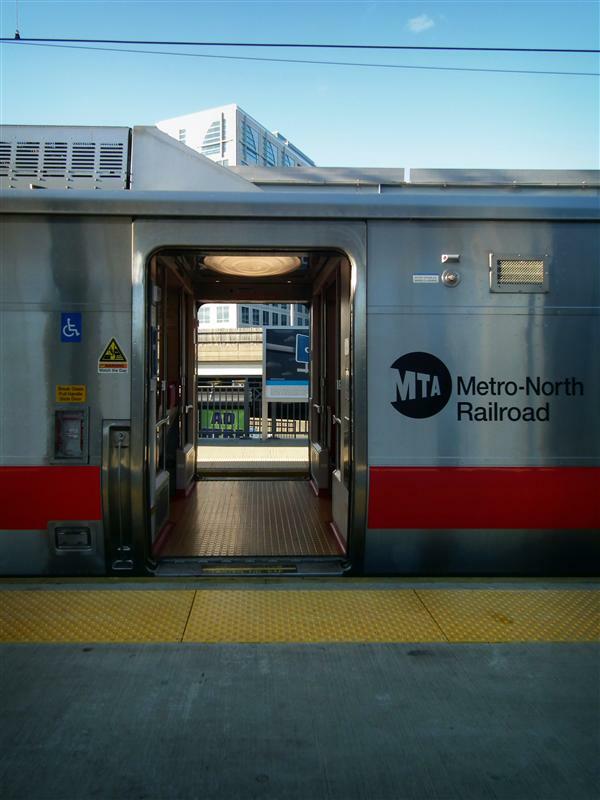 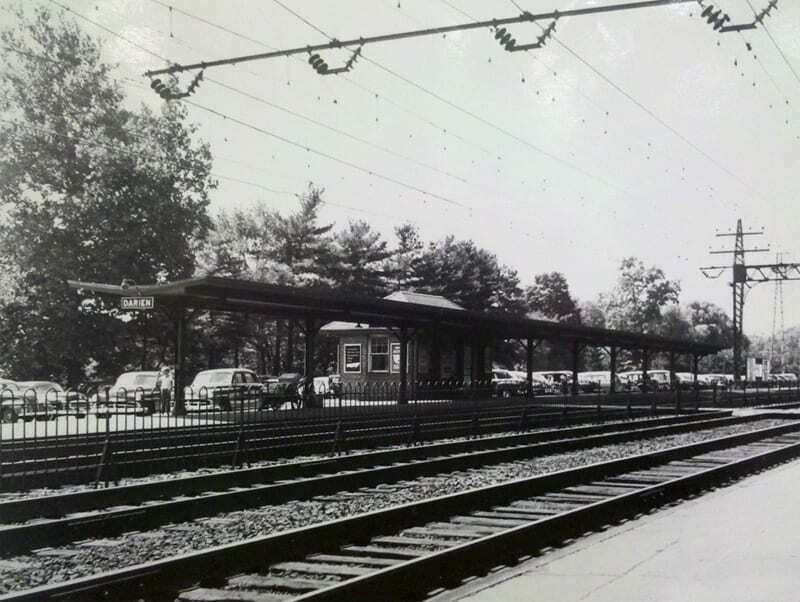 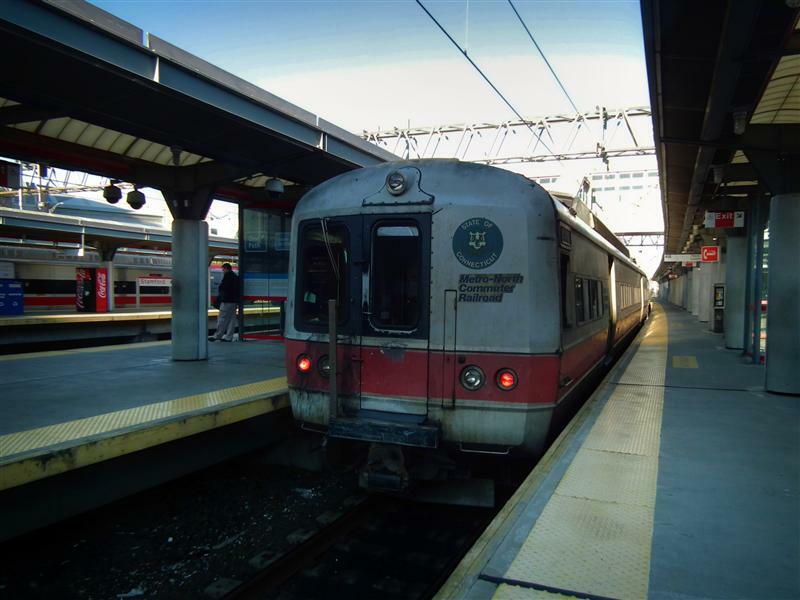 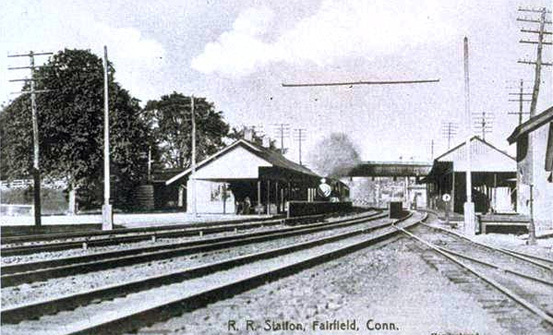 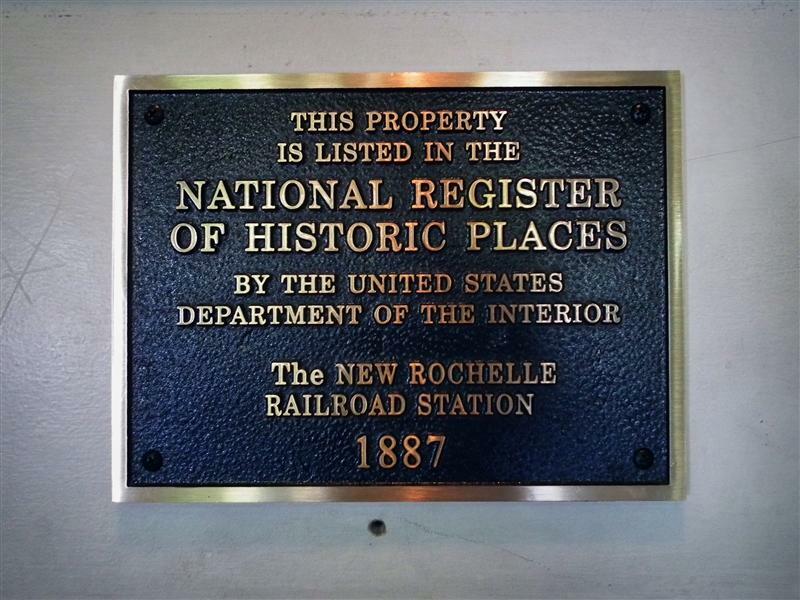 The very first scheduled train from New Rochelle to the city ran on December 28th, 1848. 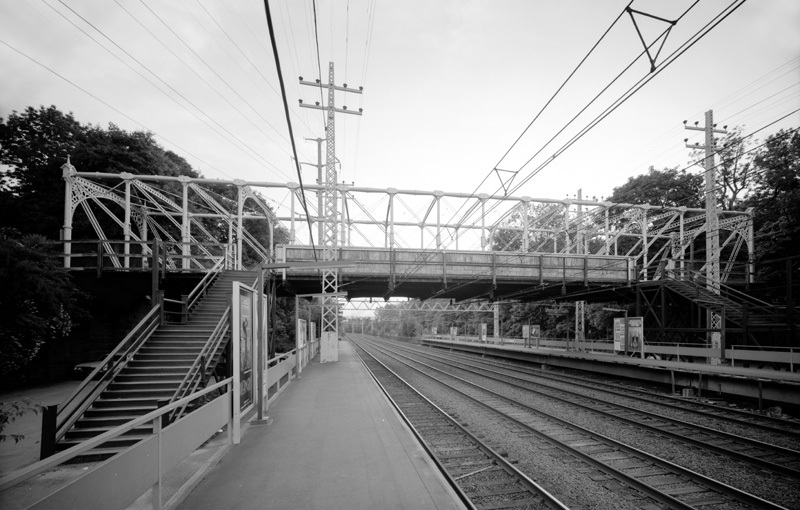 At that time there was only a single track here. 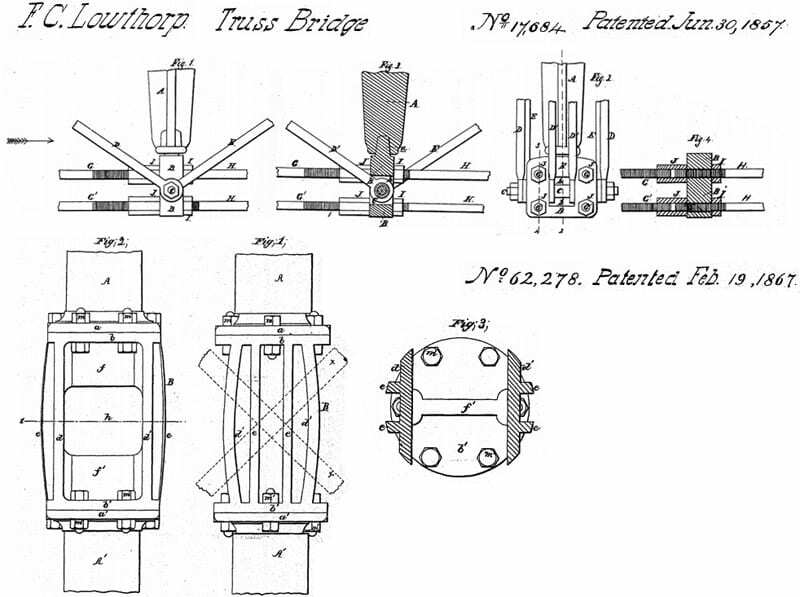 A second track was later added in 1853. 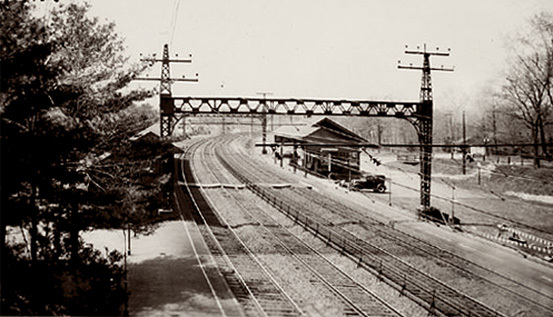 By 1869 there were 6 trains daily that ran to and from New Rochelle and the city. 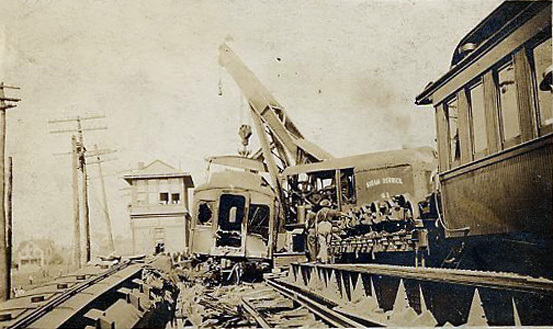 Rescue operations after the Park Avenue Tunnel crash in 1902. 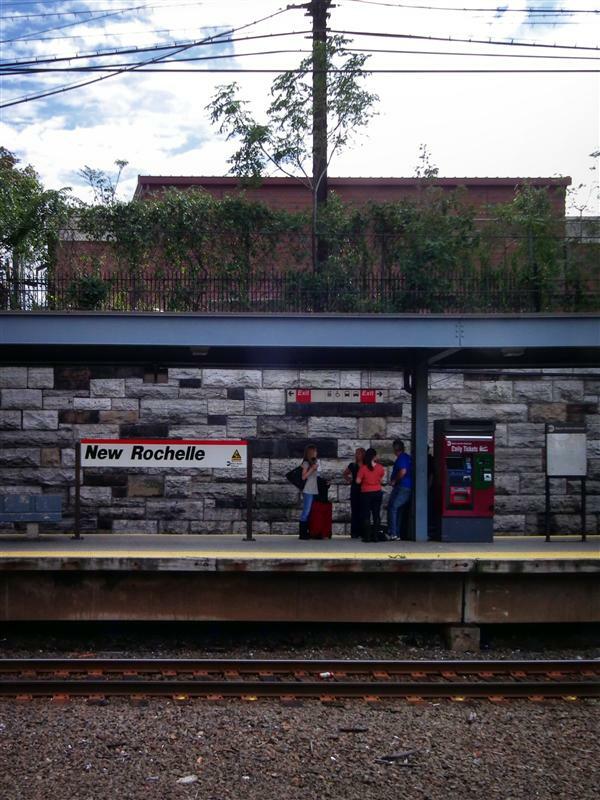 All of those killed boarded at New Rochelle. At the time of the crash, steam trains were allowed in the tunnel, which made visibility very poor. 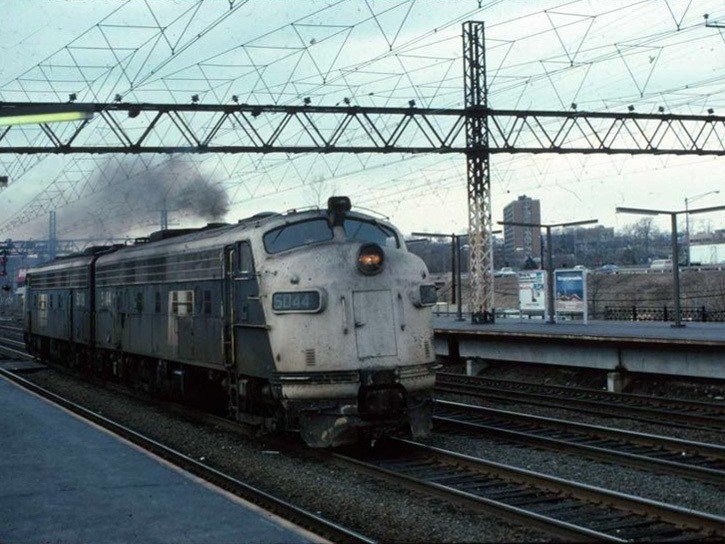 The incident significantly swayed public opinion against steam in the city, and ultimately led to their banning in Manhattan. 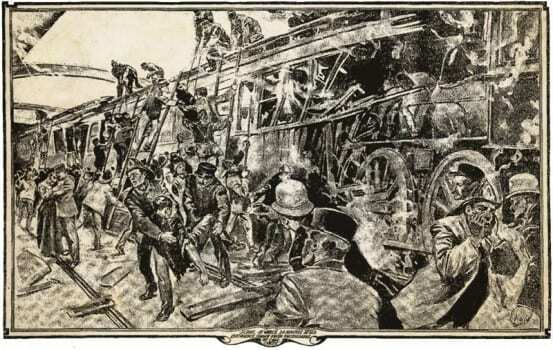 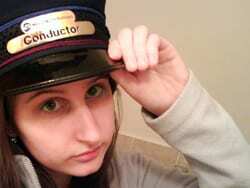 The railroads were left to find an alternate method of powering their trains into the city. 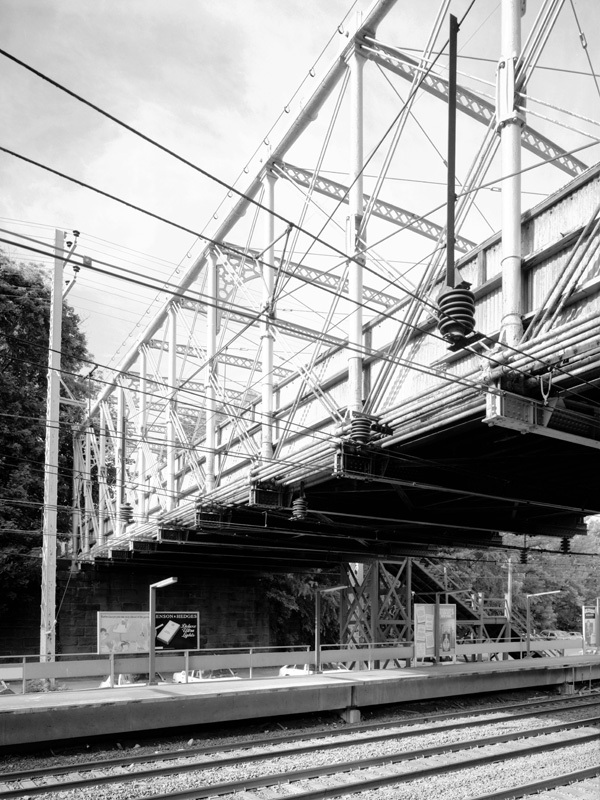 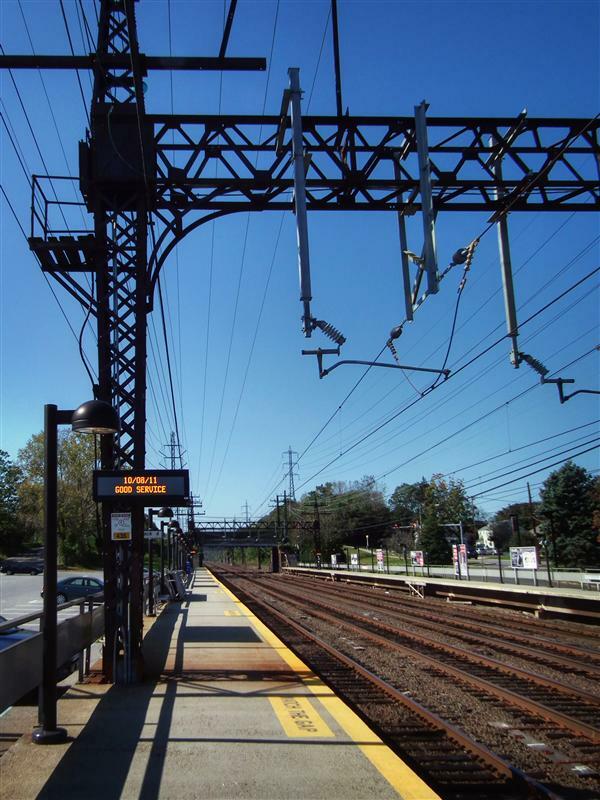 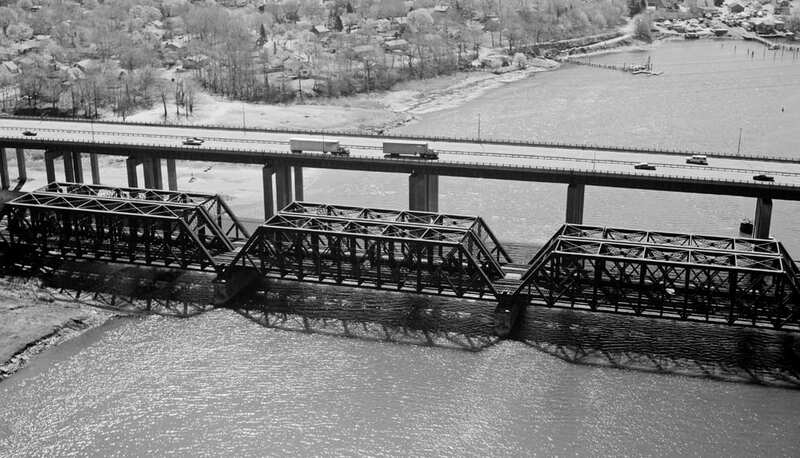 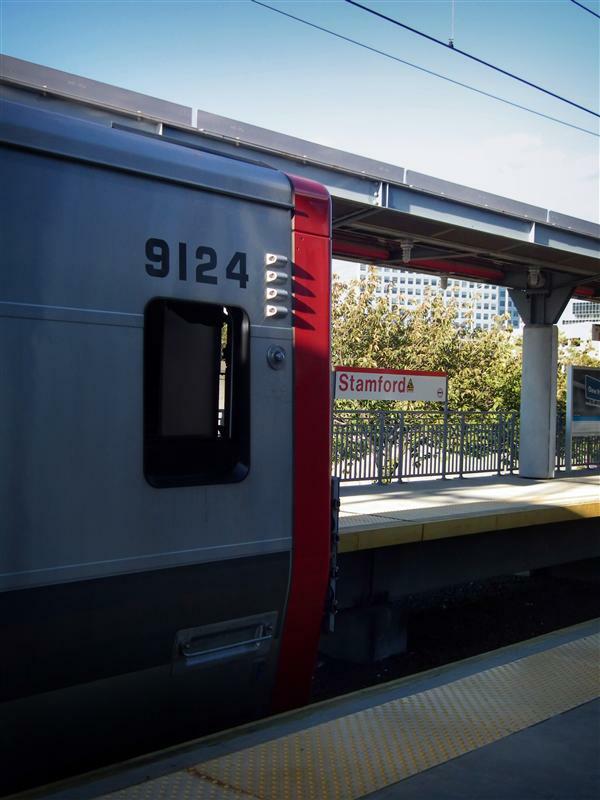 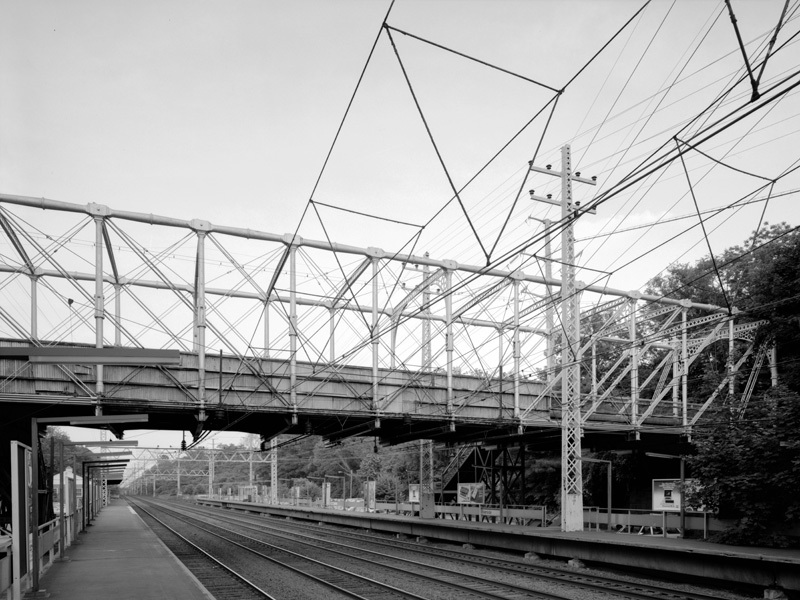 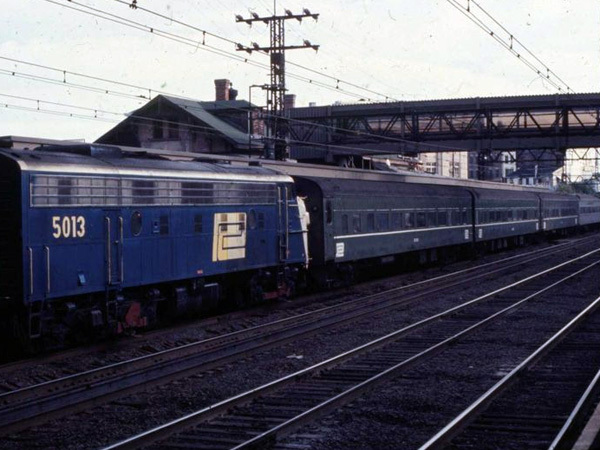 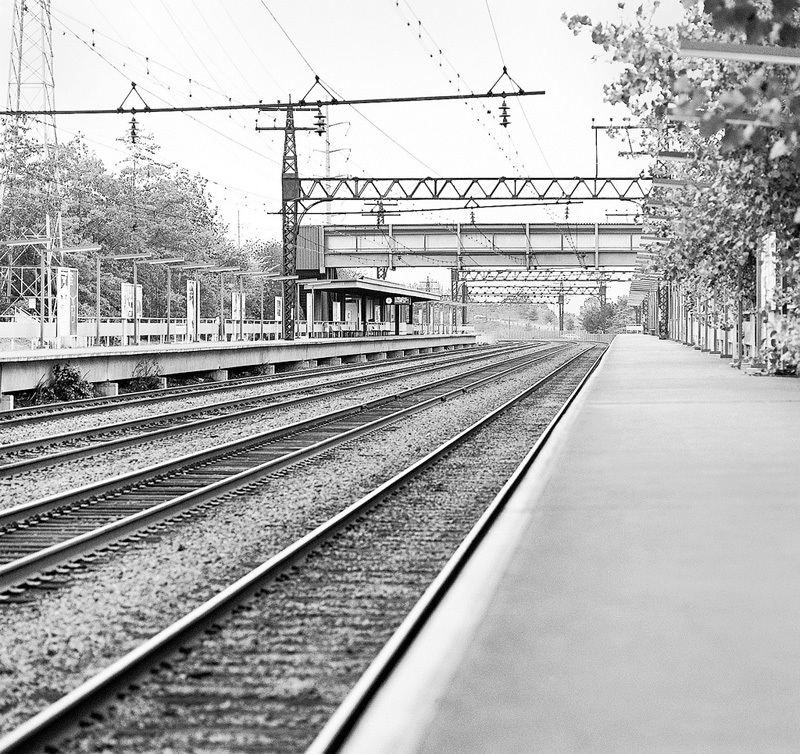 Frank Sprague and William Wilgus invented the “third rail” method of powering new electric trains – technology that is still in use today on the Harlem and Hudson Lines. 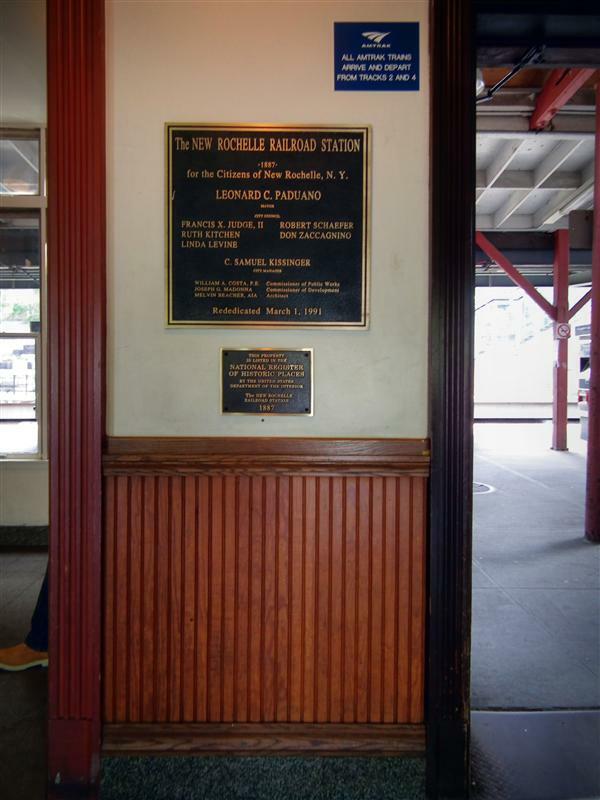 The most important change the crash brought about was the new Grand Central Terminal – a station built to accommodate these new electric trains. 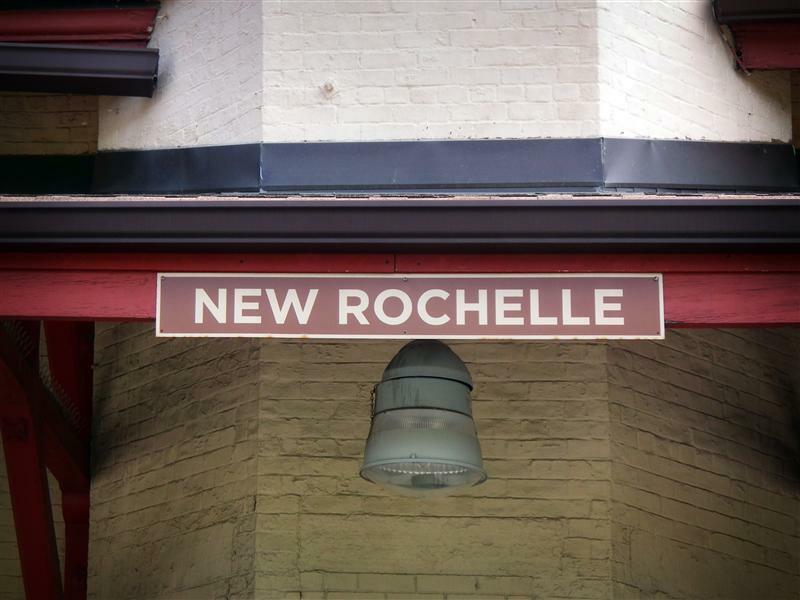 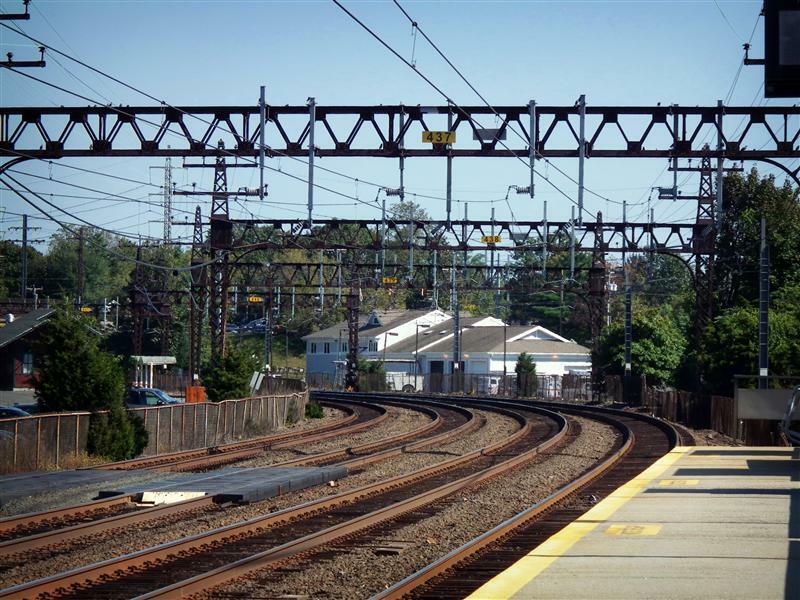 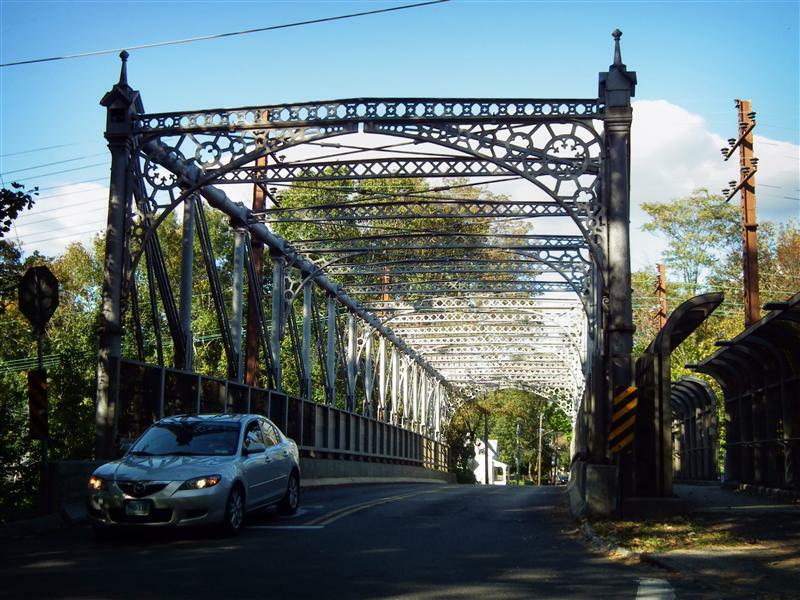 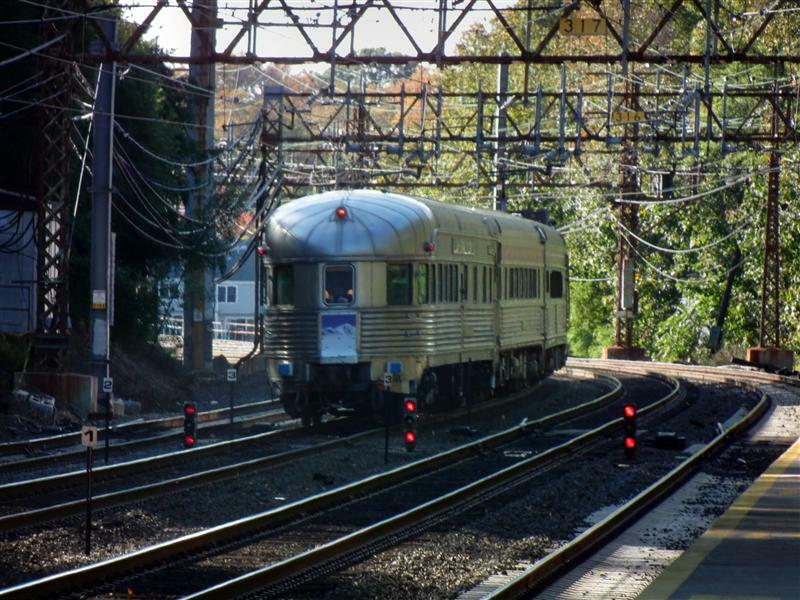 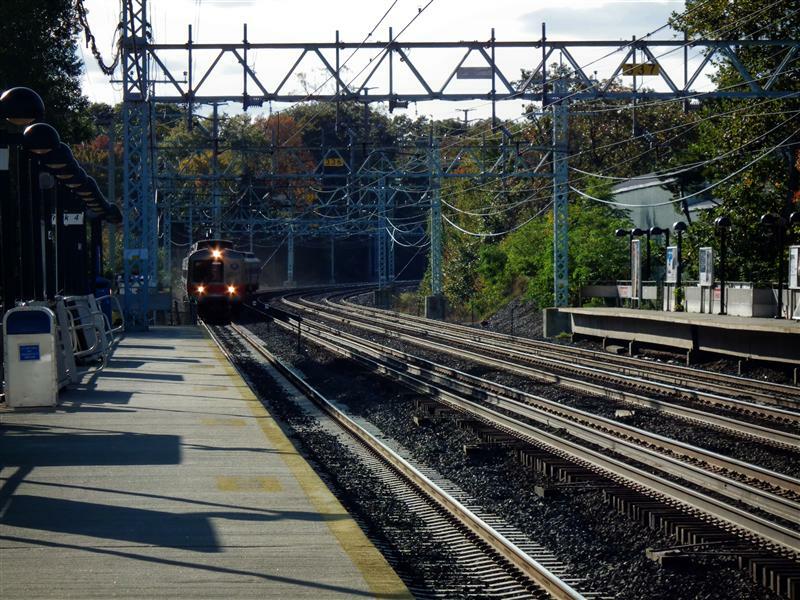 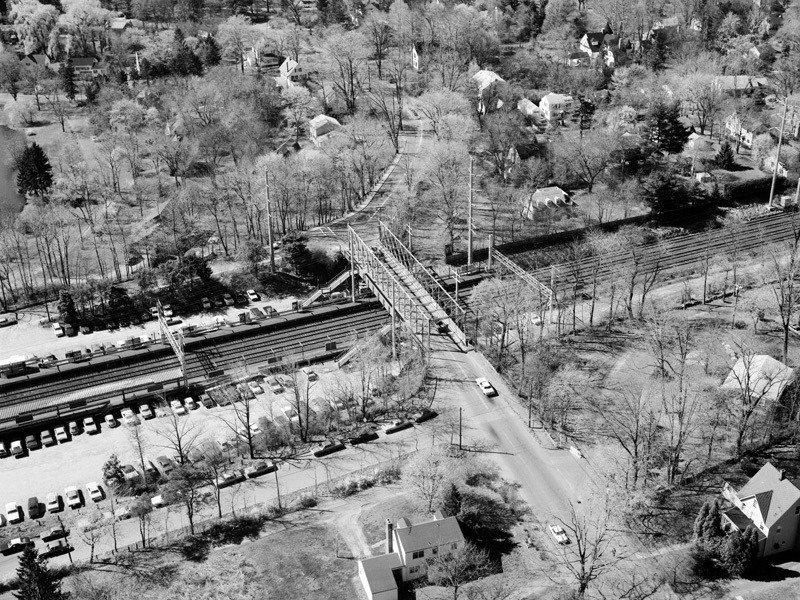 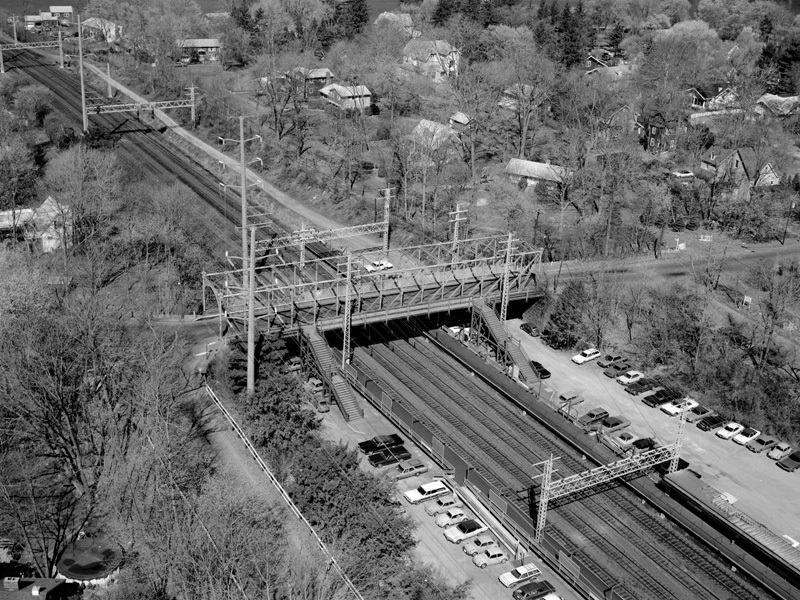 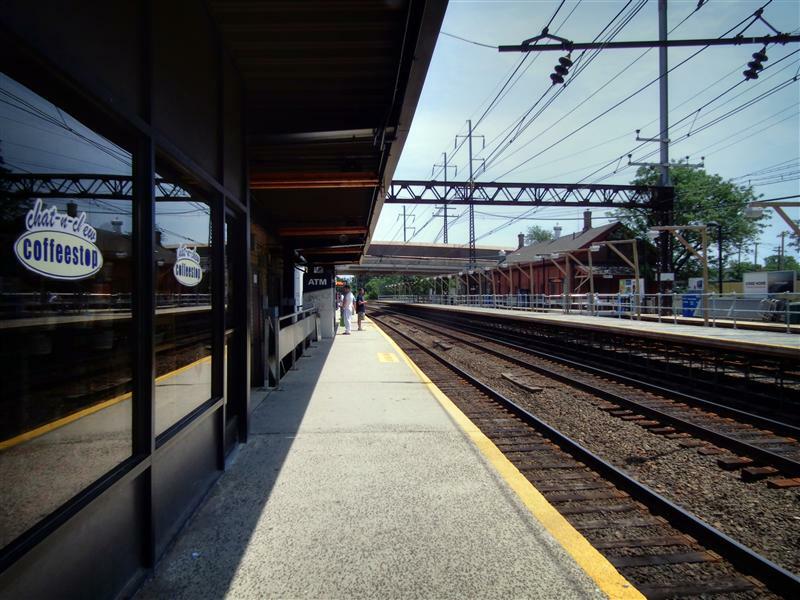 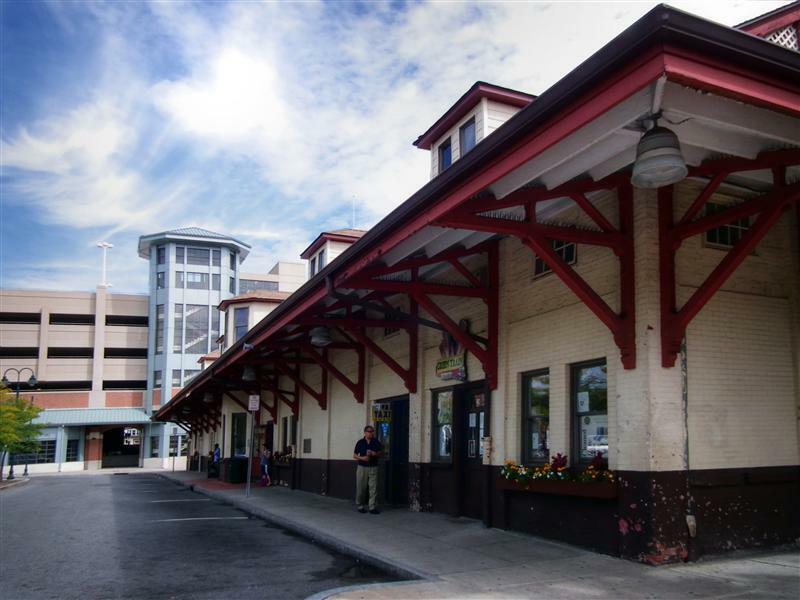 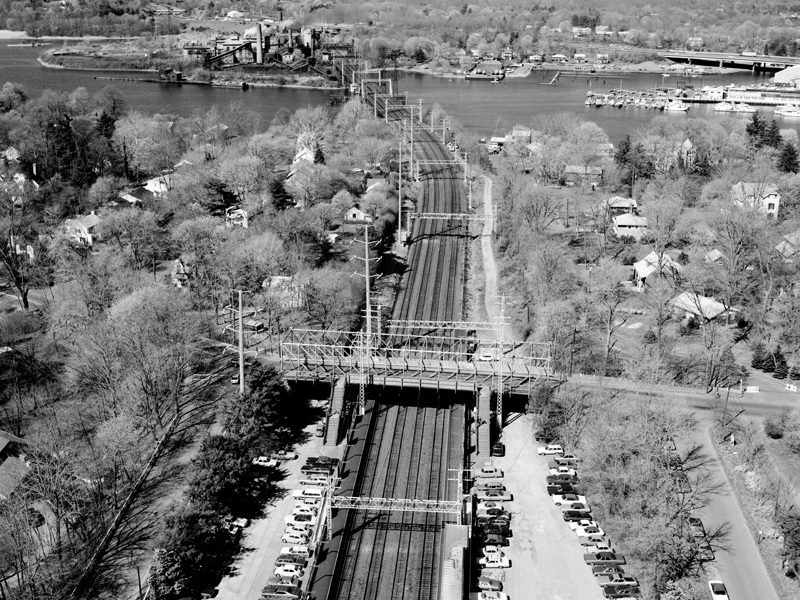 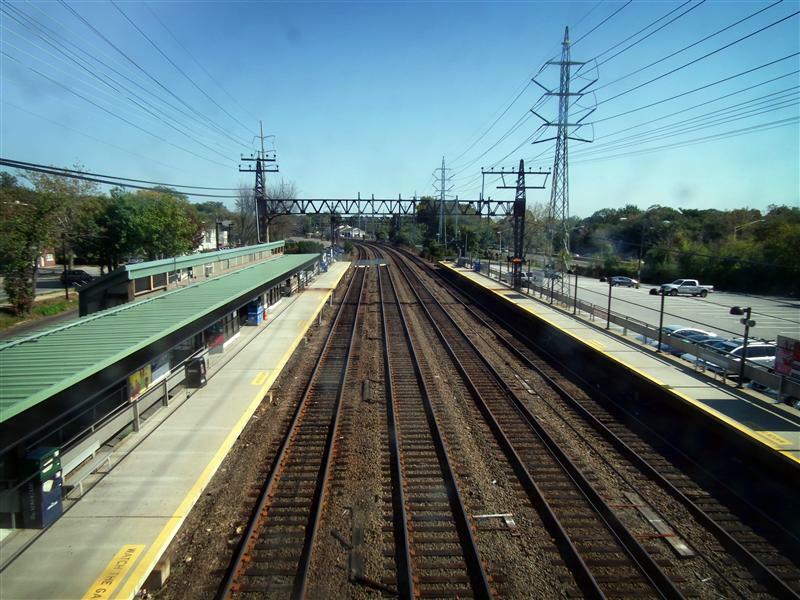 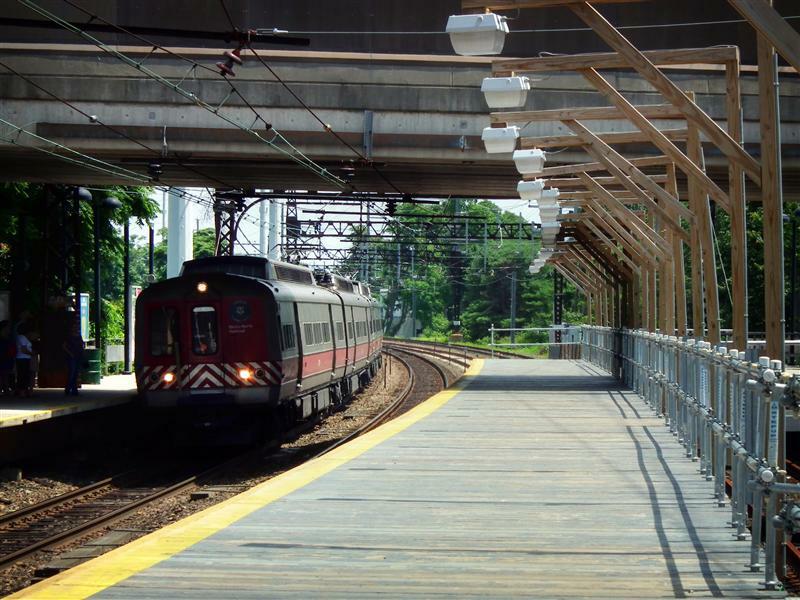 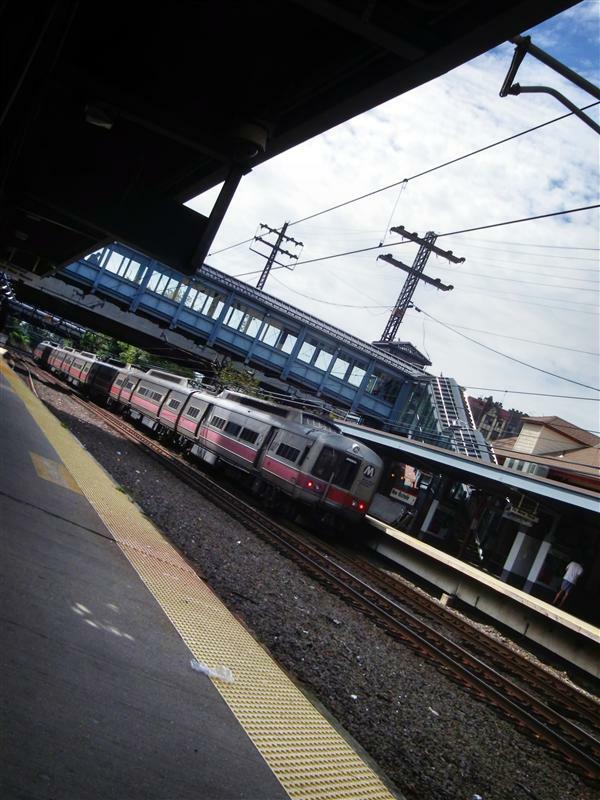 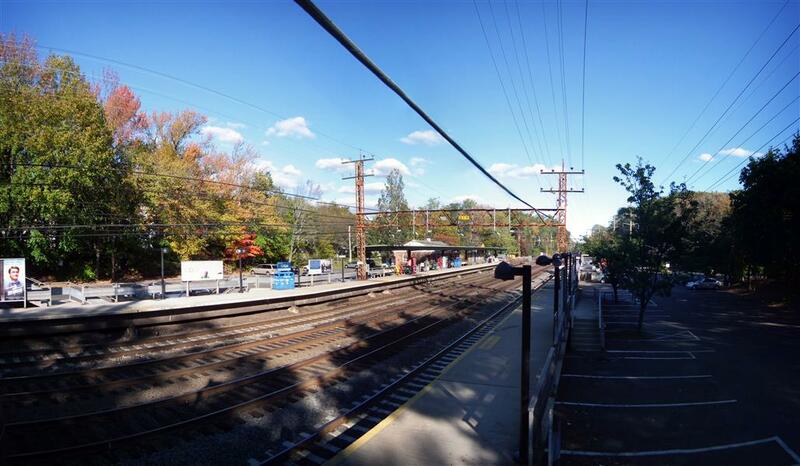 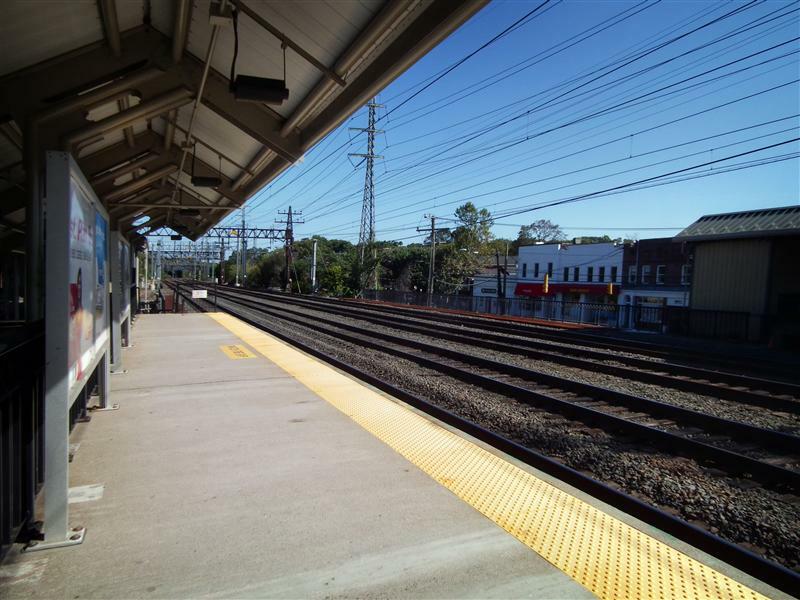 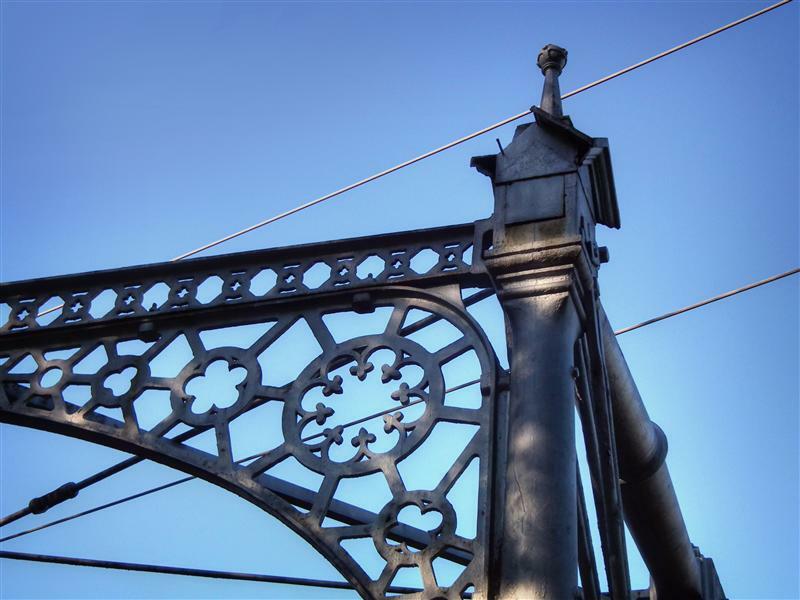 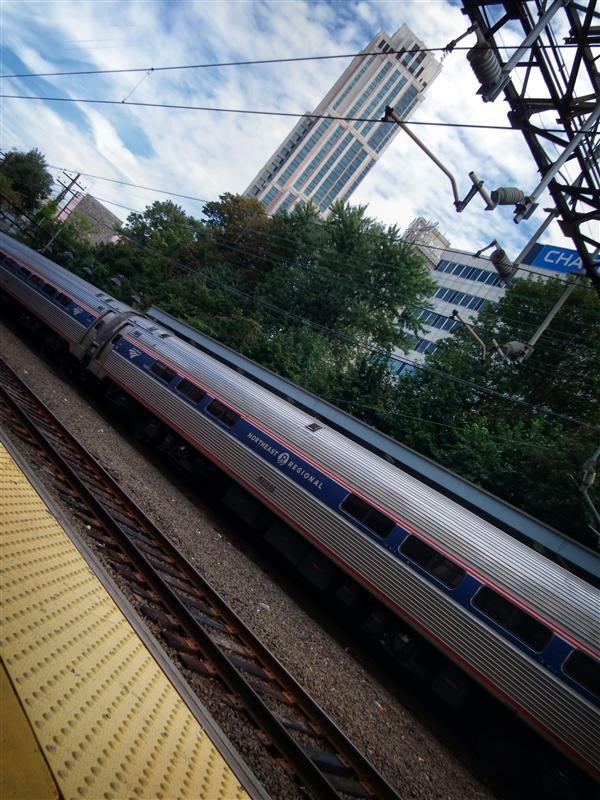 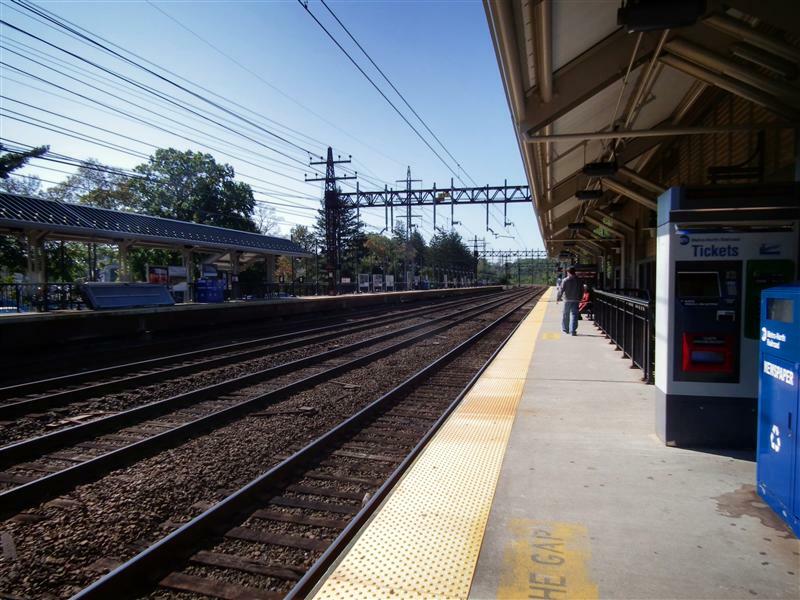 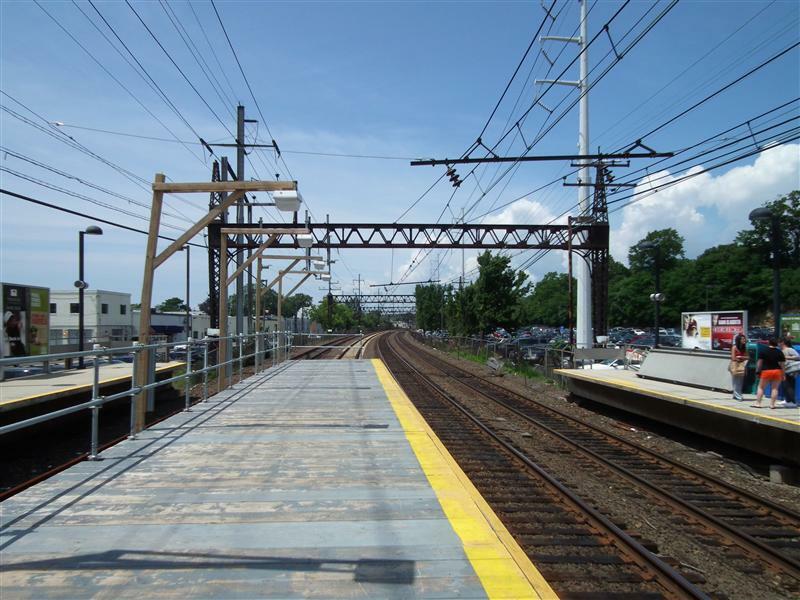 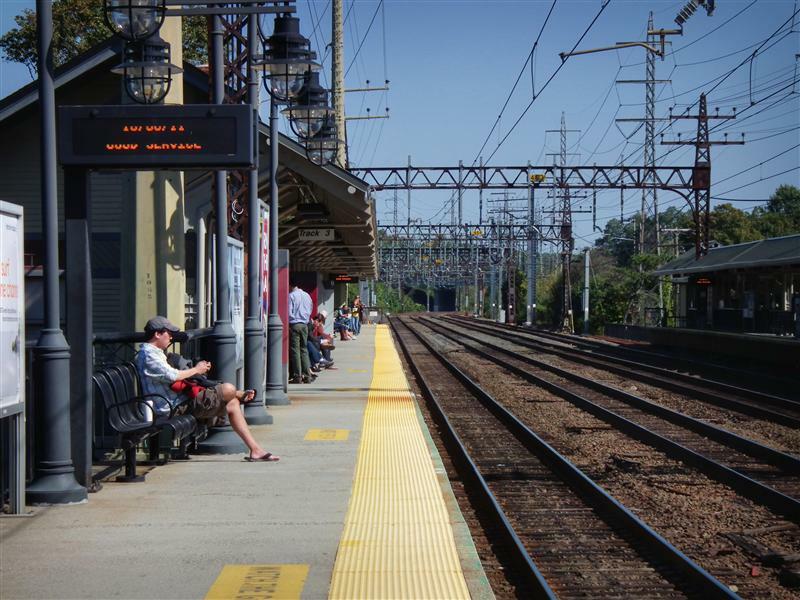 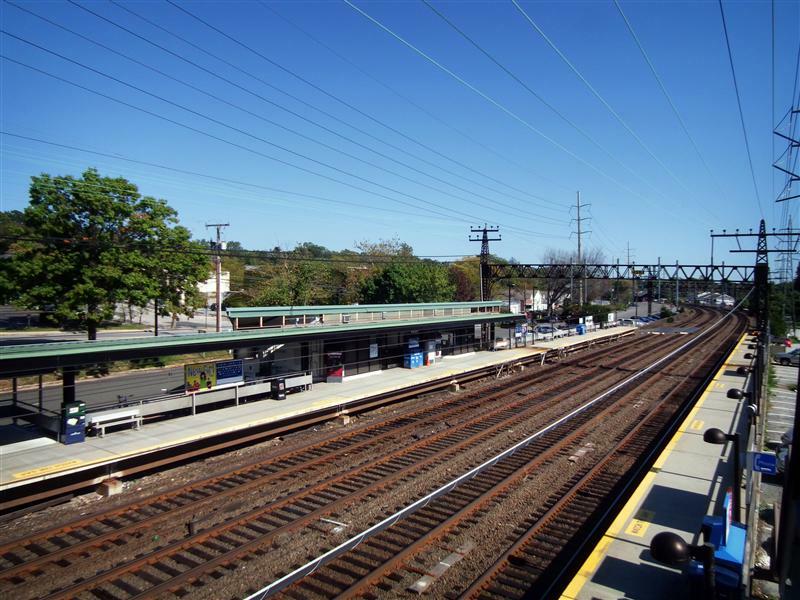 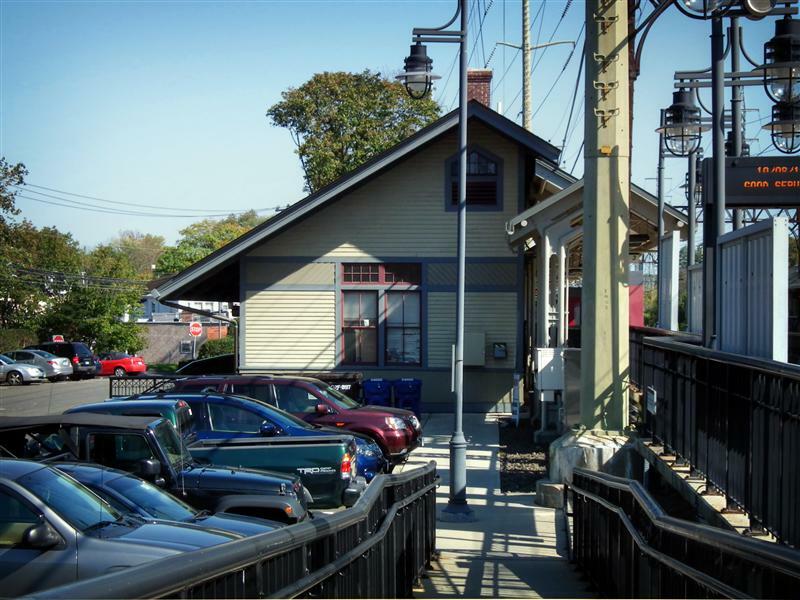 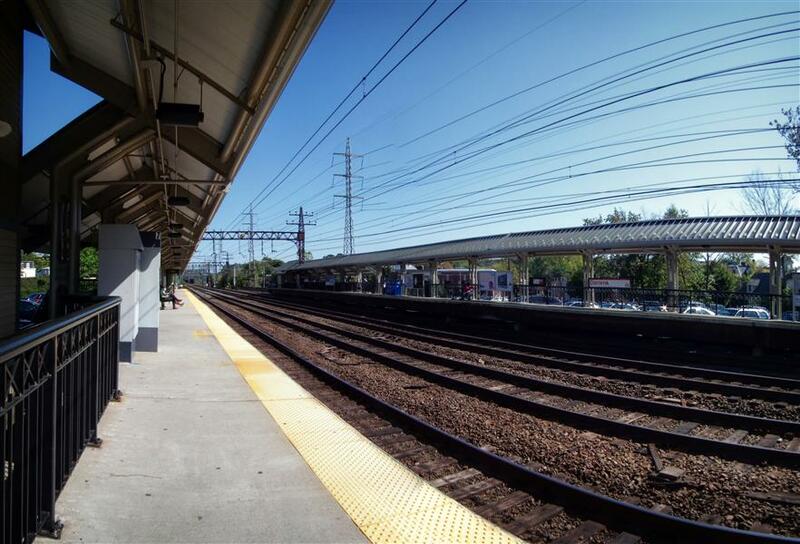 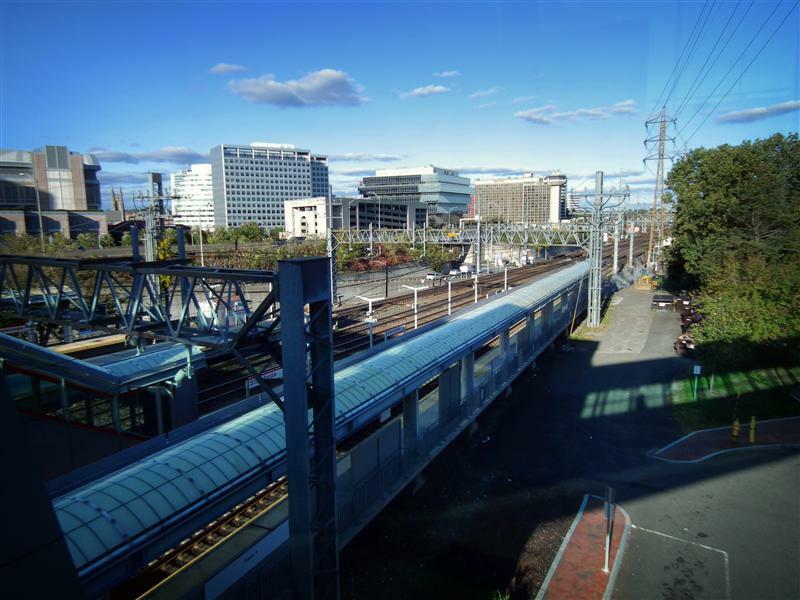 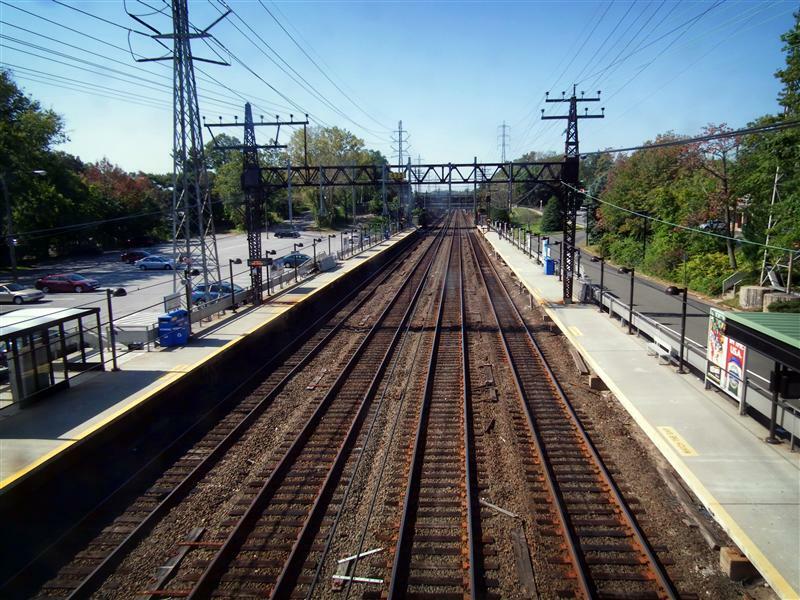 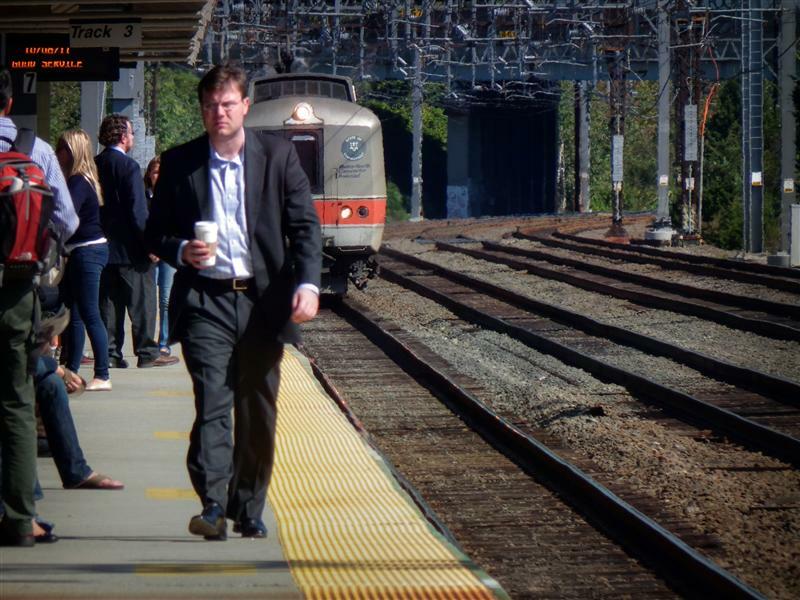 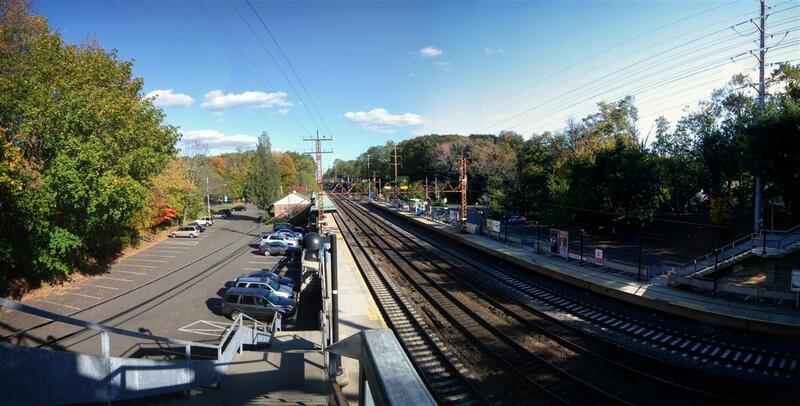 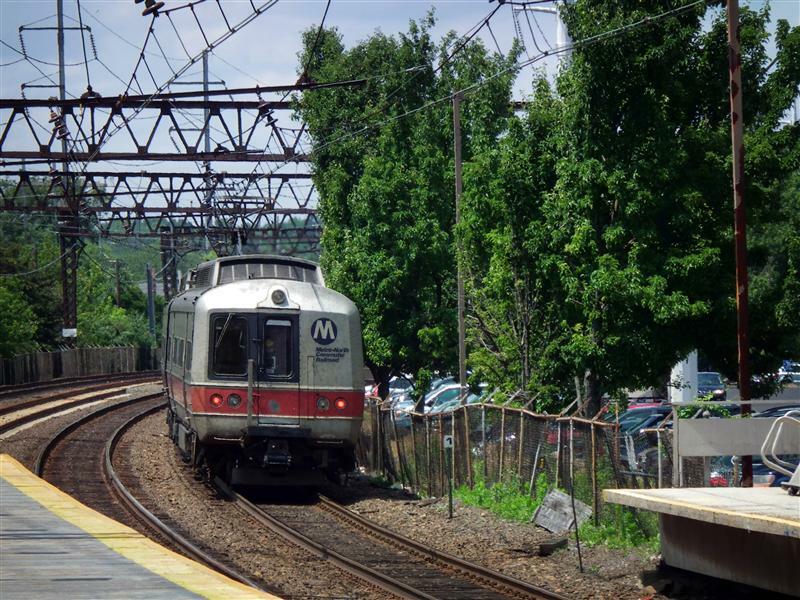 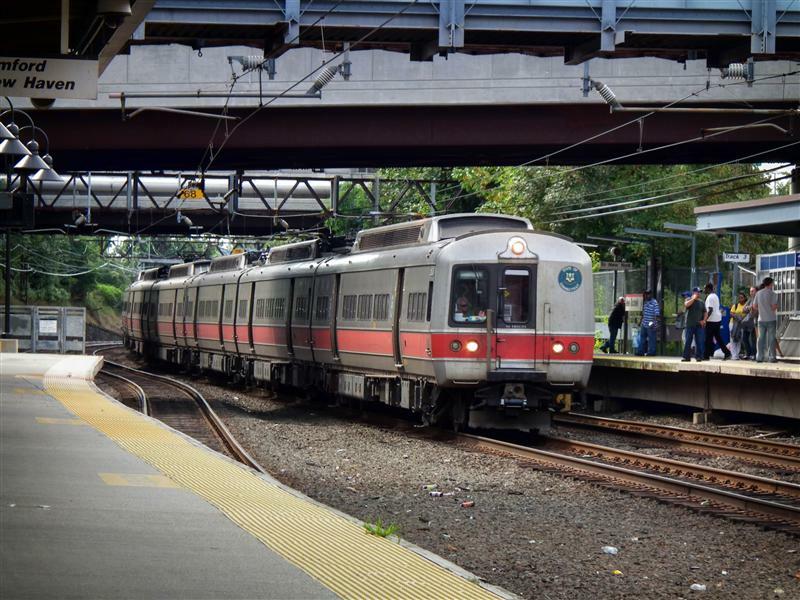 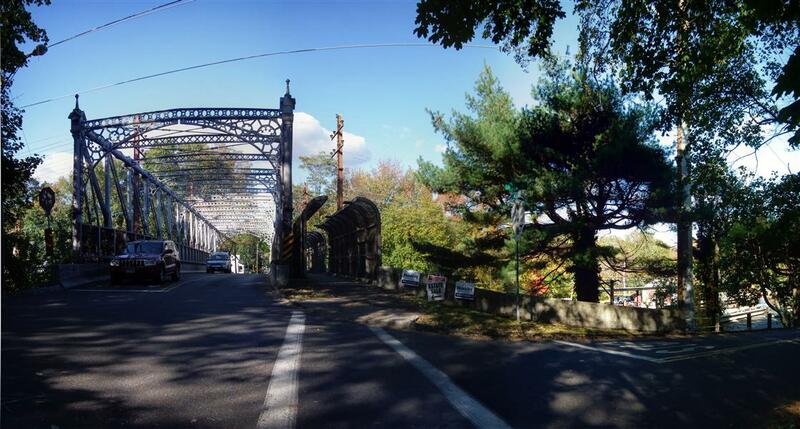 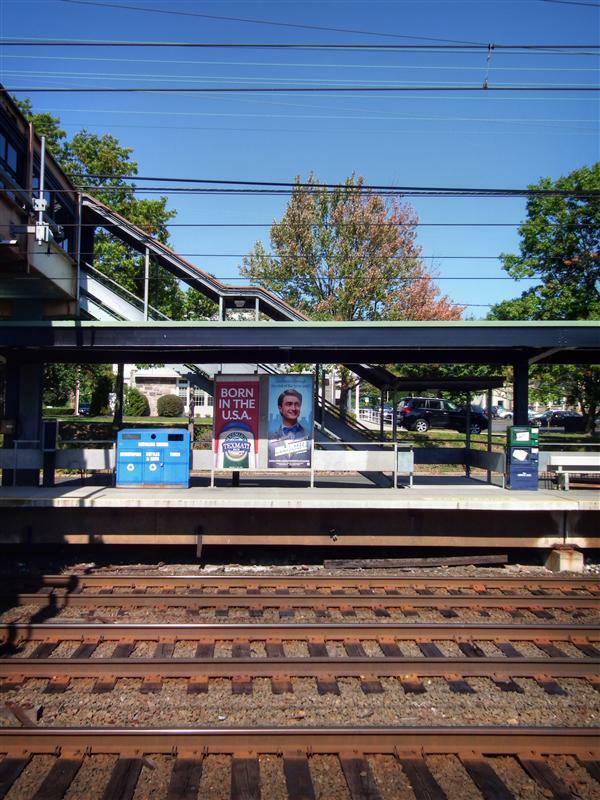 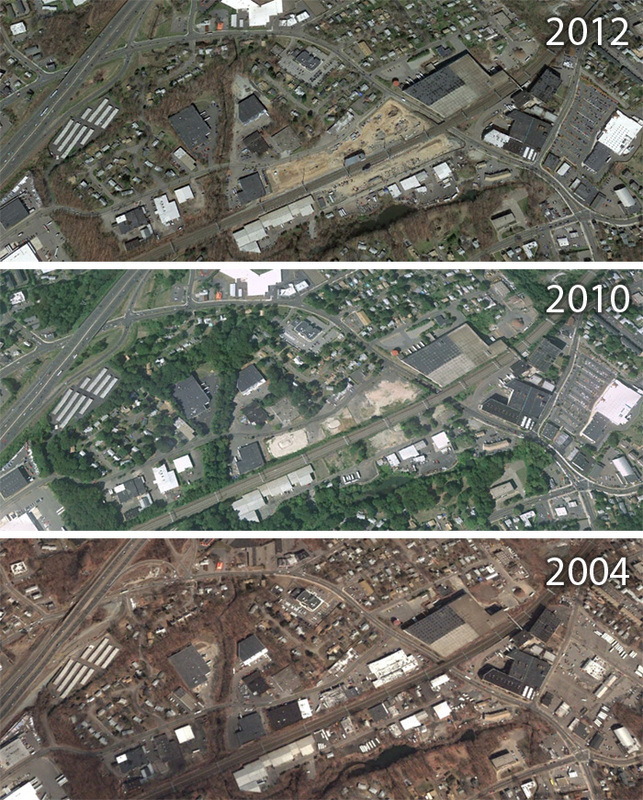 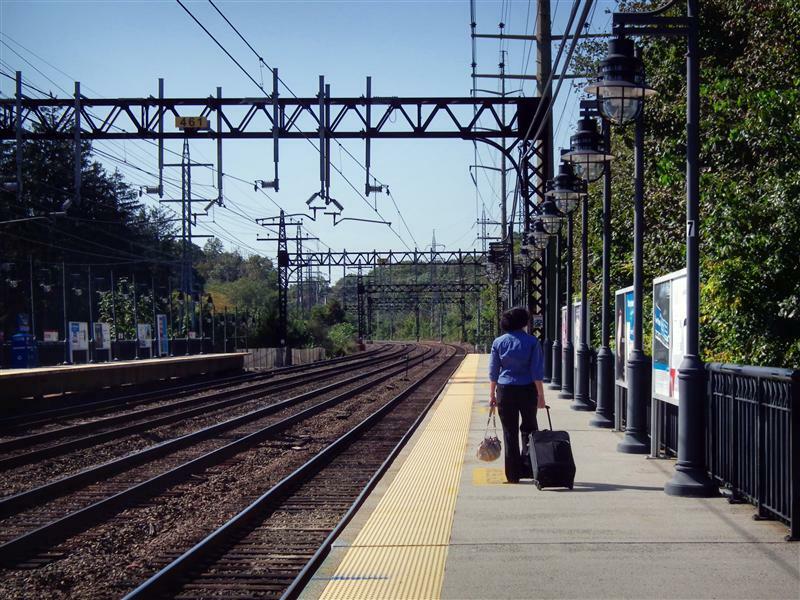 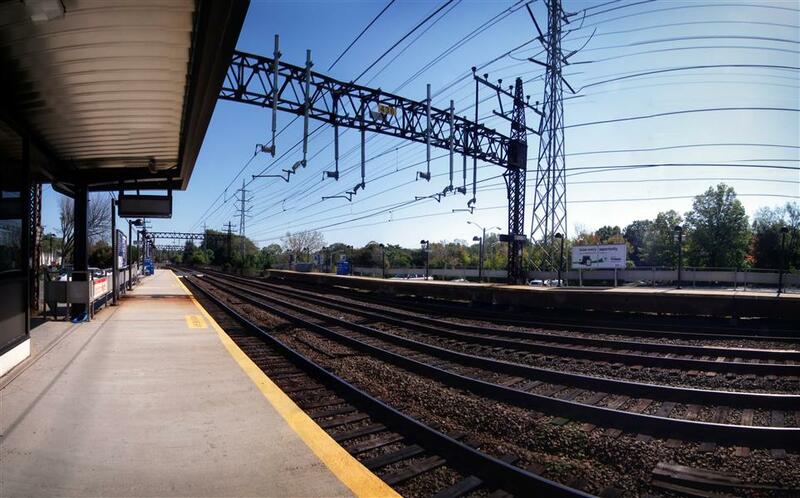 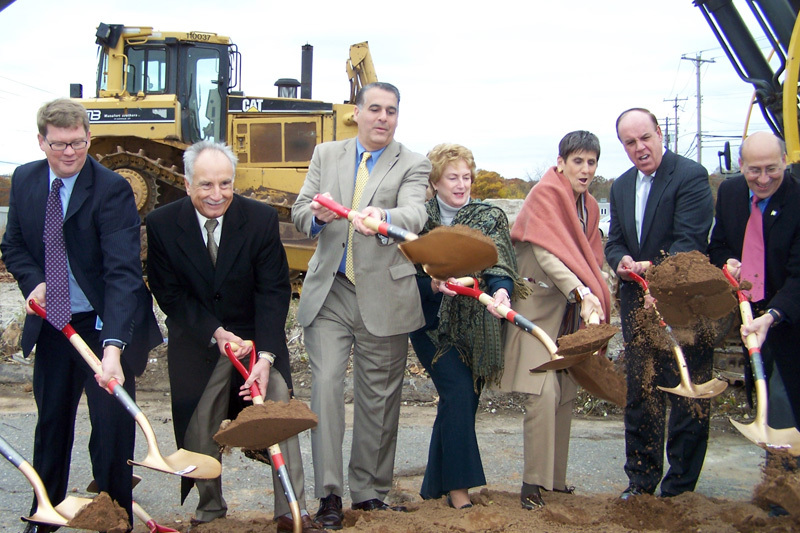 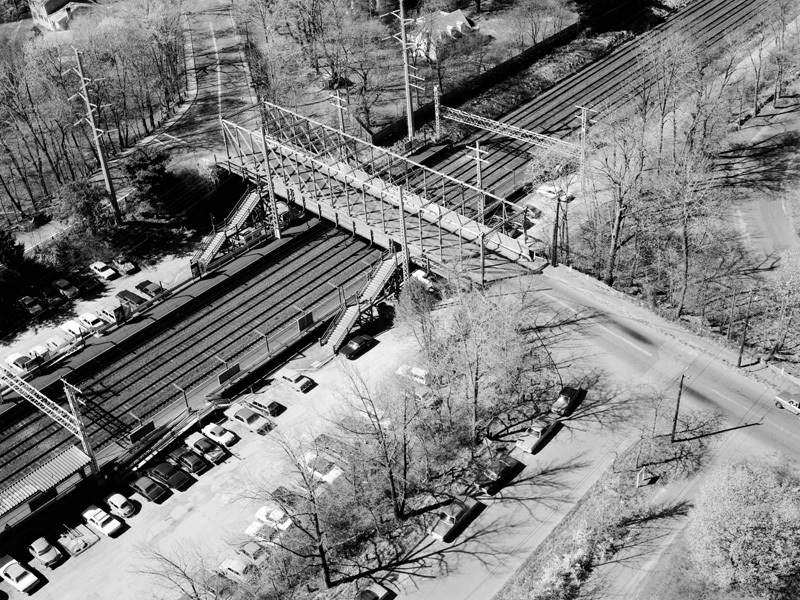 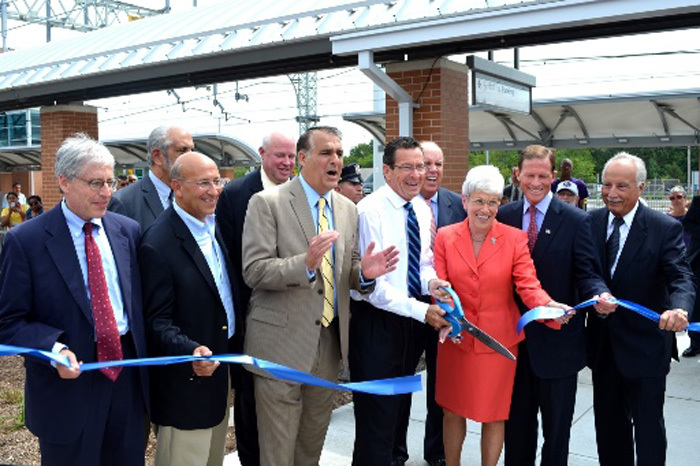 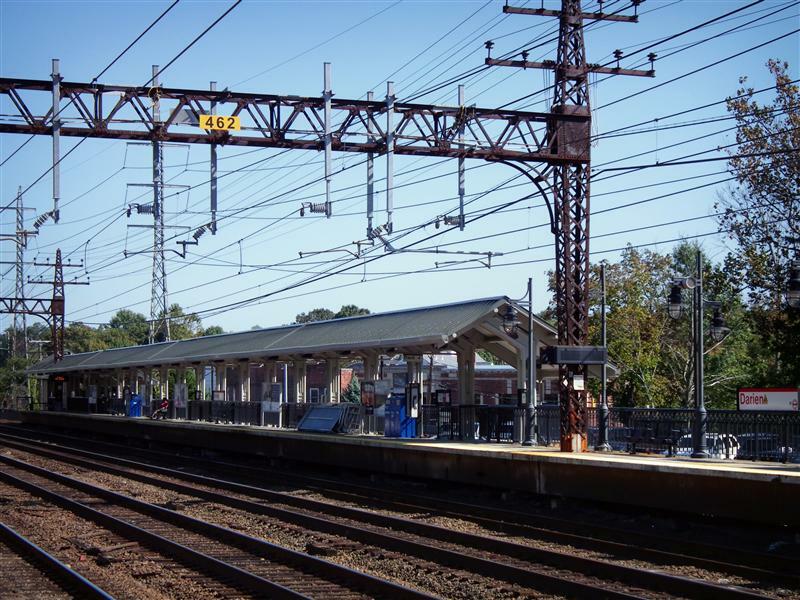 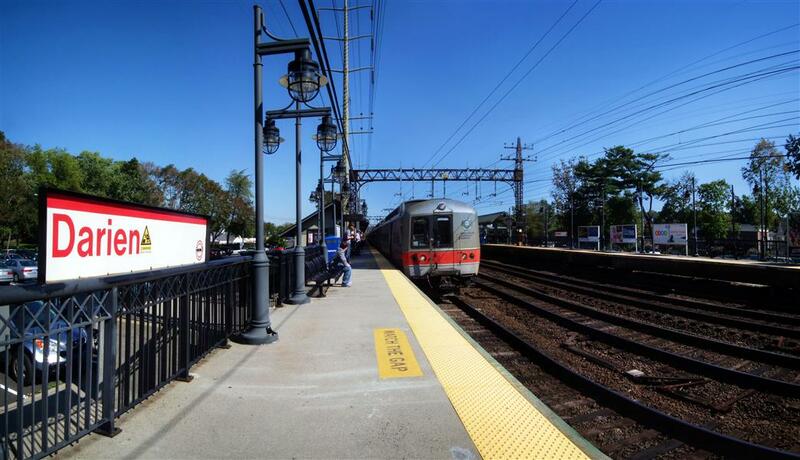 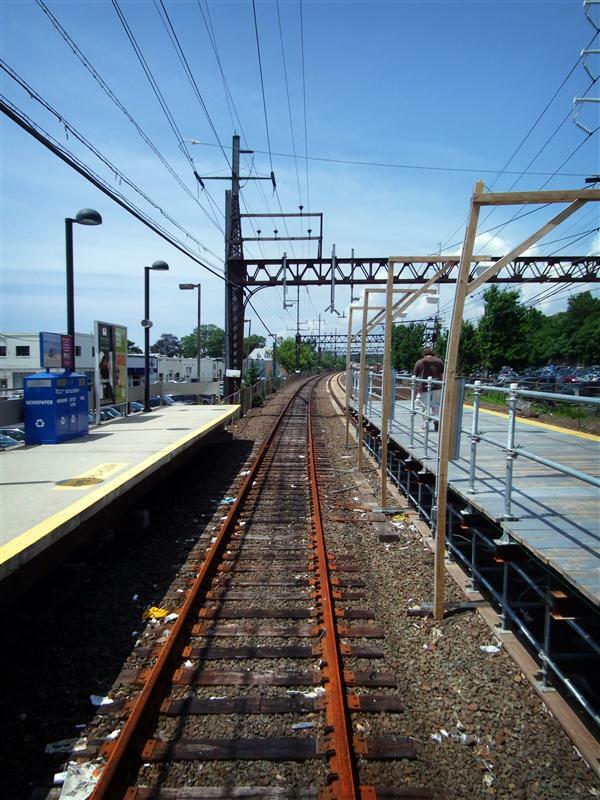 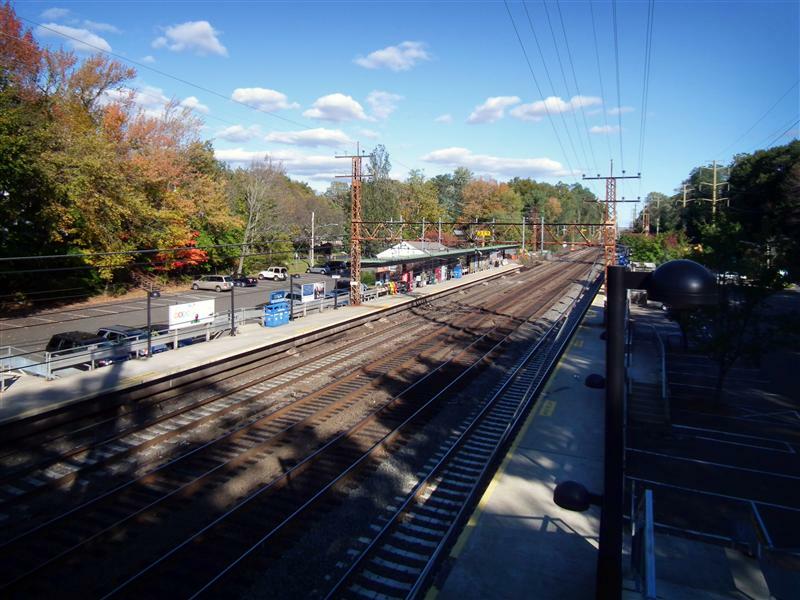 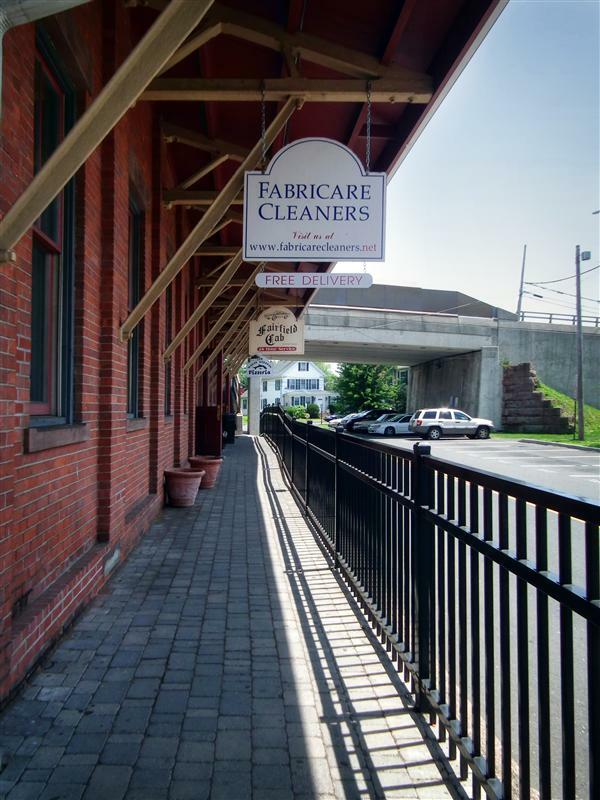 New Rochelle has come a long way since the railroad first came to town in 1848. 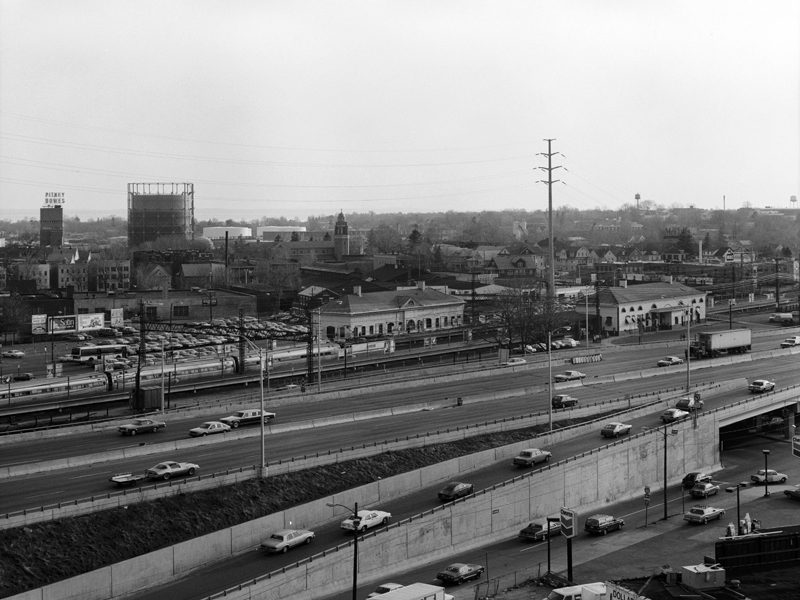 Back then the city had only about 2,000 inhabitants. 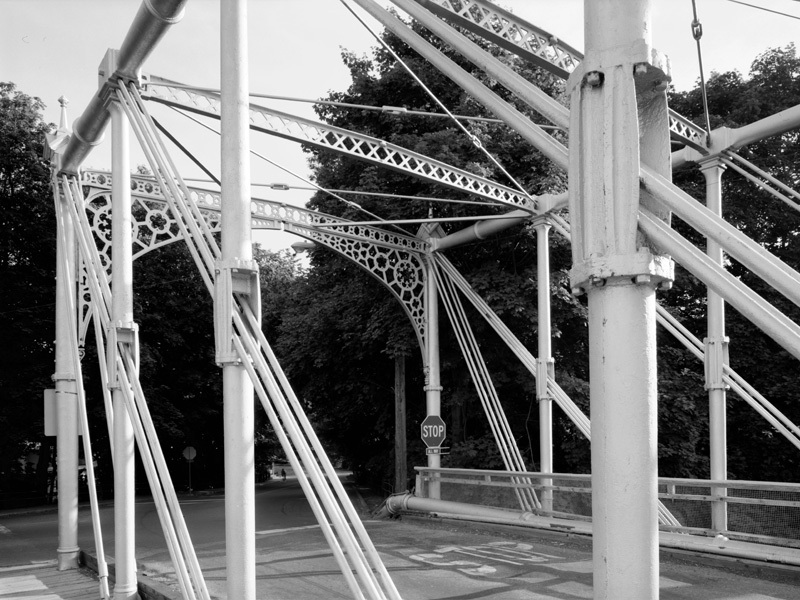 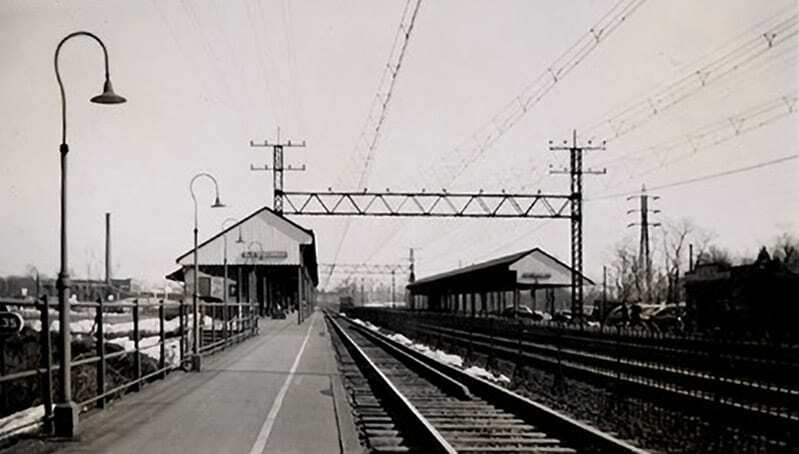 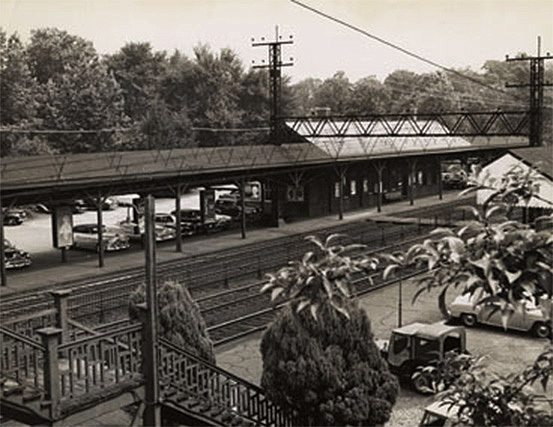 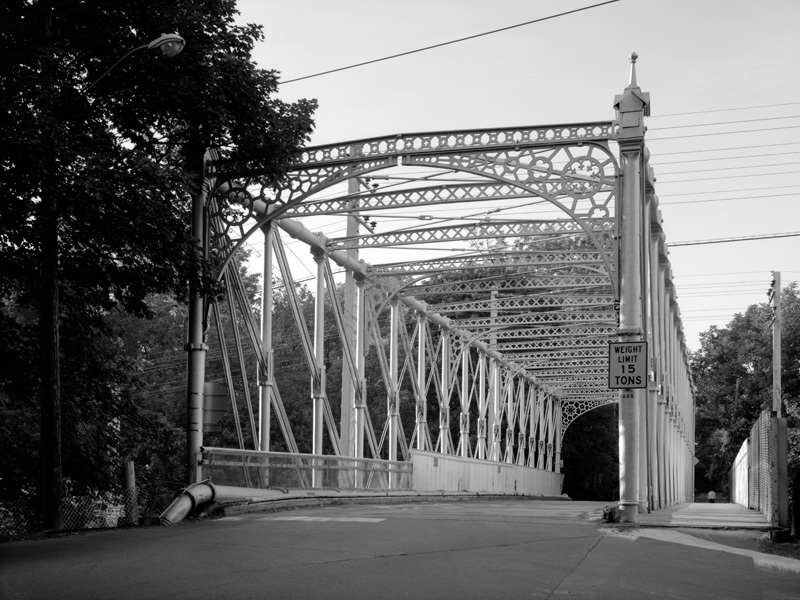 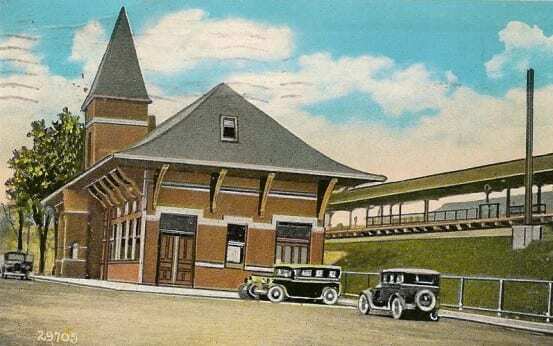 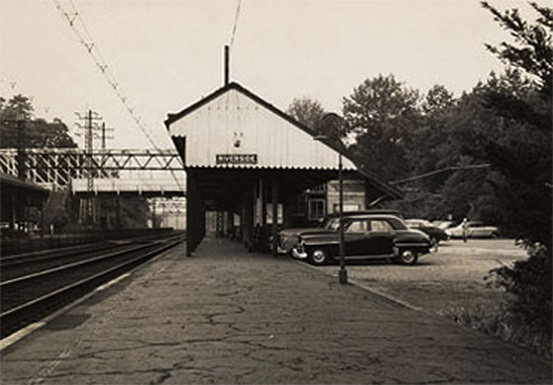 By the 1900’s, however, that number had grown to 15,000, as New Rochelle became a desirable suburb for commuters (today the population is around 77,000). 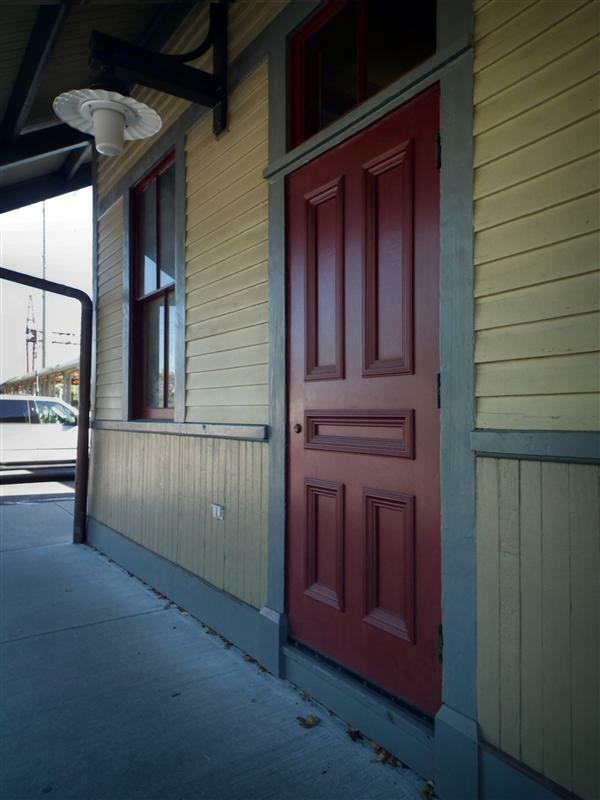 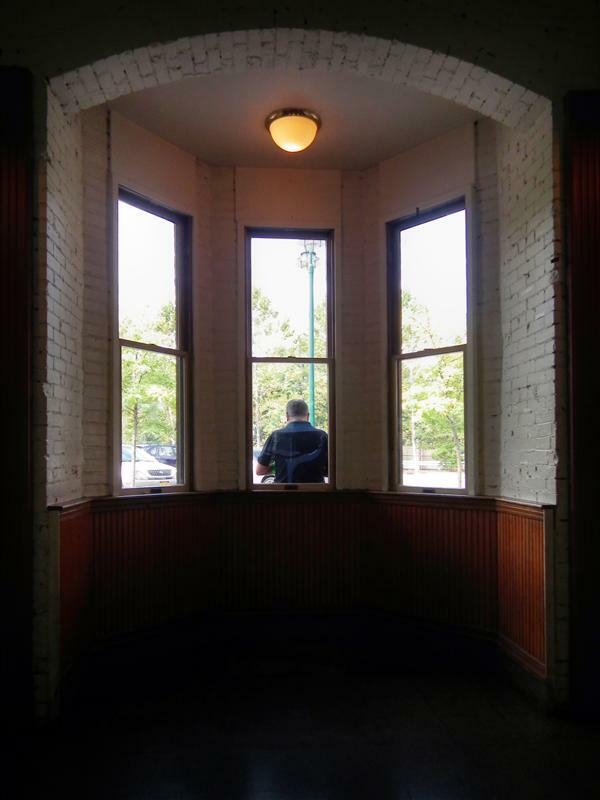 While the original roundhouse for steam engines and a yard for freight are no longer in existence, the historic station building remains and has been restored. 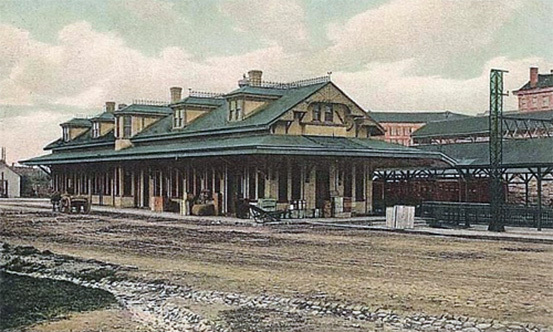 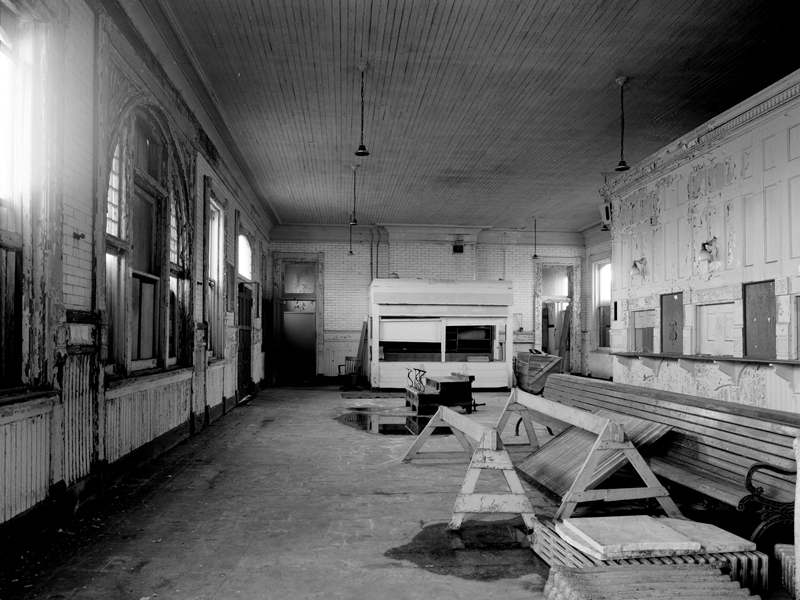 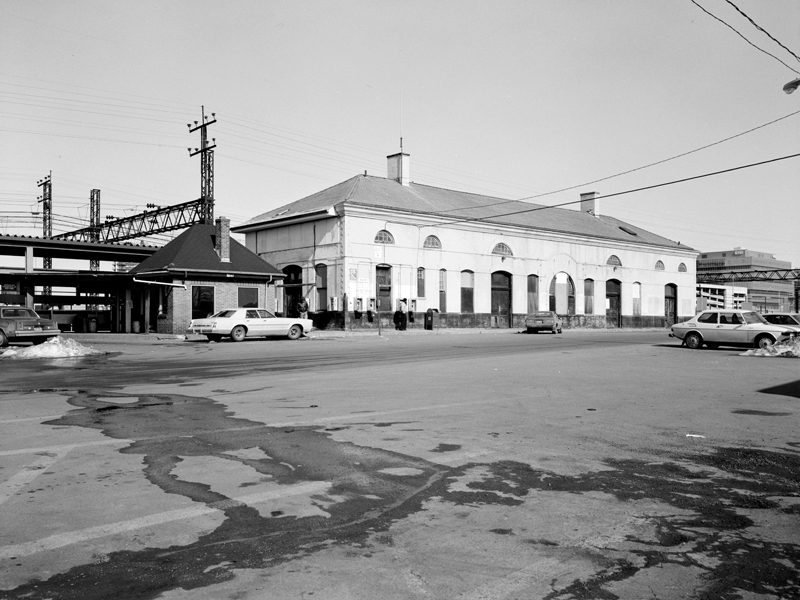 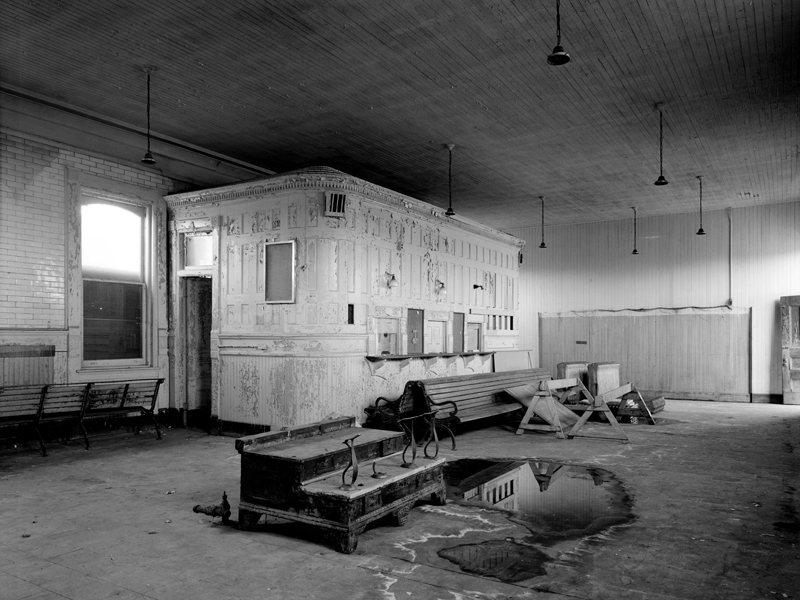 Like many old stations, the 1887 building had fallen into disrepair, it was also burned by fire in 1988. 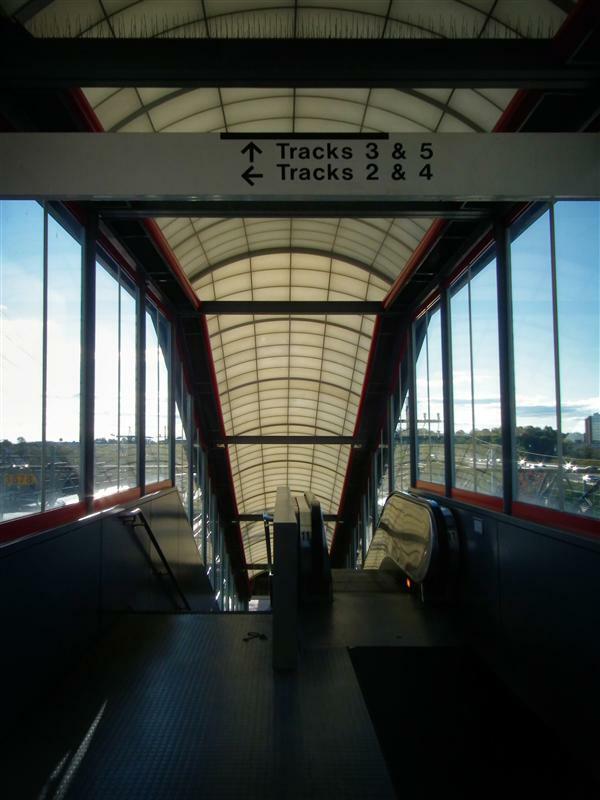 Commuters had described the station as dank, dirty, and derelict. 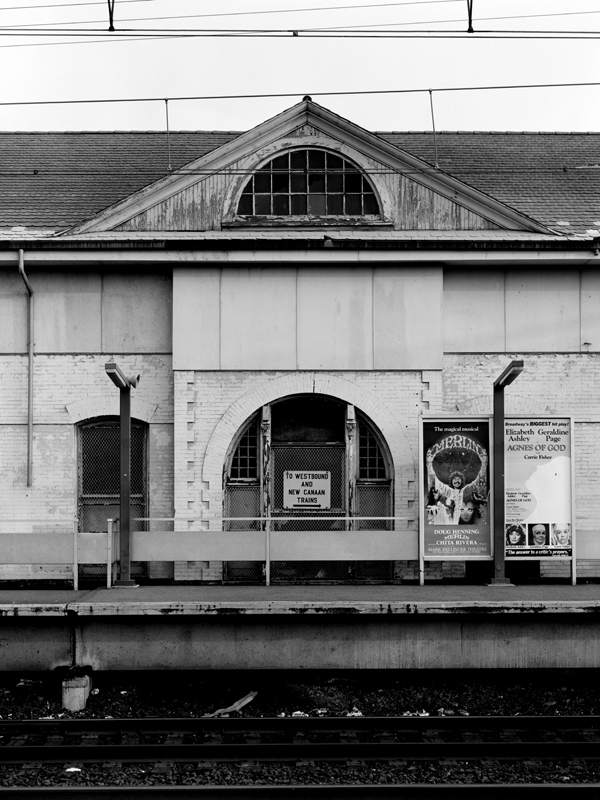 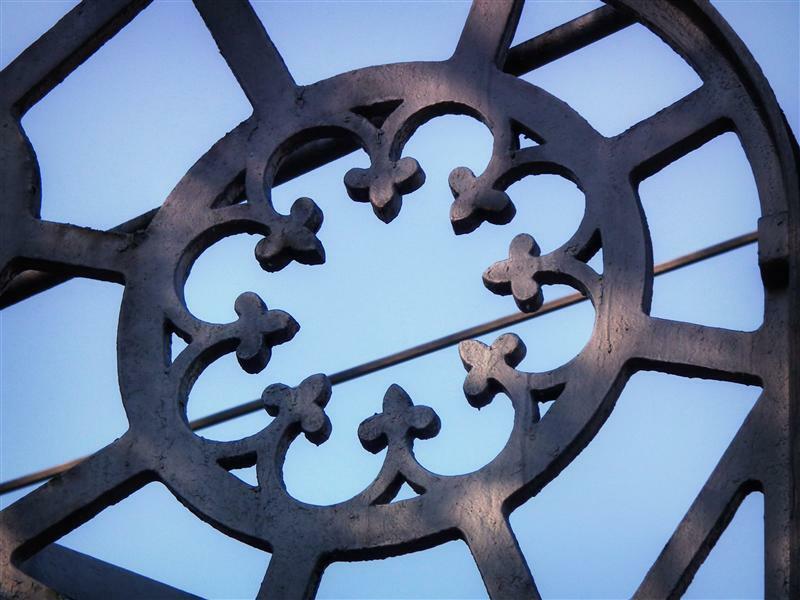 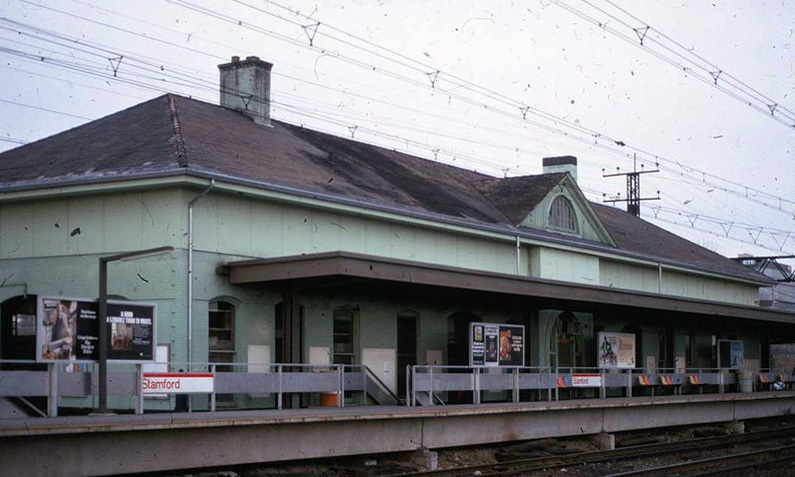 Thankfully, instead of tearing down the station, it went through a process of restoration starting in 1990. 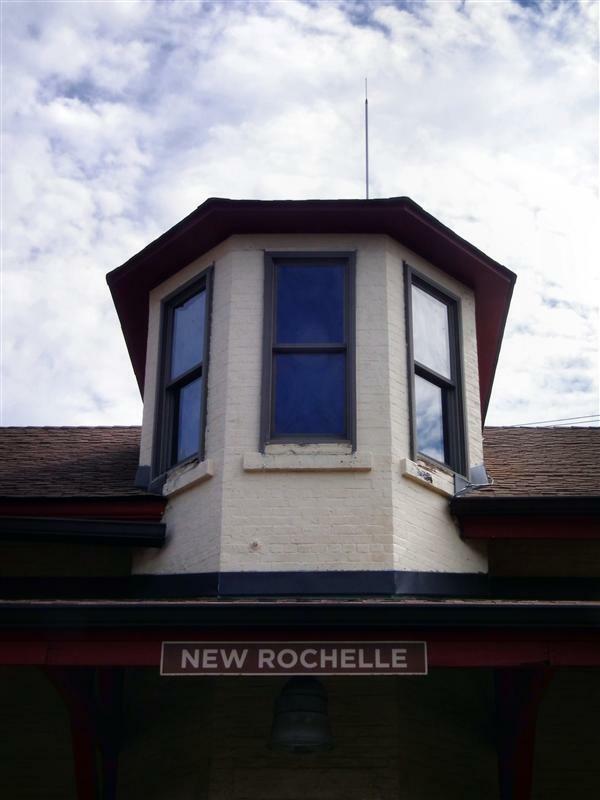 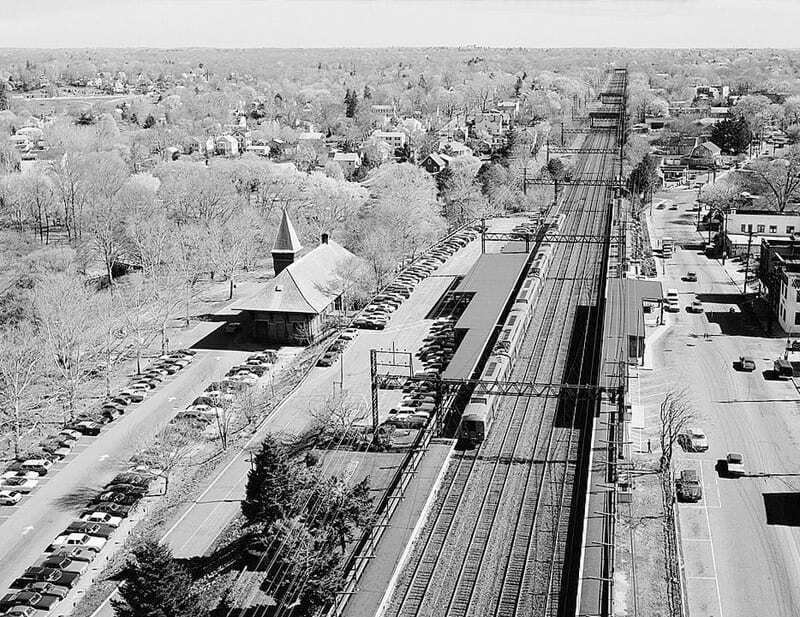 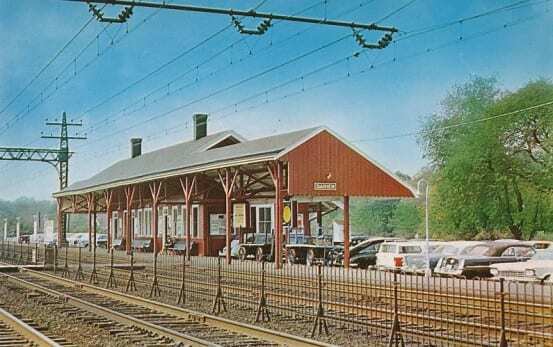 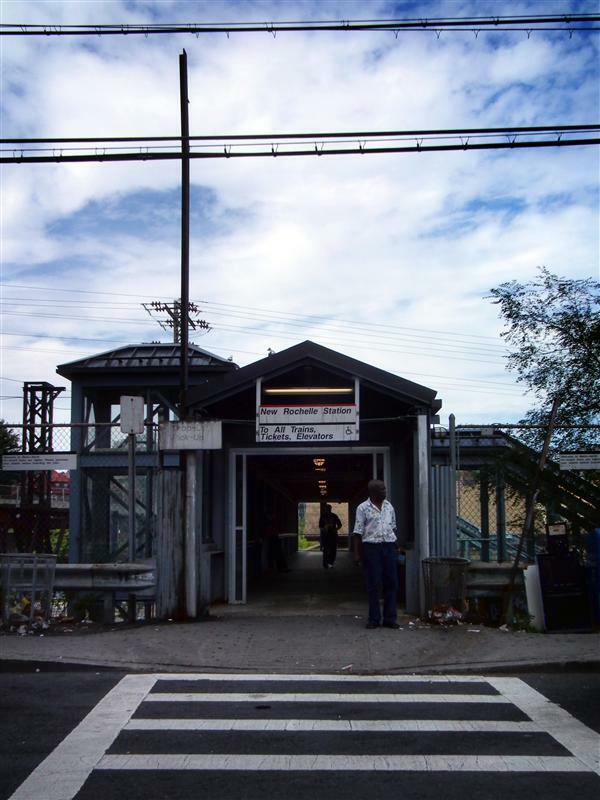 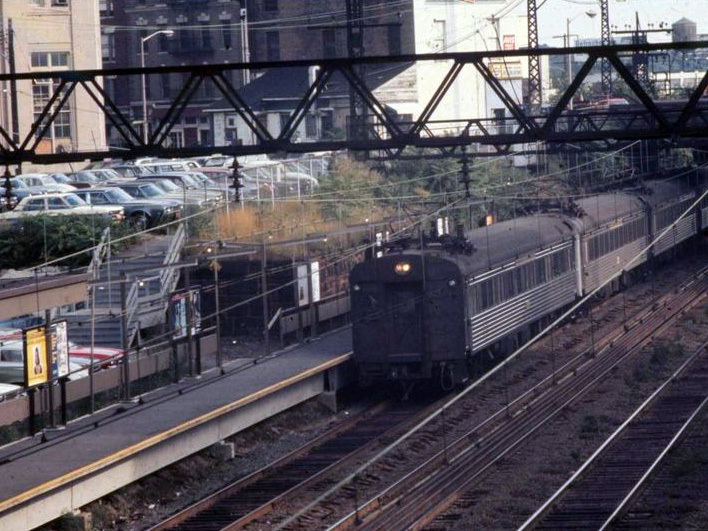 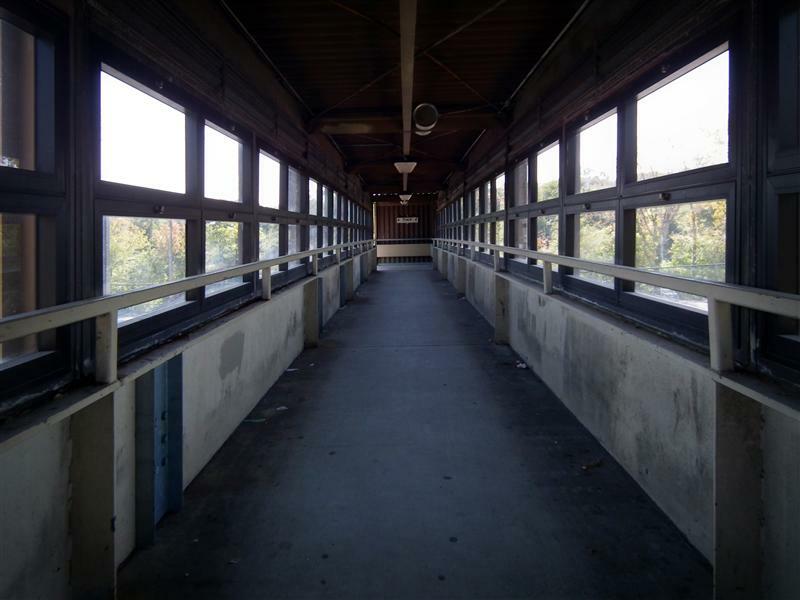 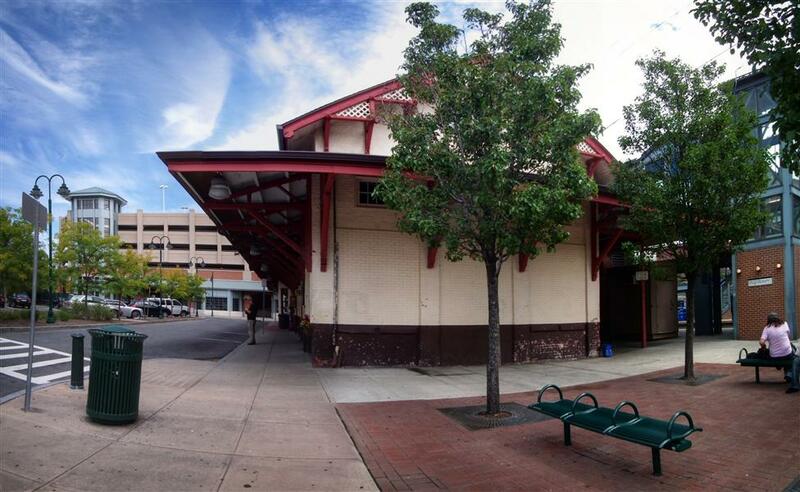 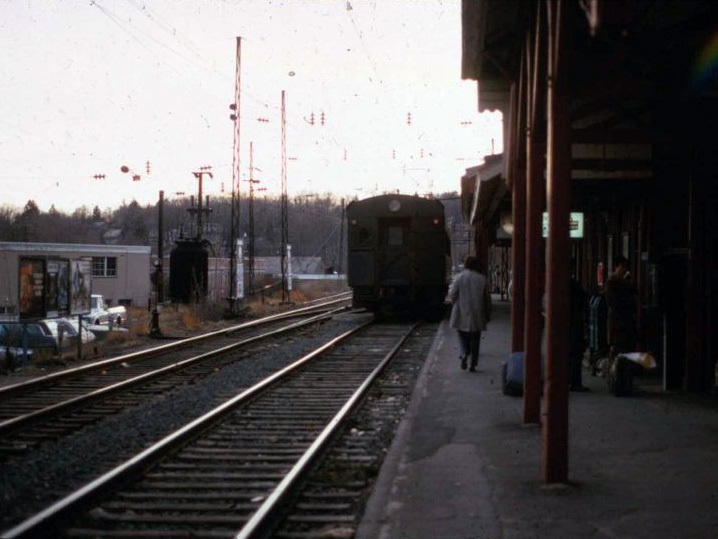 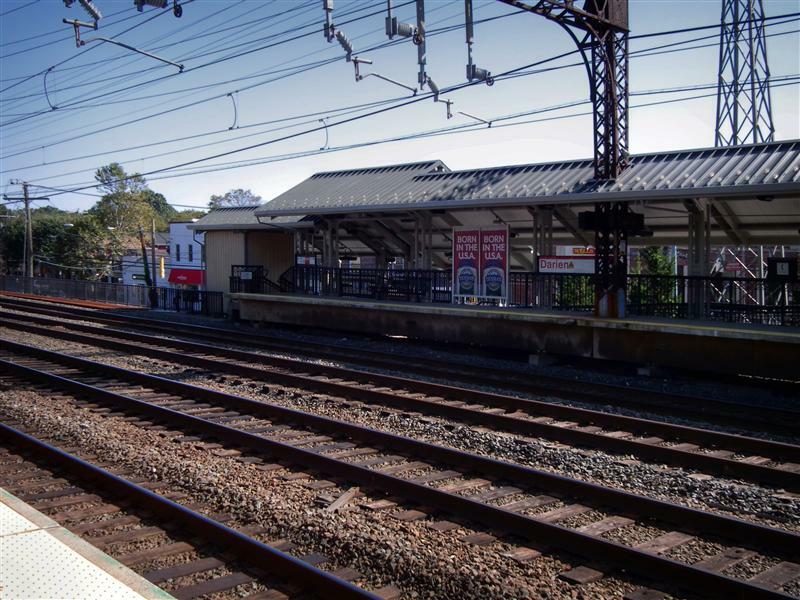 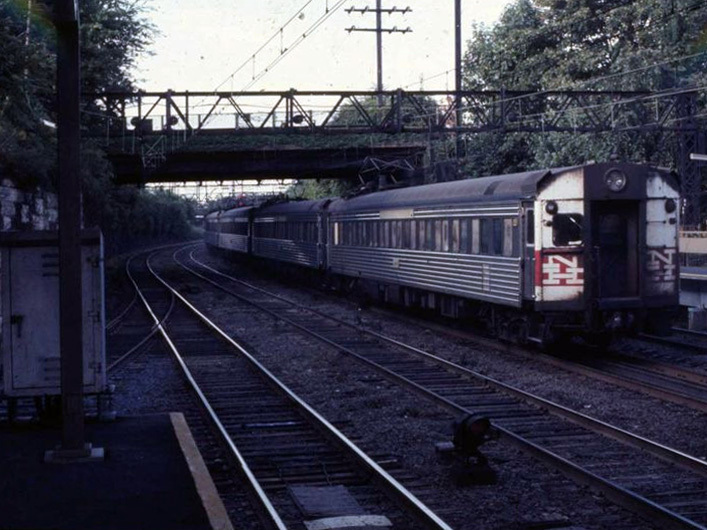 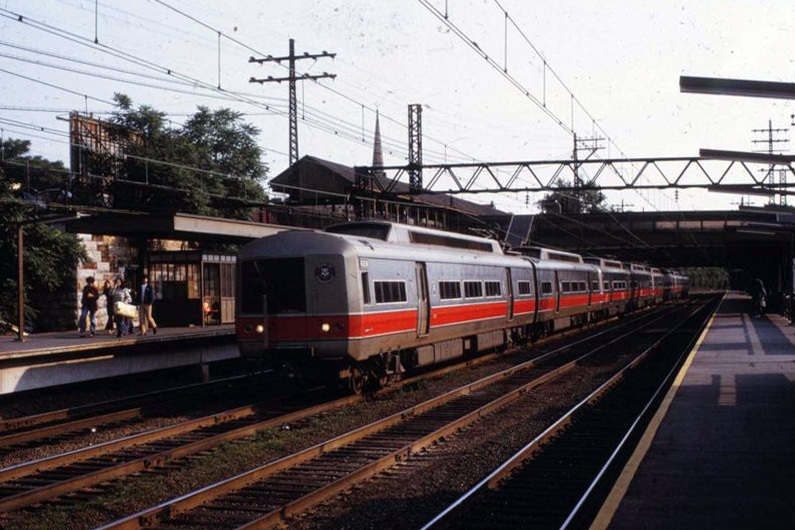 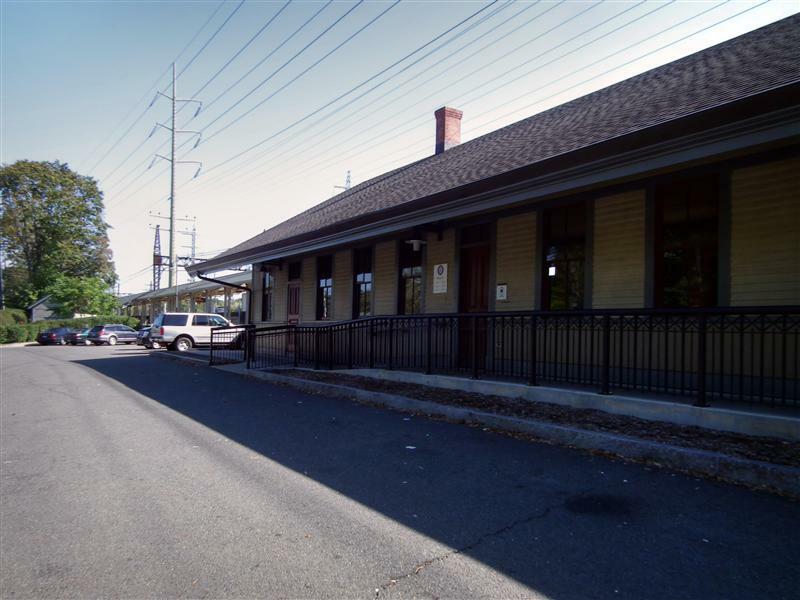 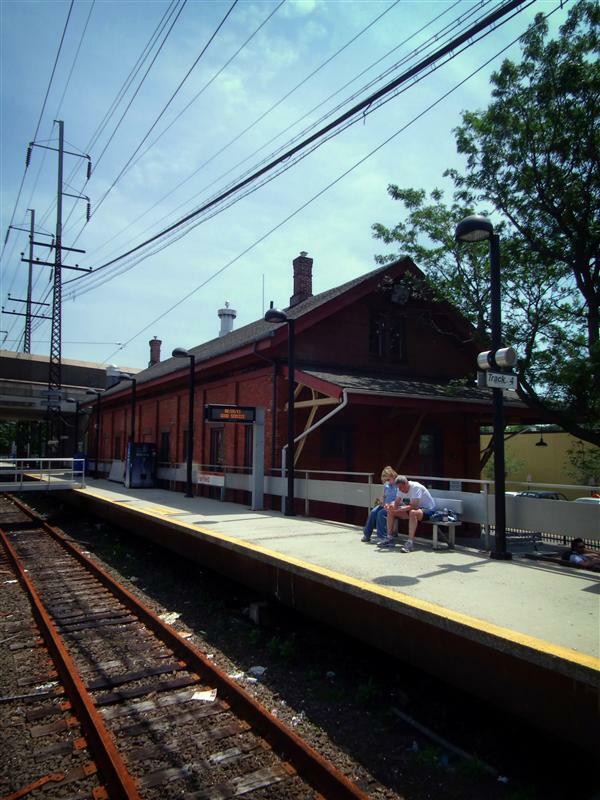 The city of New Rochelle, which had purchased the station property in 1982, agreed to share the cost of the restoration with Amtrak. 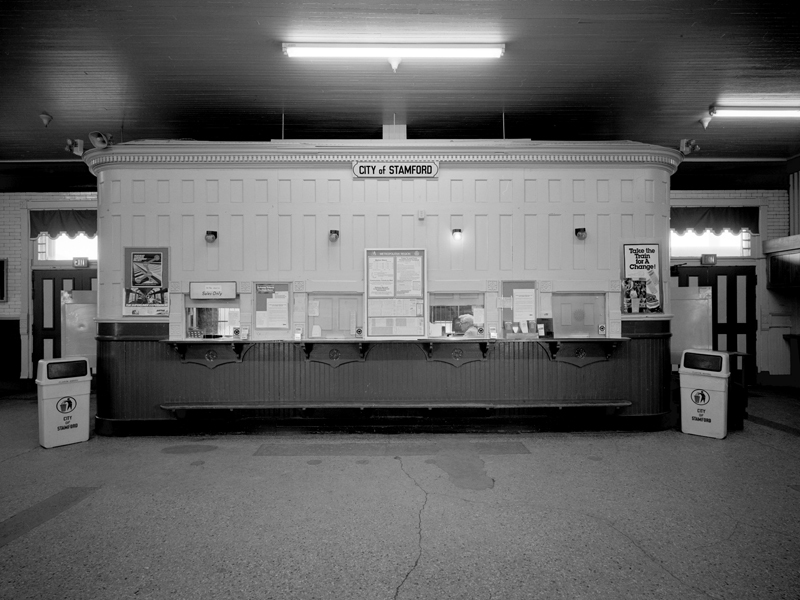 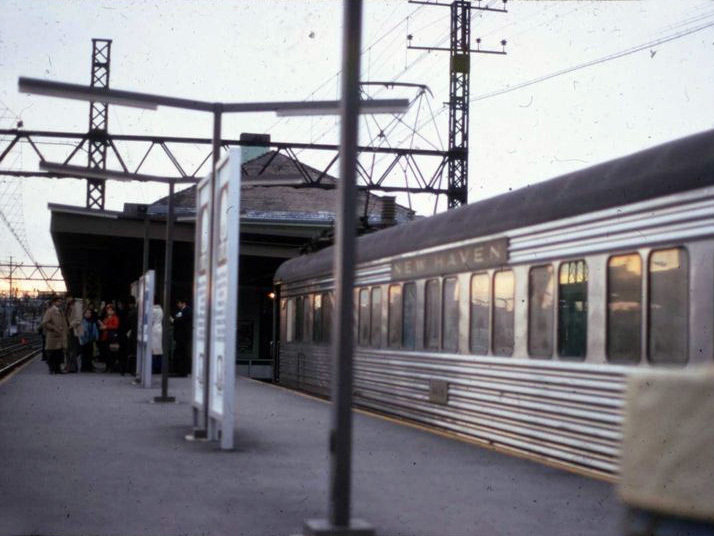 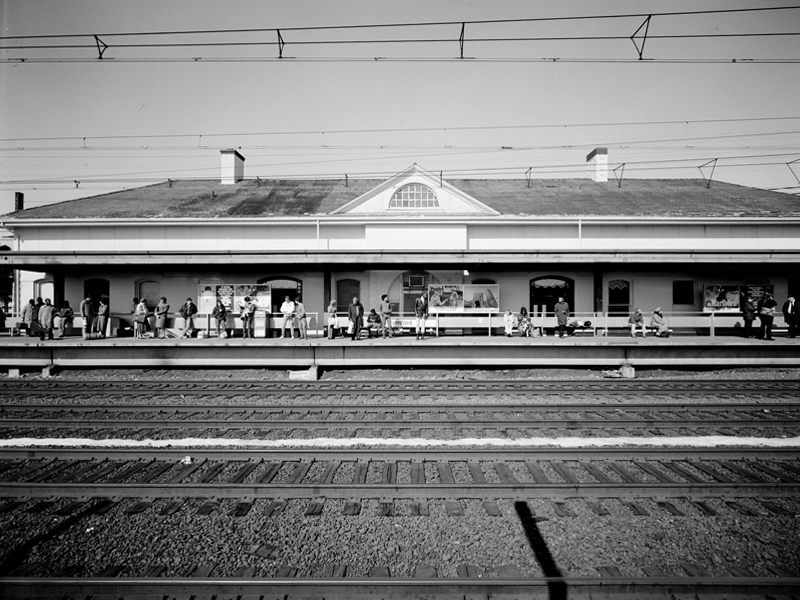 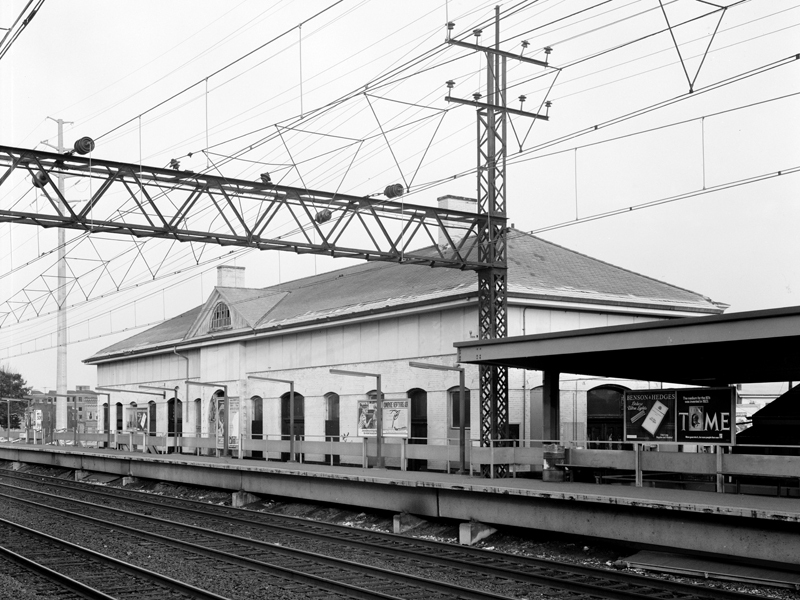 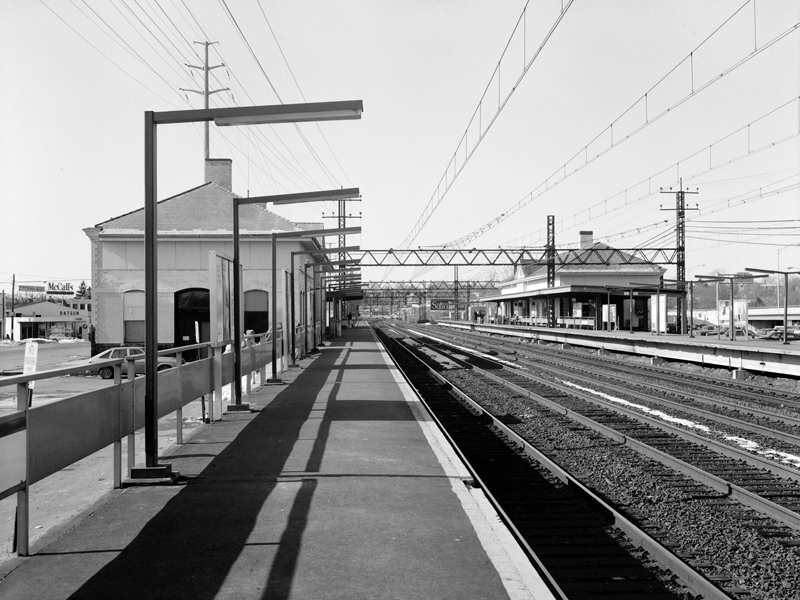 The fully restored station was reopened on March 1st, 1990. 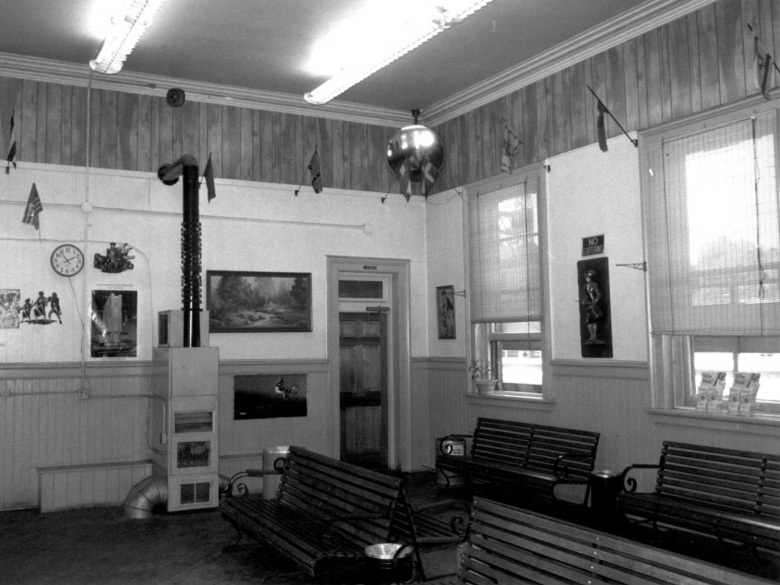 The one-and-a-half story building is again beautiful – the brick exterior was cleaned, and the inner plaster walls and wood ceiling were repaired. 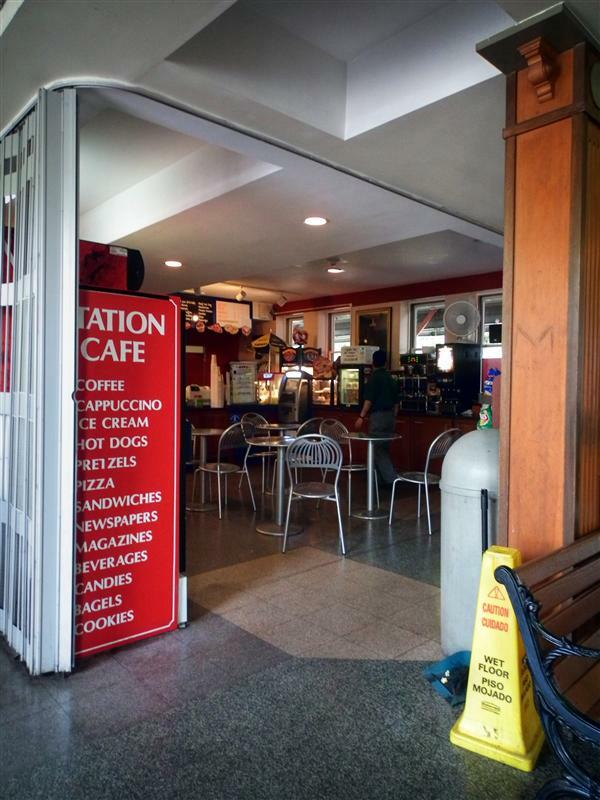 The terrazzo tile flooring was in poor condition and had to be completely replaced. 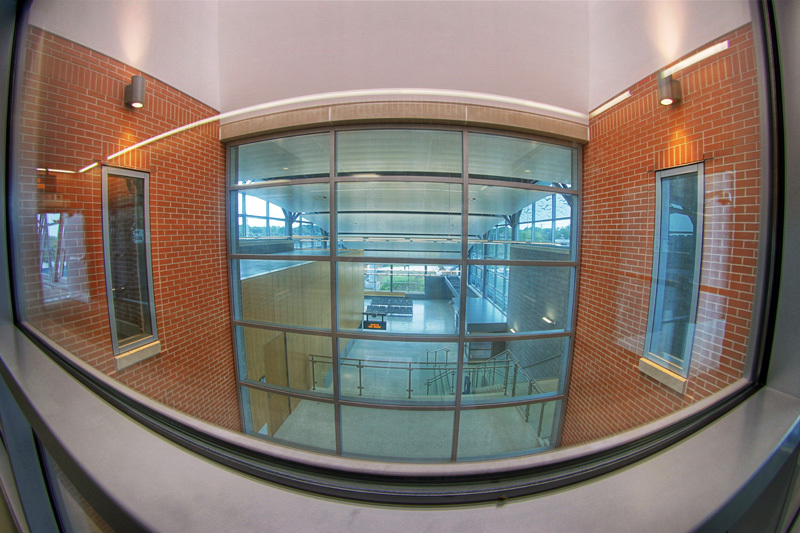 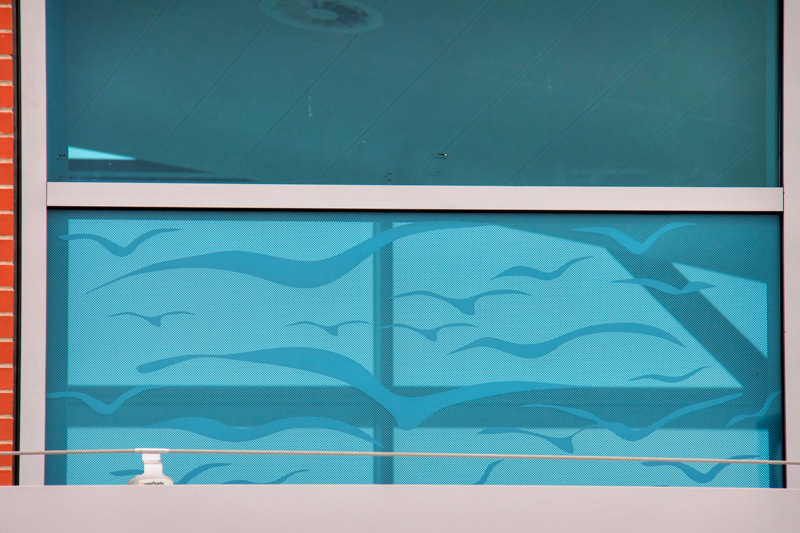 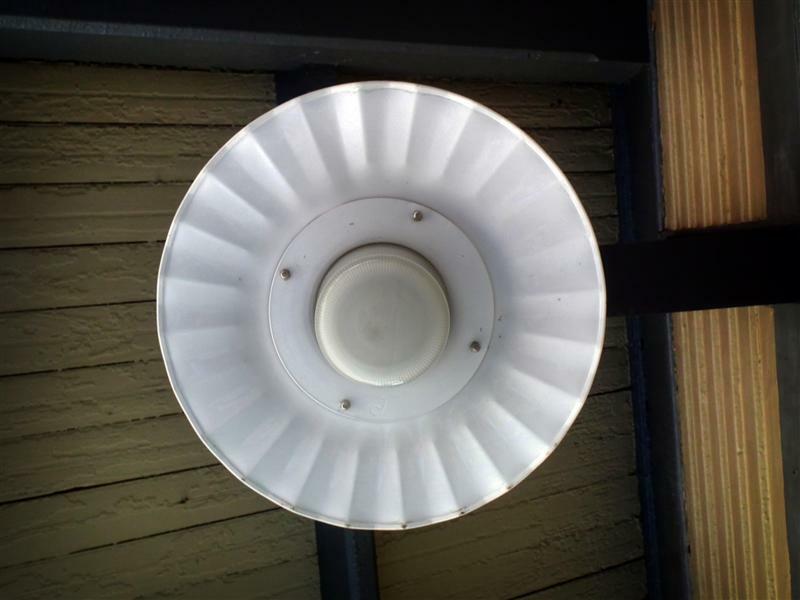 Additional changes made during the renovations included new lighting, bathrooms, and windows. 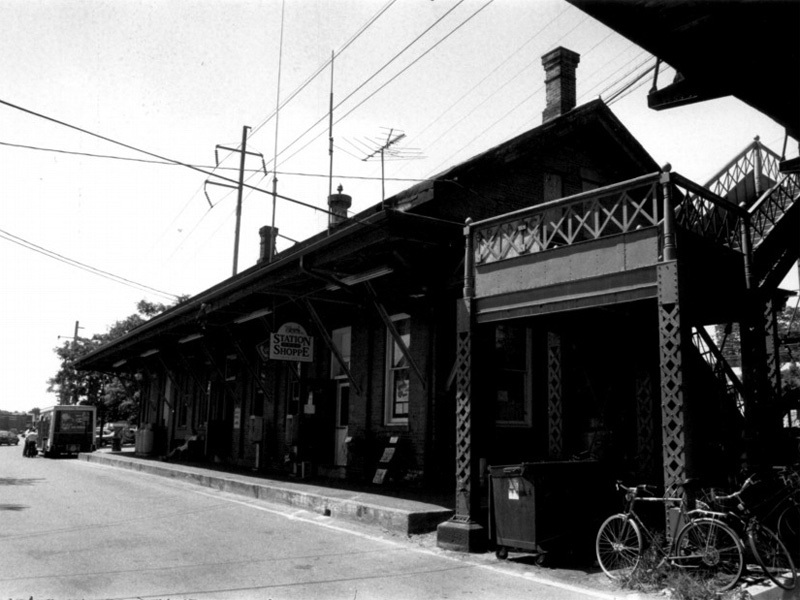 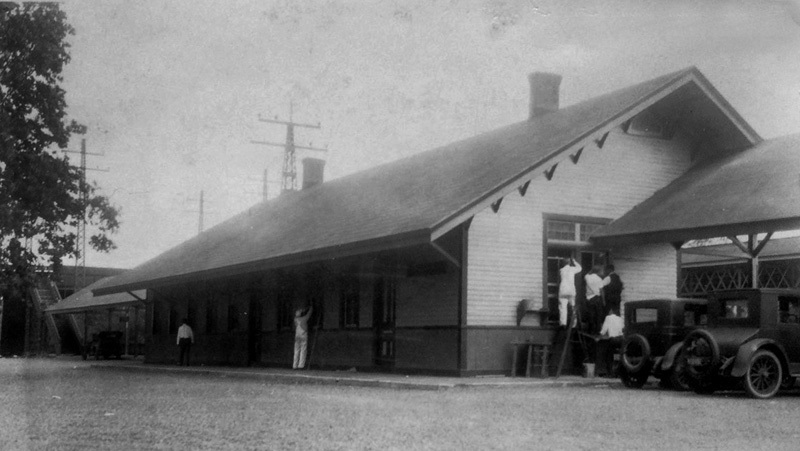 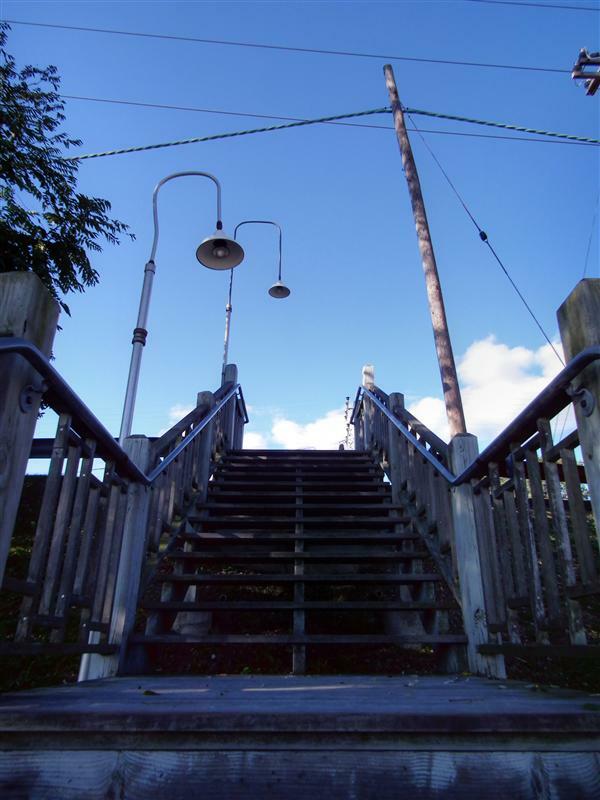 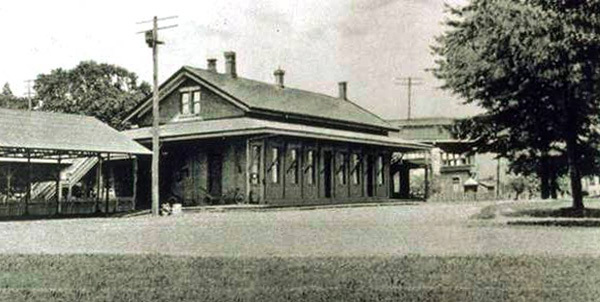 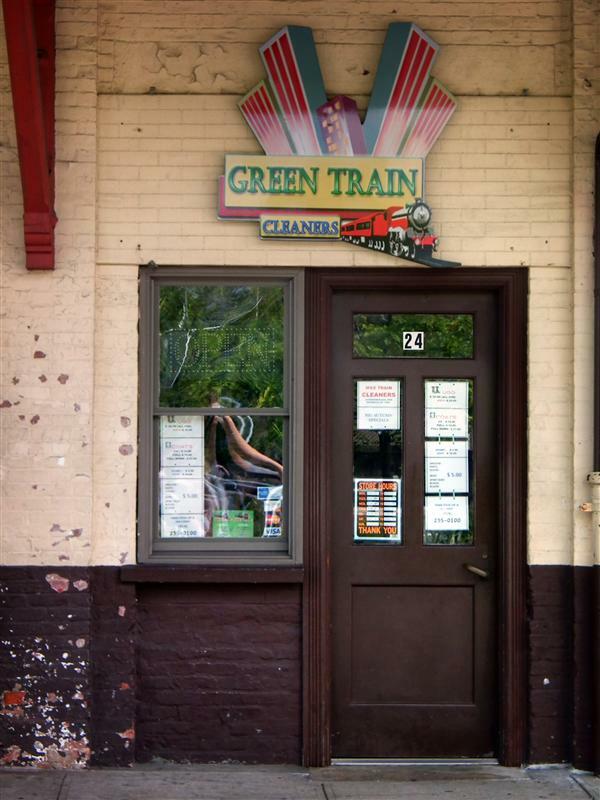 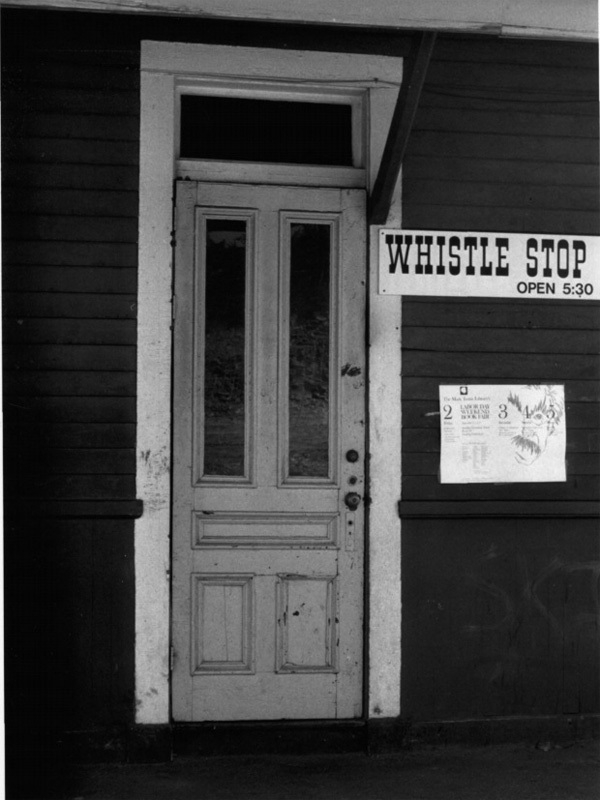 The station was nominated, and is now a part of the National Register of Historic Places. 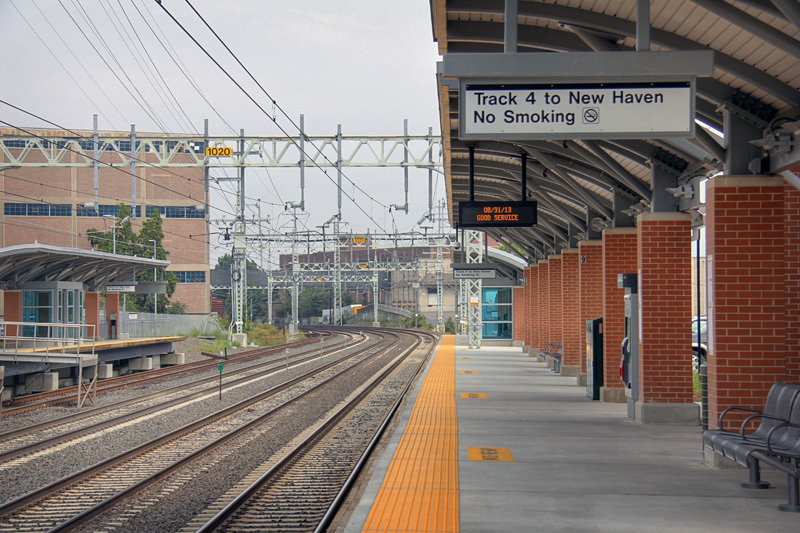 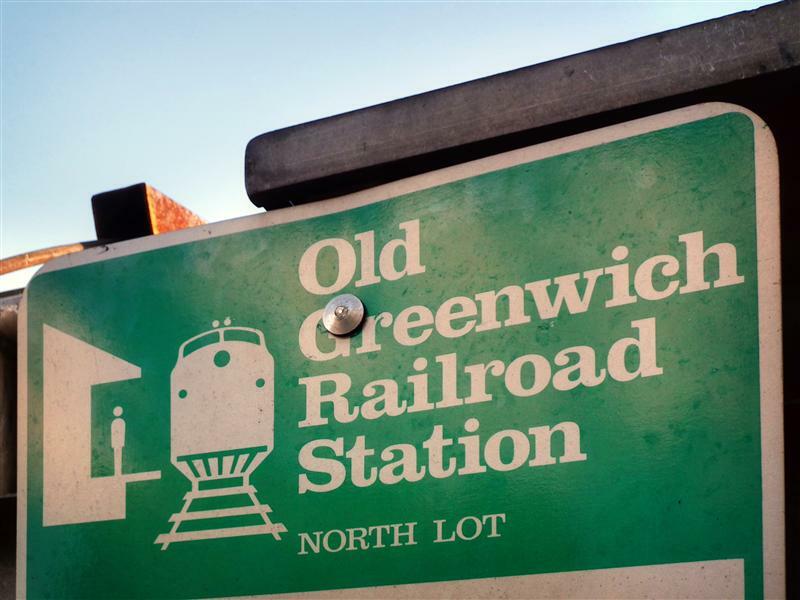 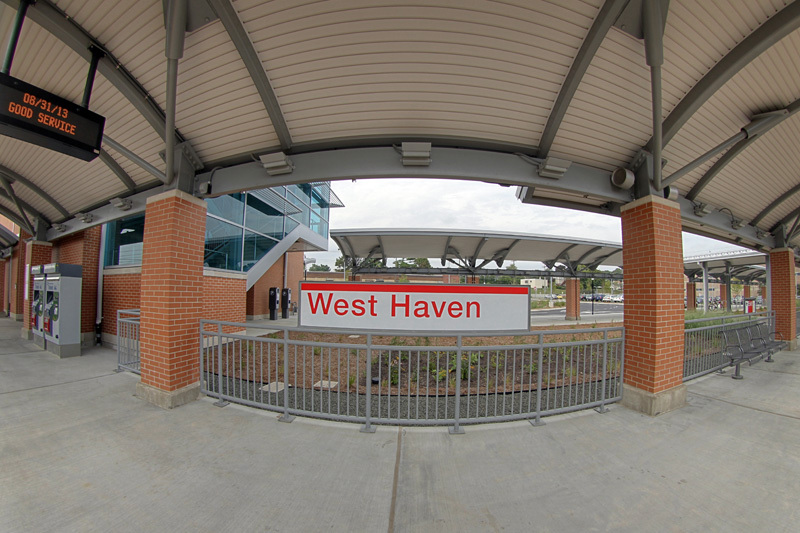 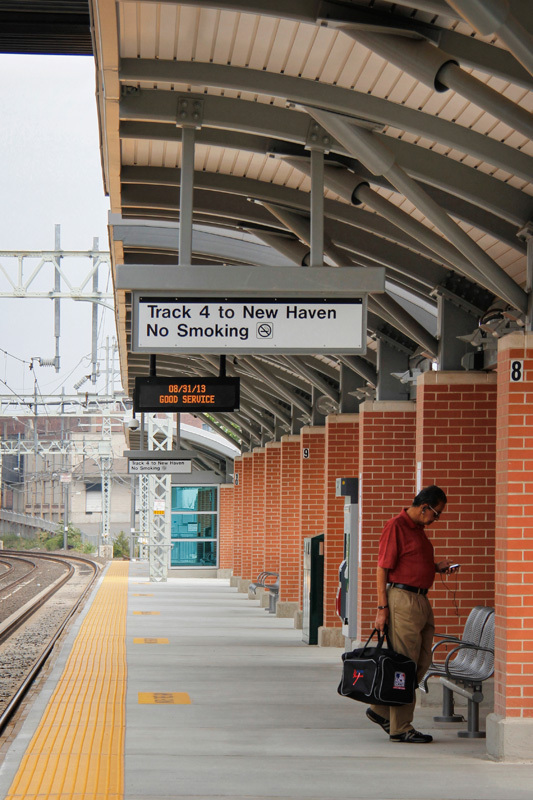 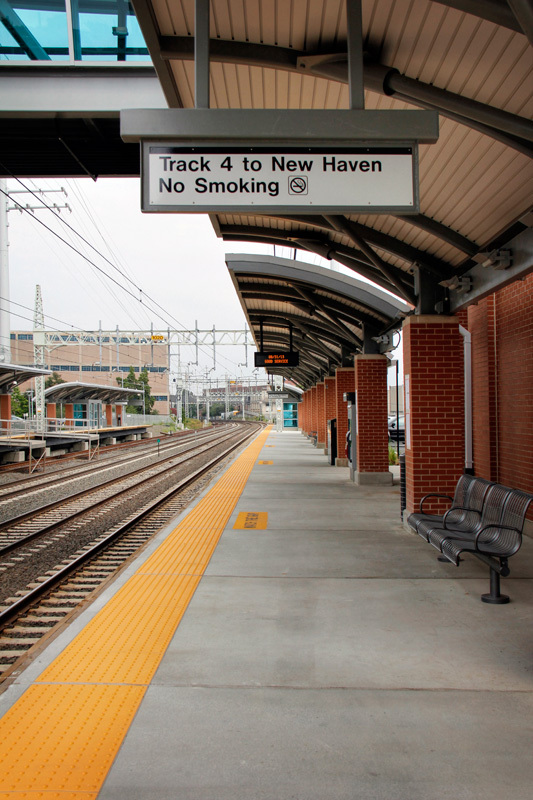 Located slightly more than 31 miles from Grand Central is today’s current stop on our tour of the New Haven Line, Old Greenwich. 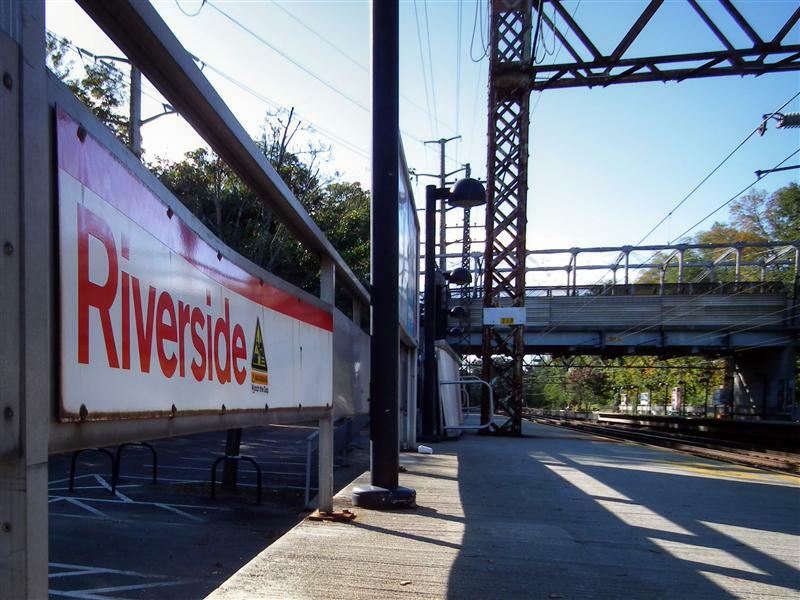 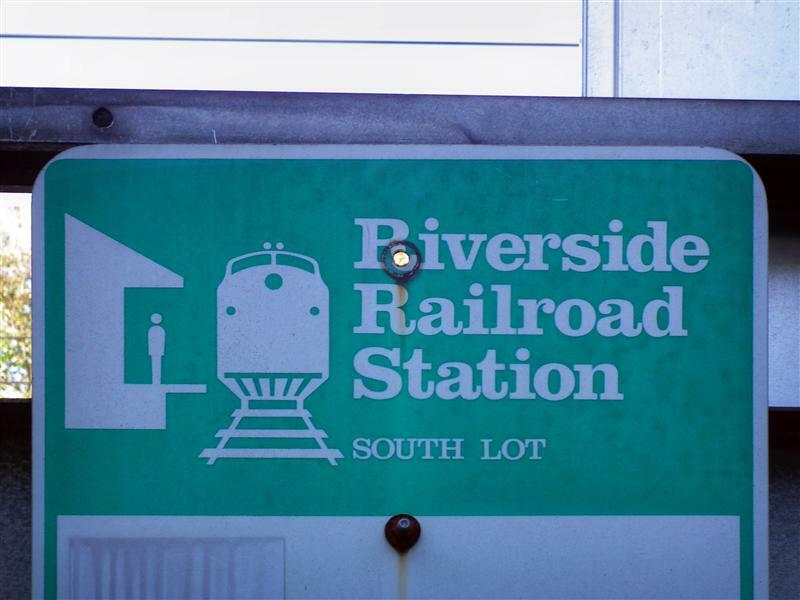 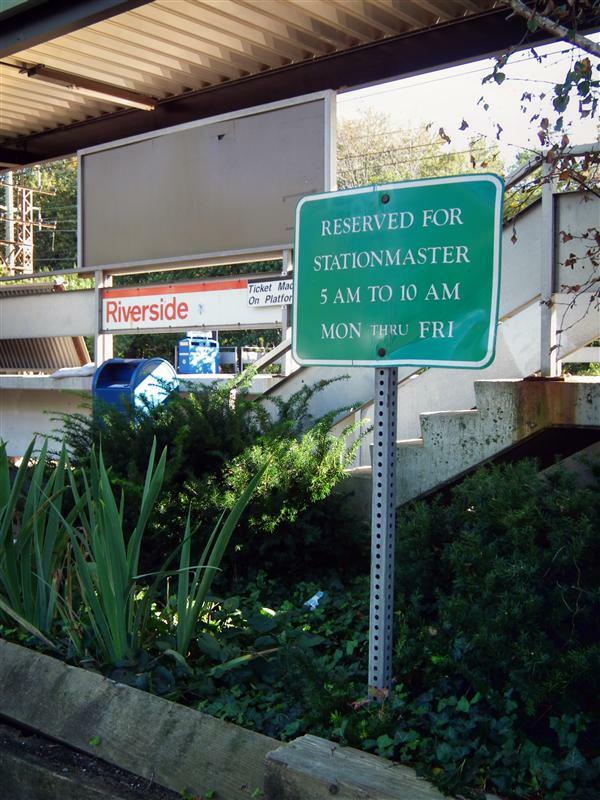 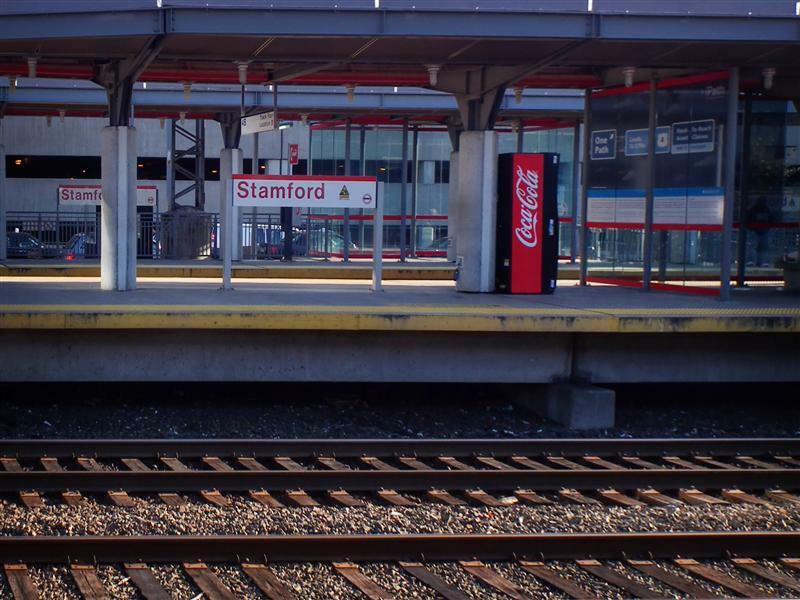 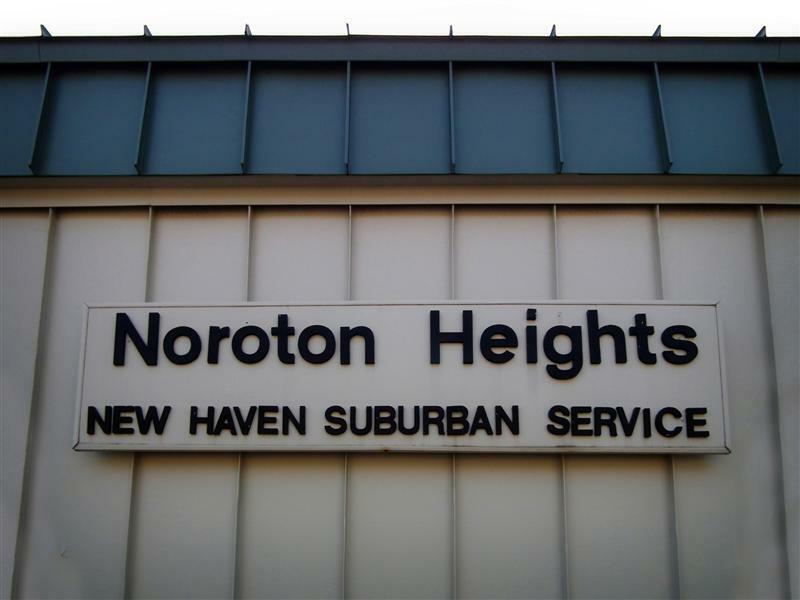 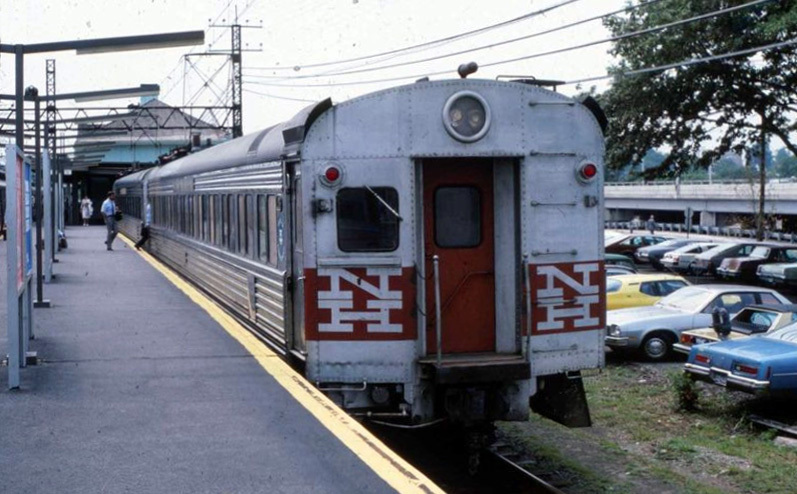 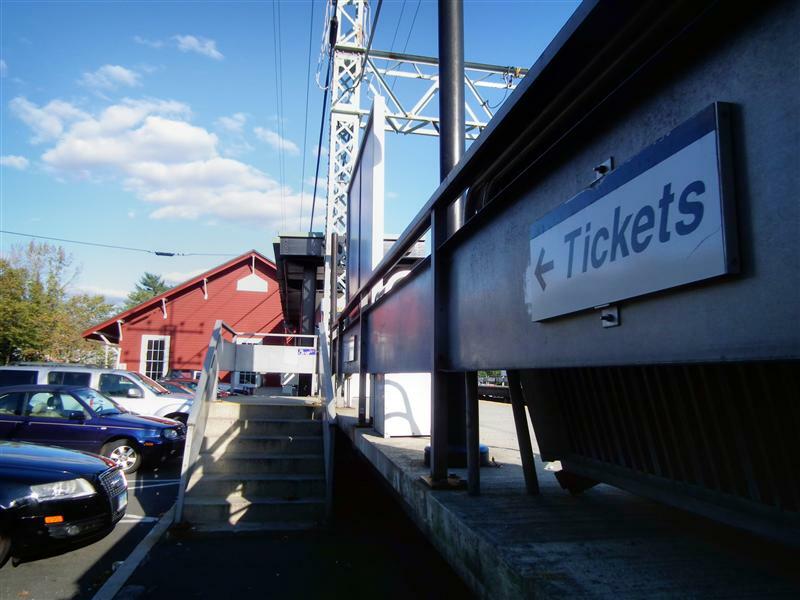 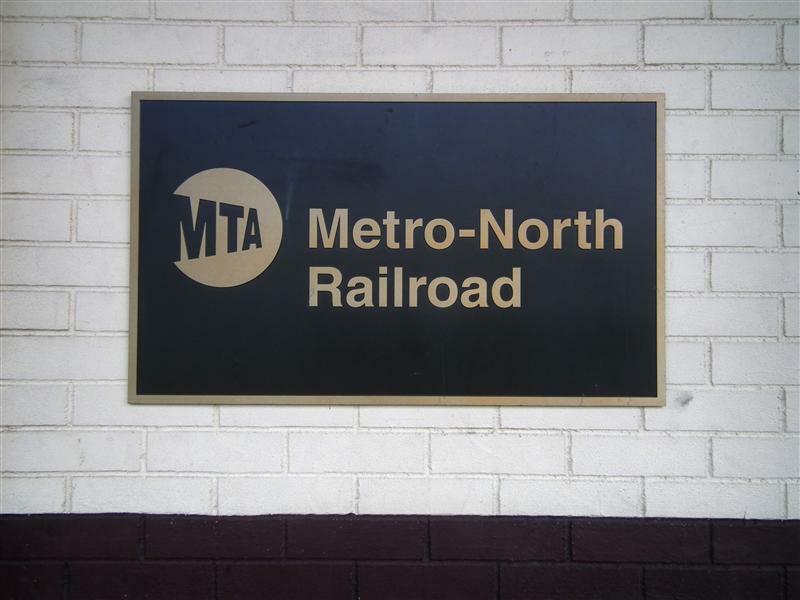 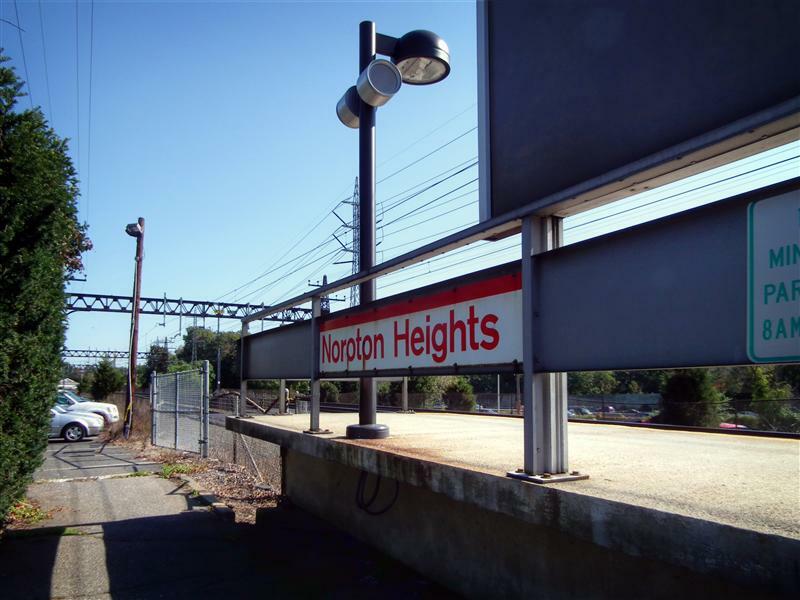 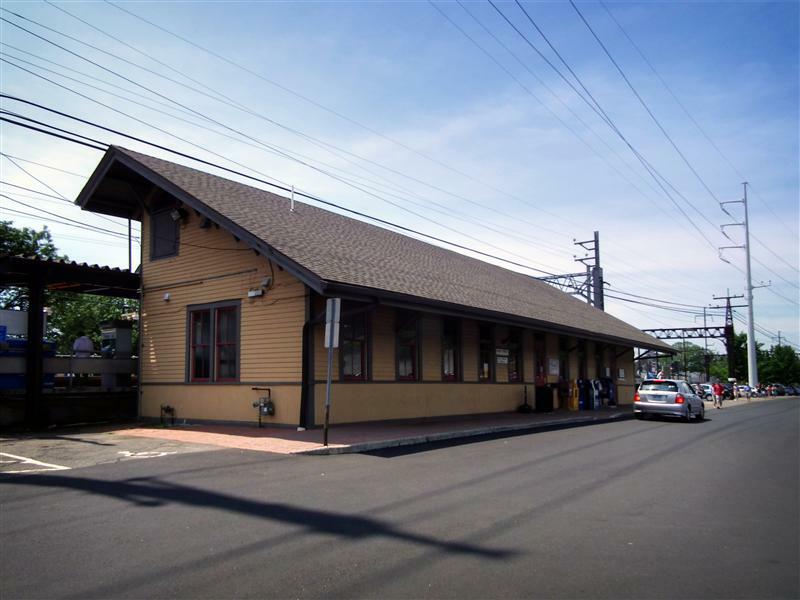 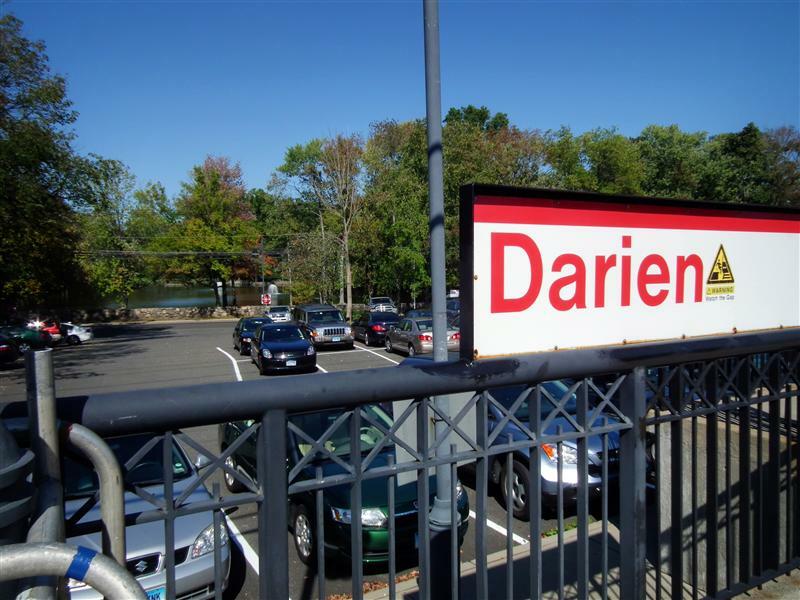 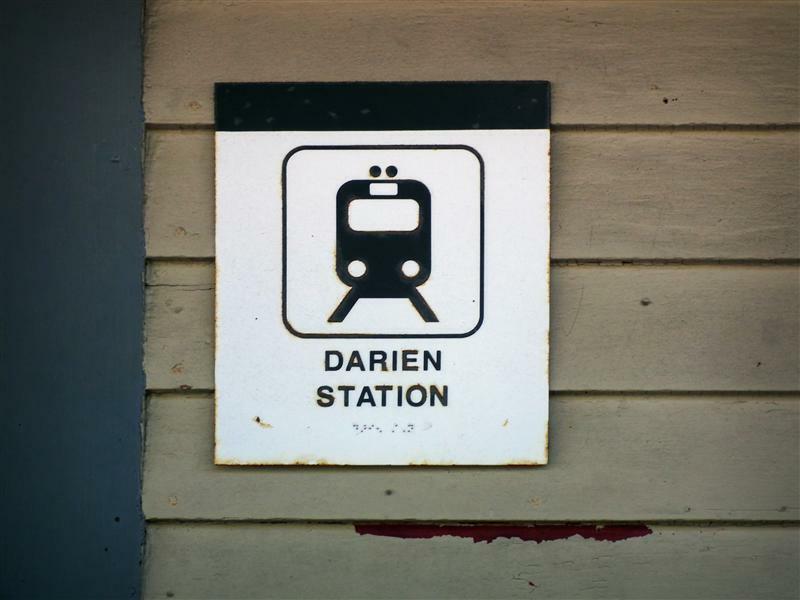 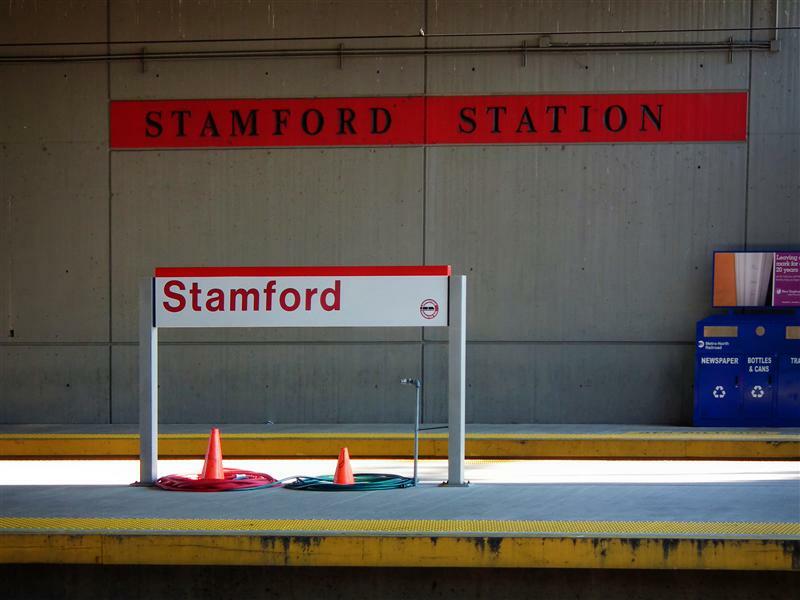 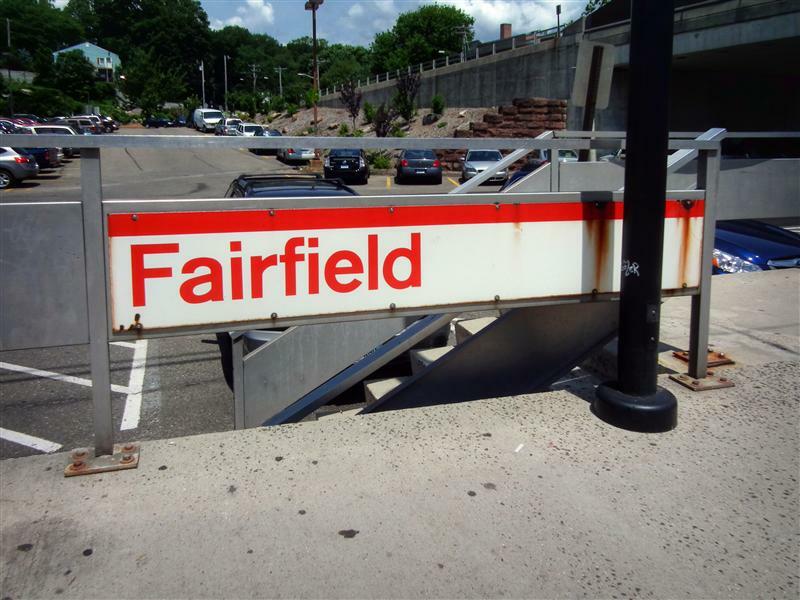 While touring Metro-North’s stations, we’ve encountered a couple places that have changed names over the many years the railroad has been around. 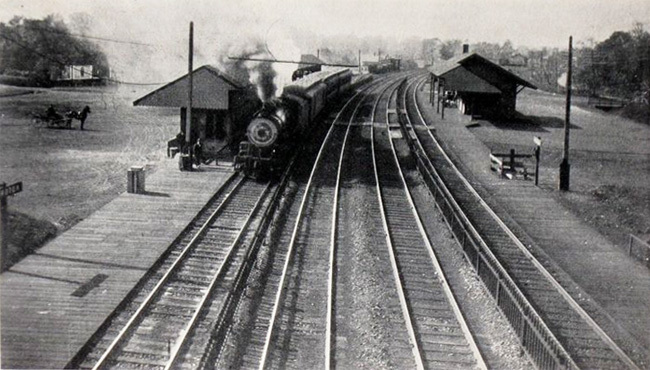 Unionville, for example, was what Hawthorne was once called. 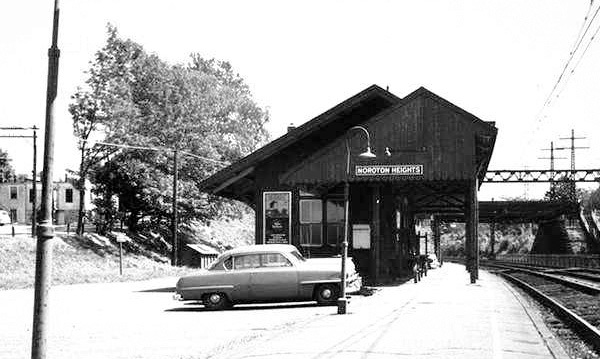 Katonah was once called Whitlockville. 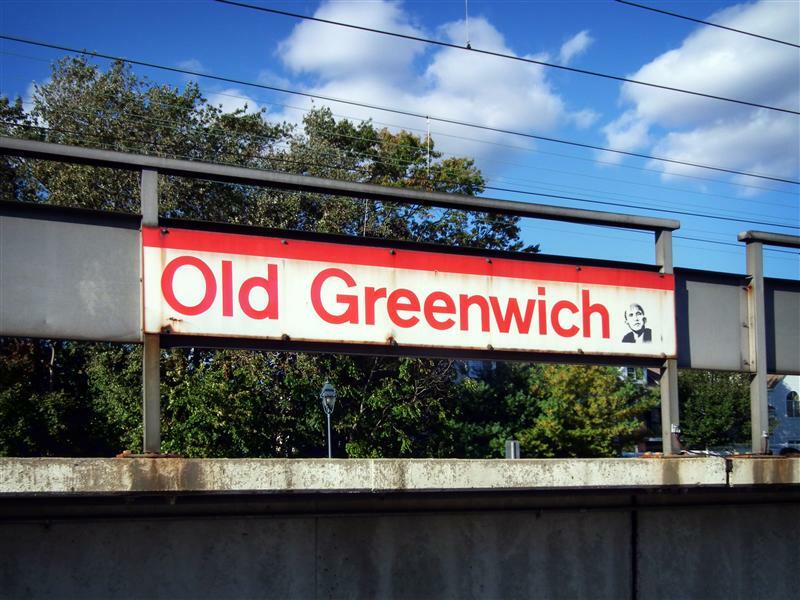 Up until 1931, Old Greenwich was known as Sound Beach. 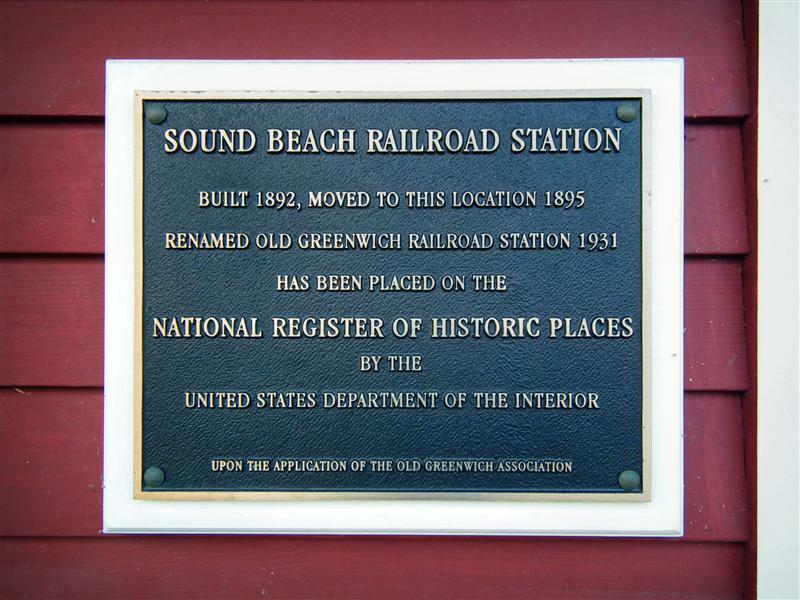 I personally think that Sound Beach sounds a lot nicer, but perhaps the word “Greenwich” in there bestows a certain level of elevated status for its residents. 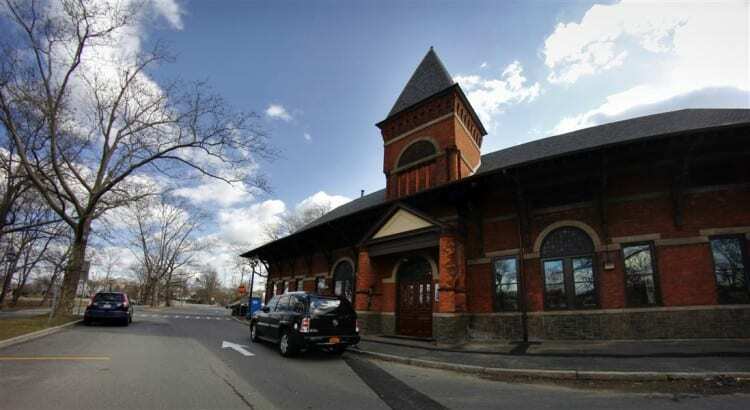 Although we’re really here to check out the Metro-North operations here (with trains almost every half hour, taking about an hour to reach the city), the most interesting part of Old Greenwich is the station building. 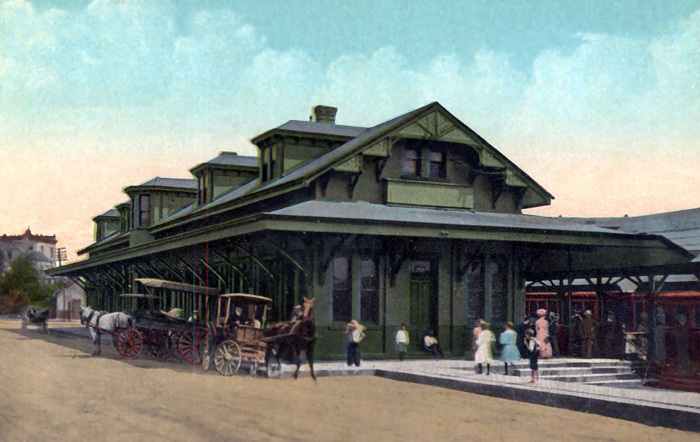 The stick-style building was built in 1892, and was moved to its current location in 1895. 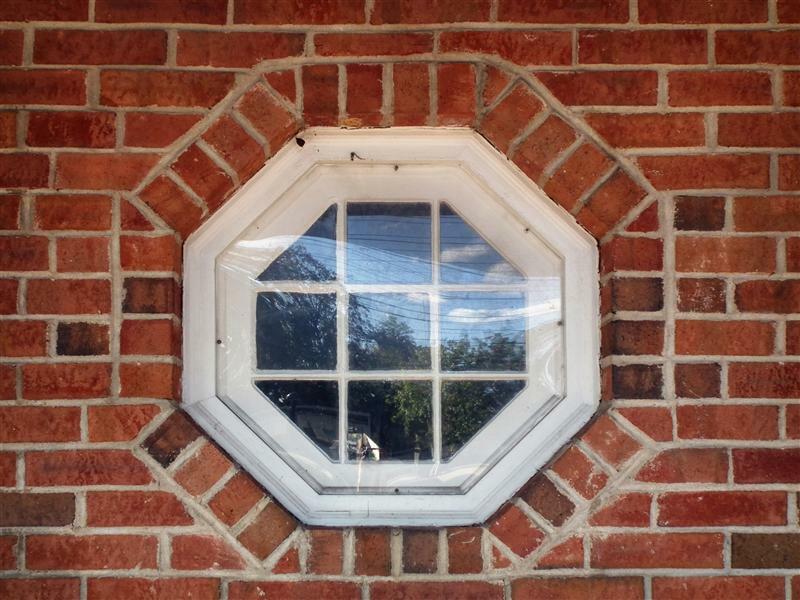 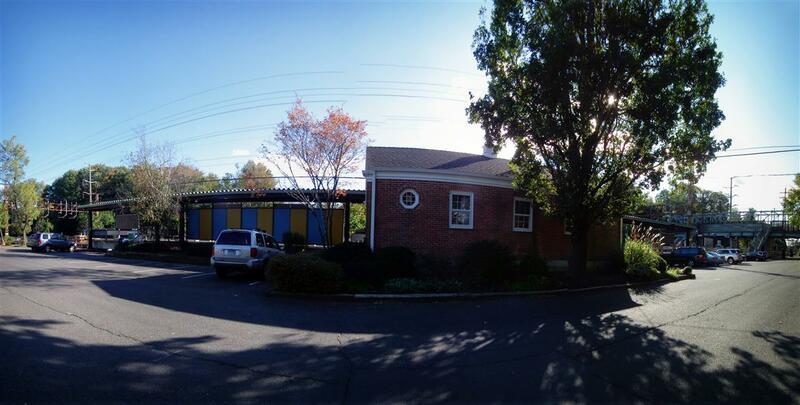 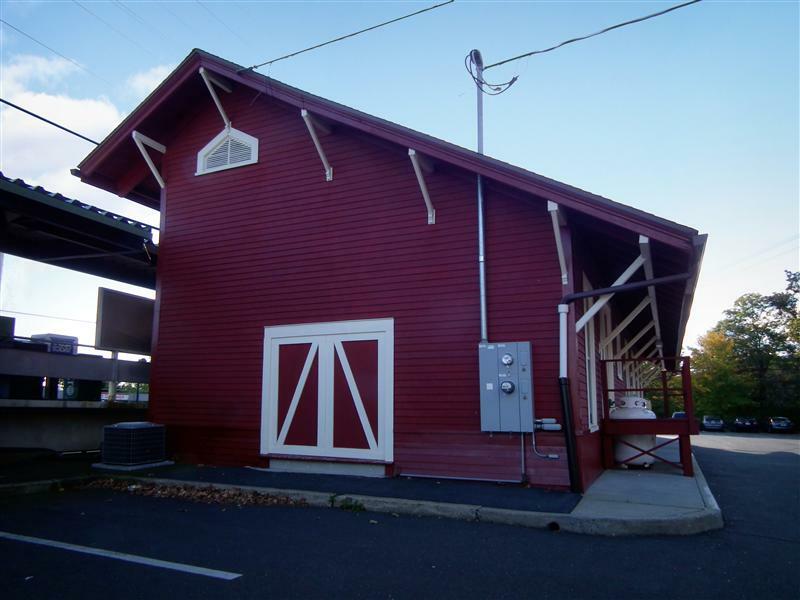 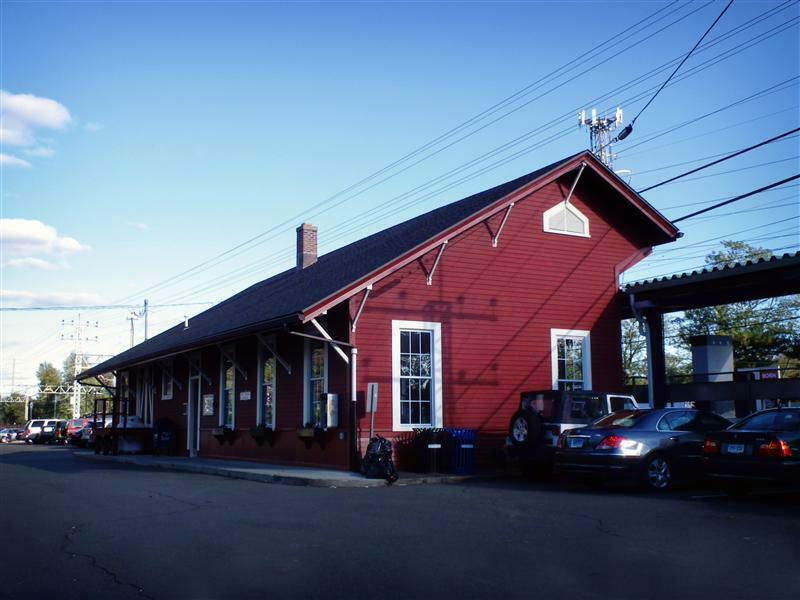 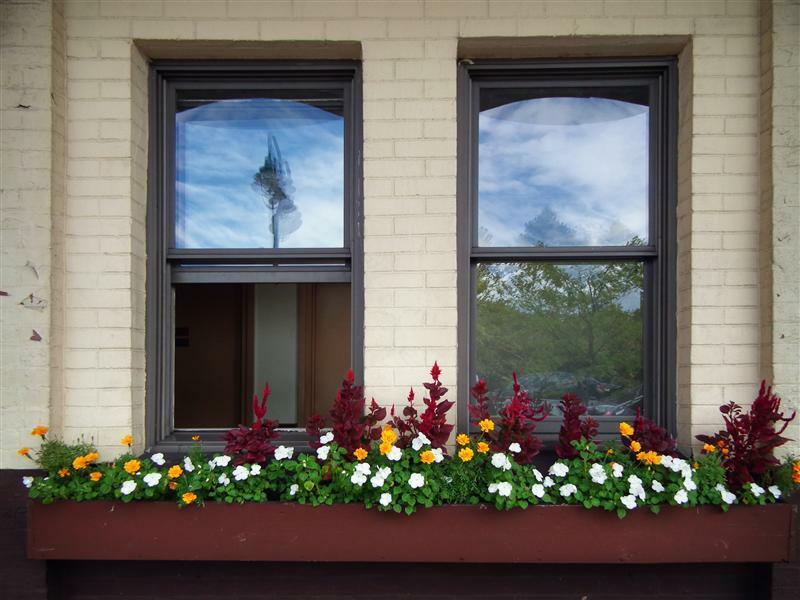 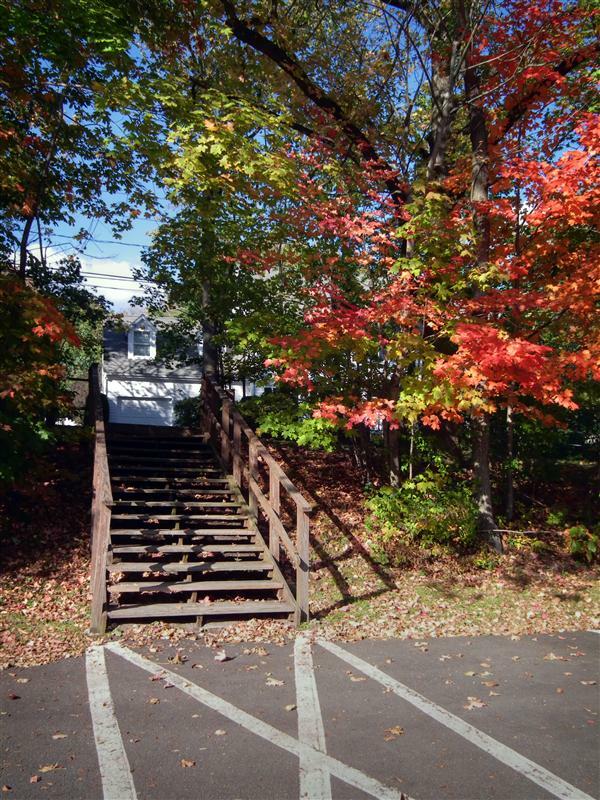 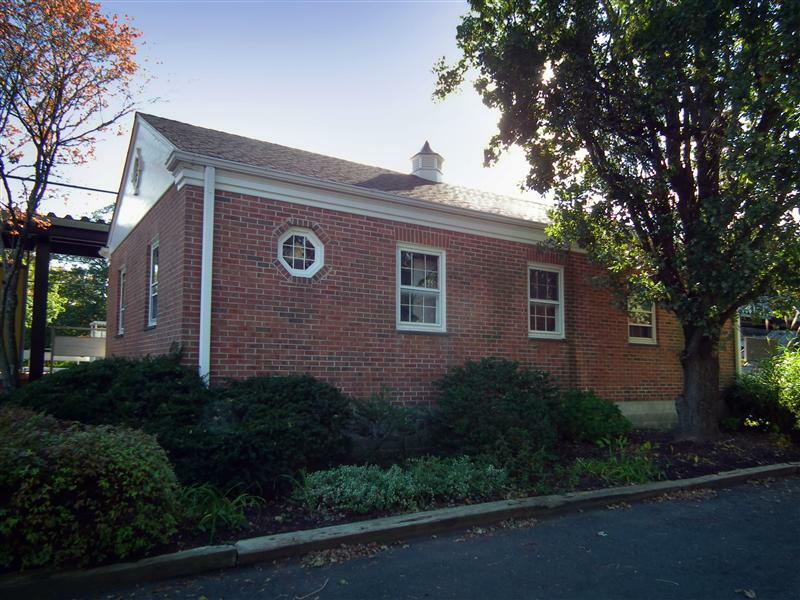 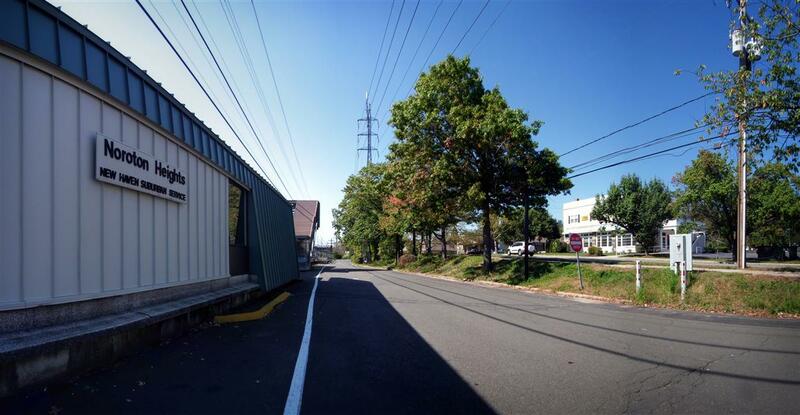 If you remember our visit to Cos Cob, you’ll notice the similarity between the two buildings. 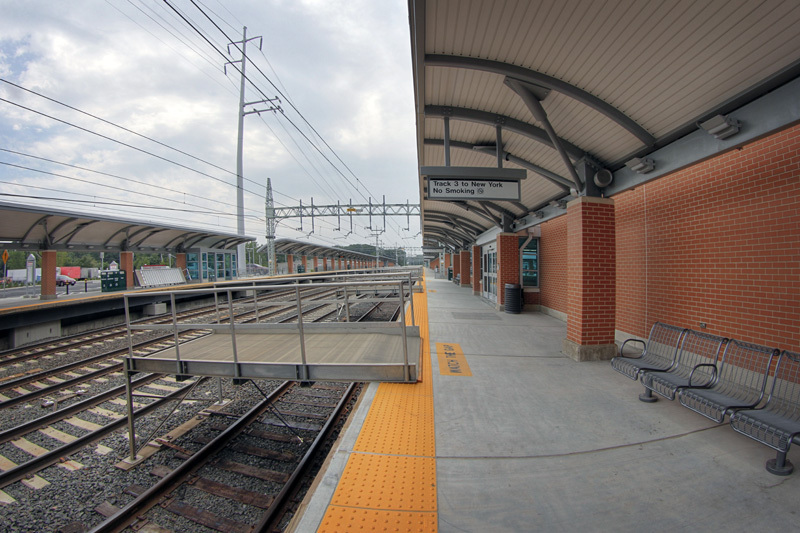 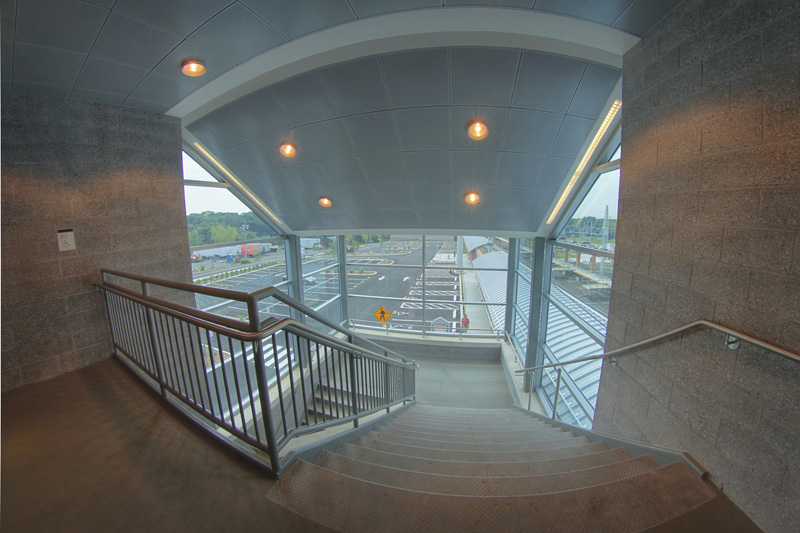 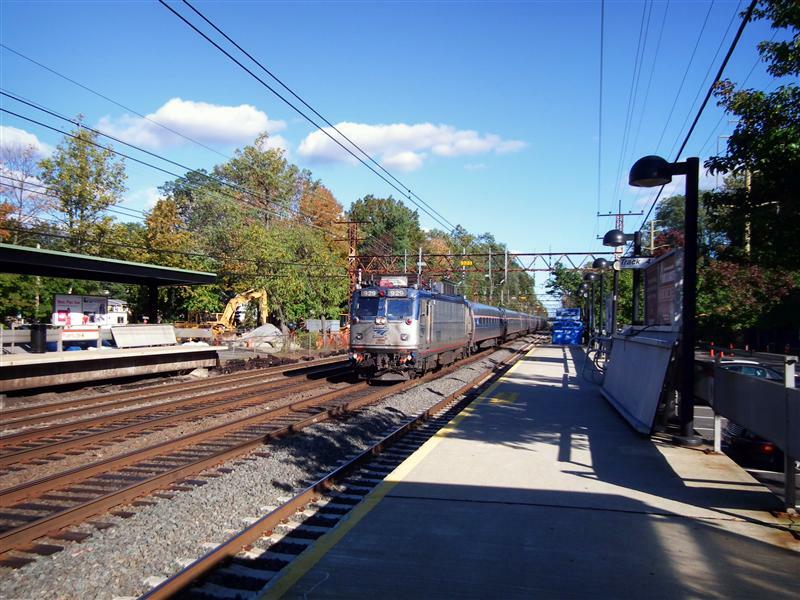 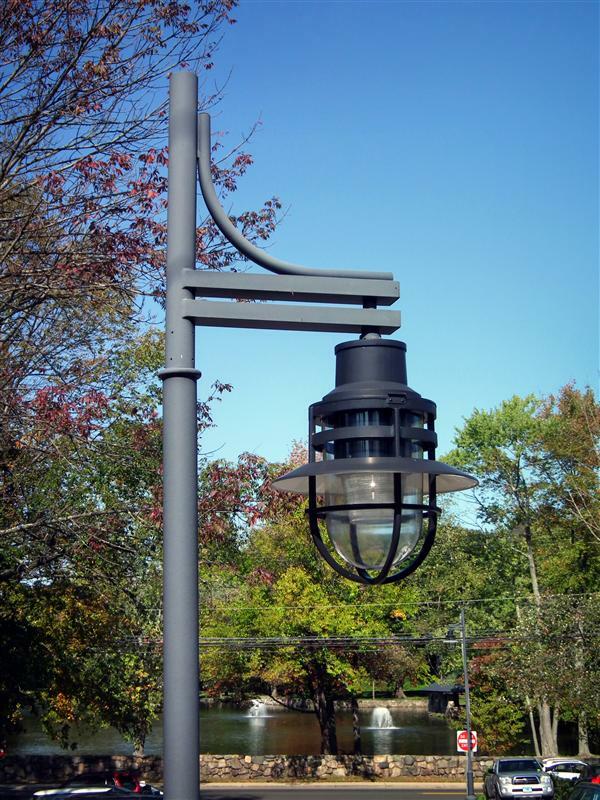 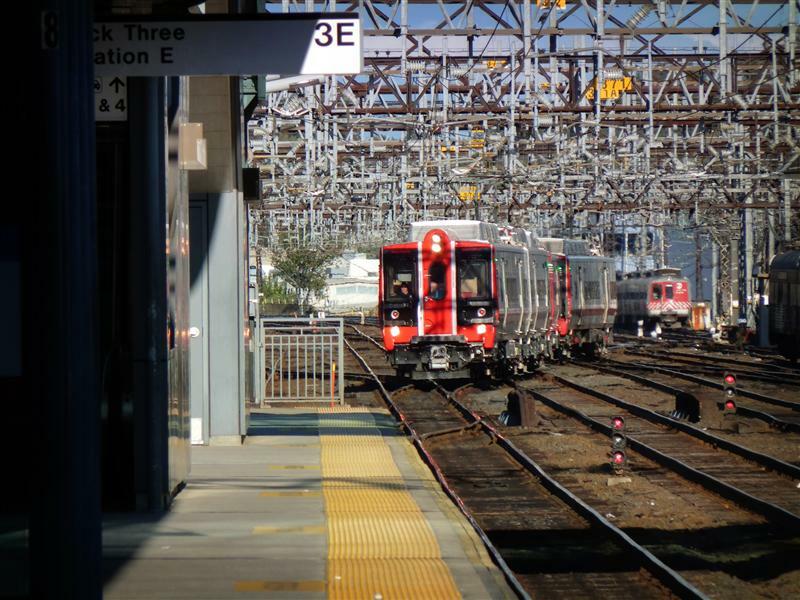 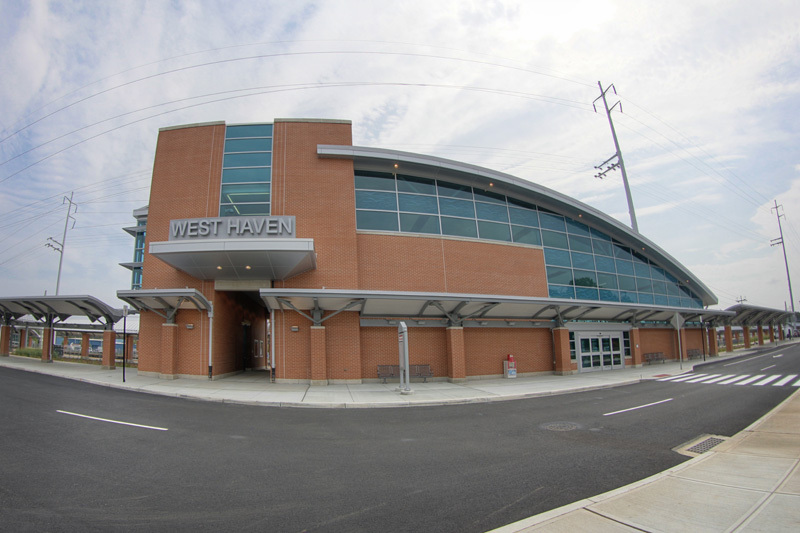 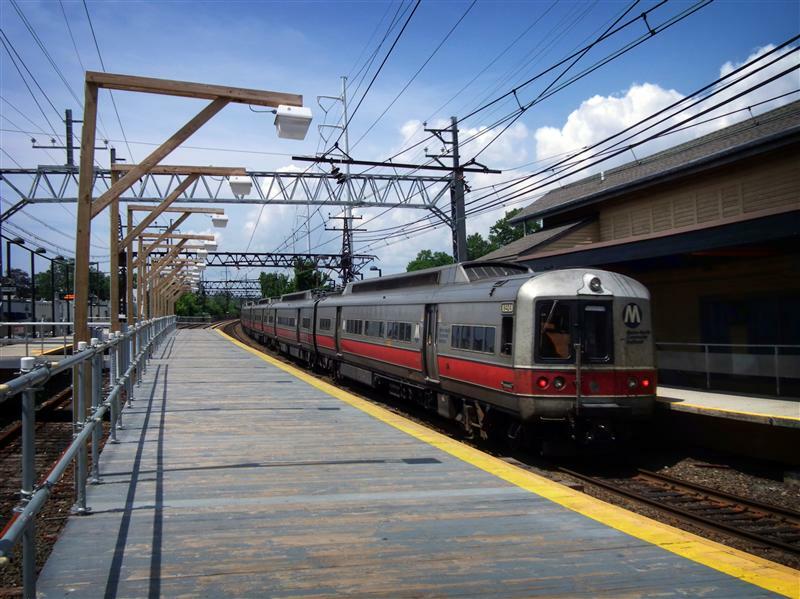 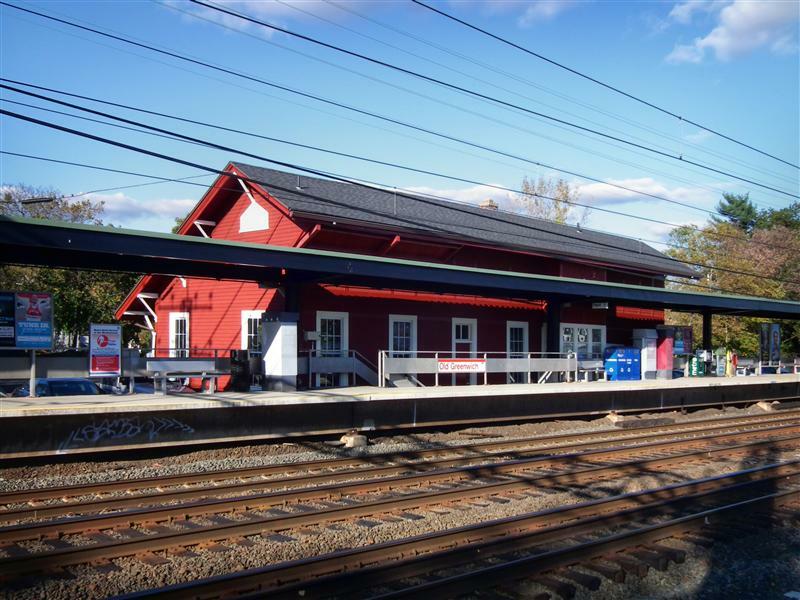 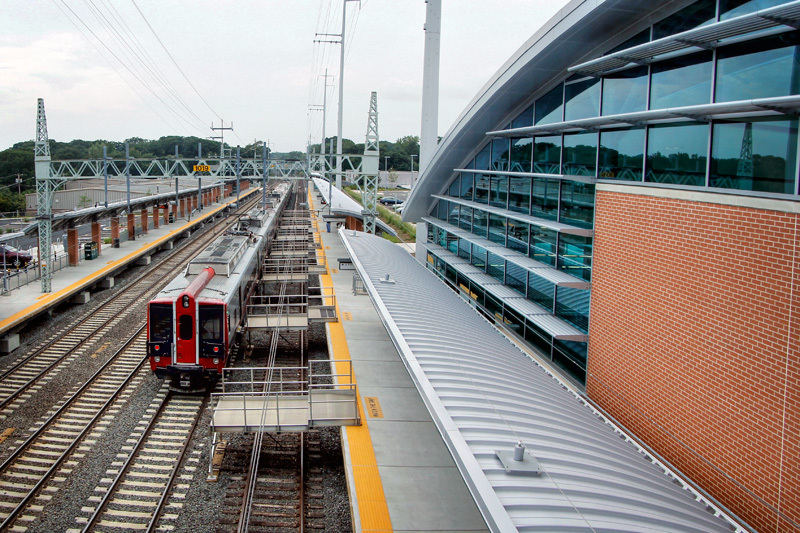 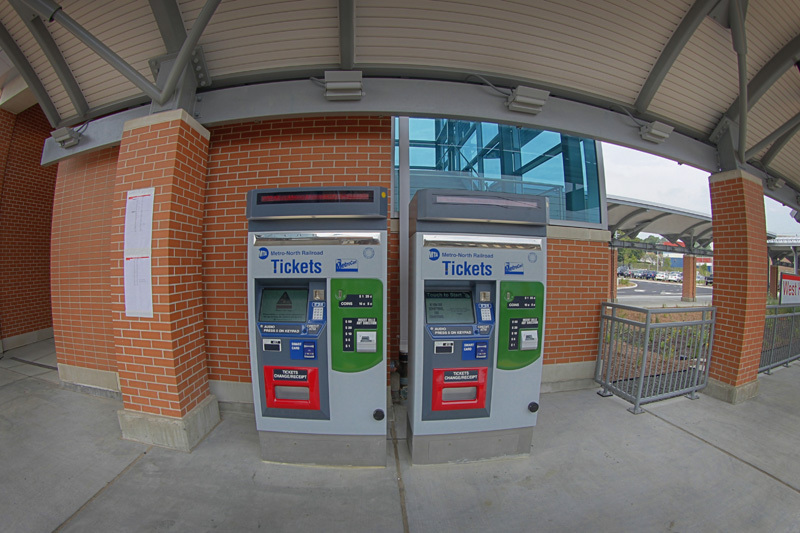 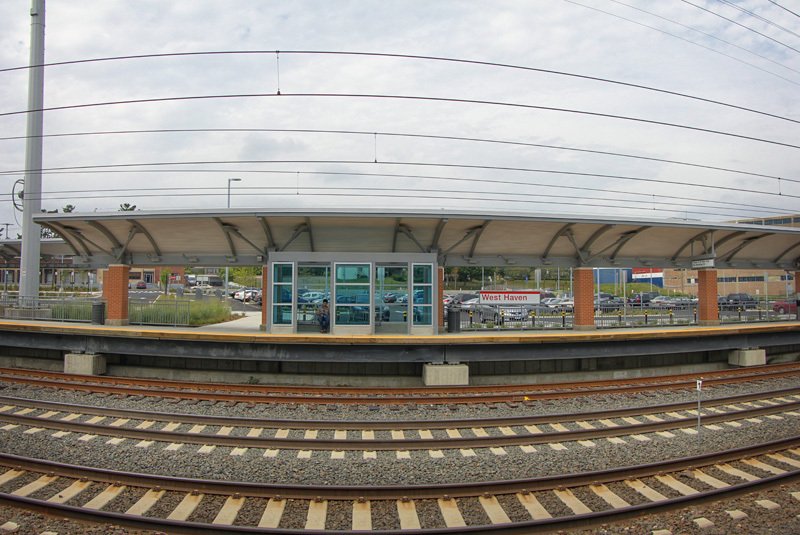 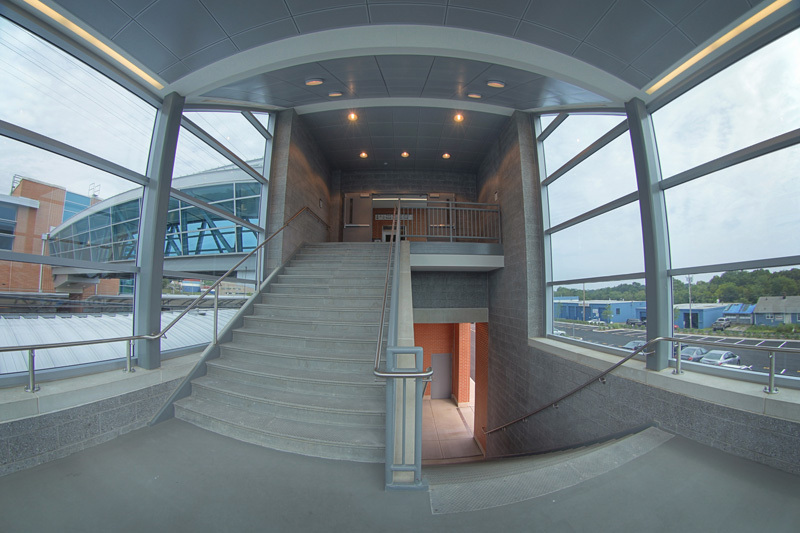 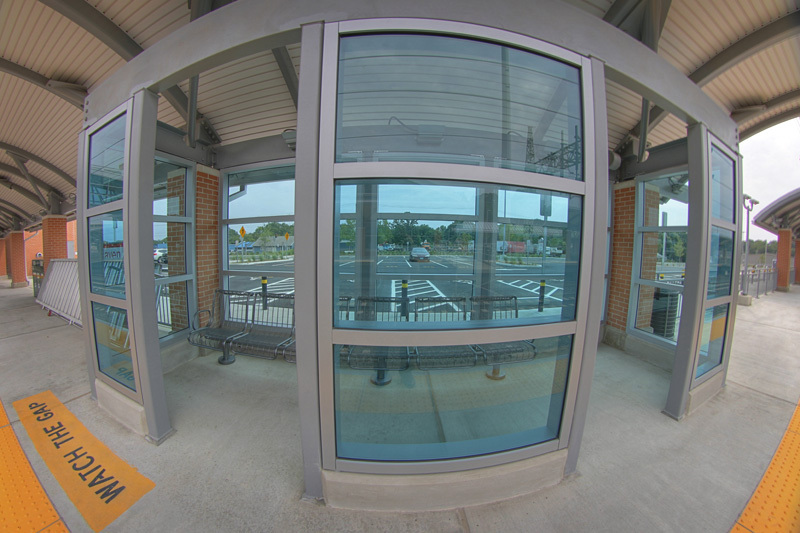 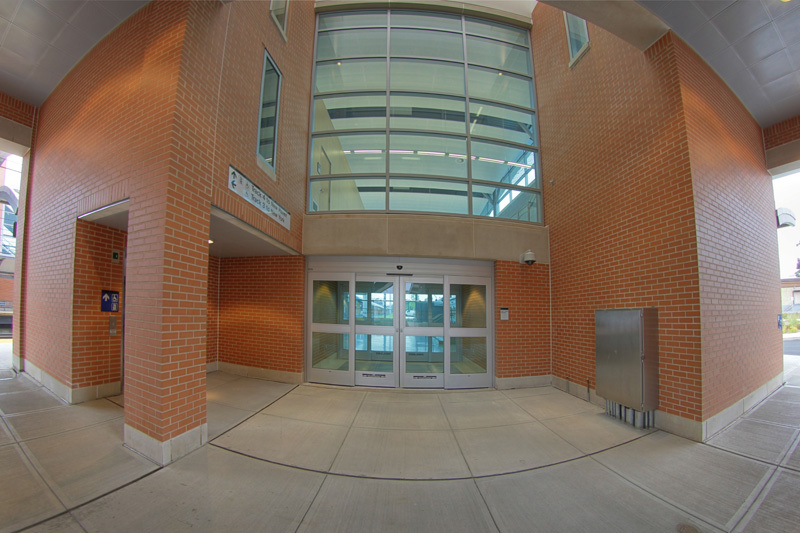 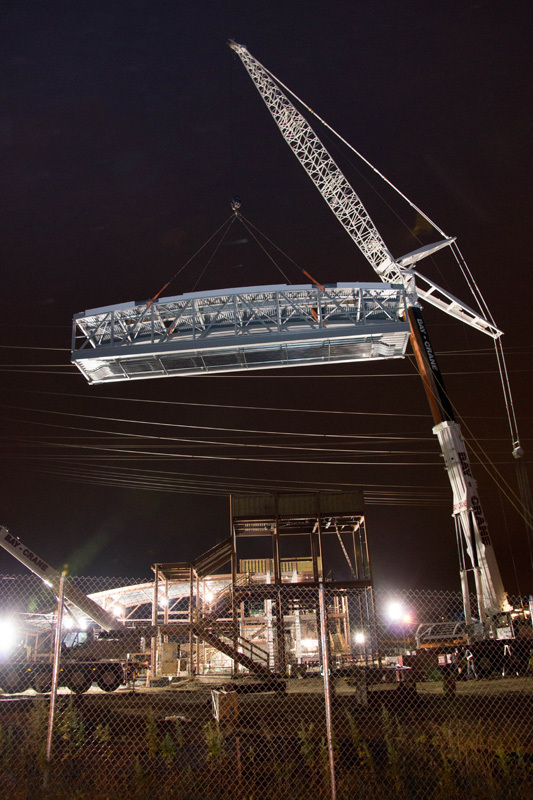 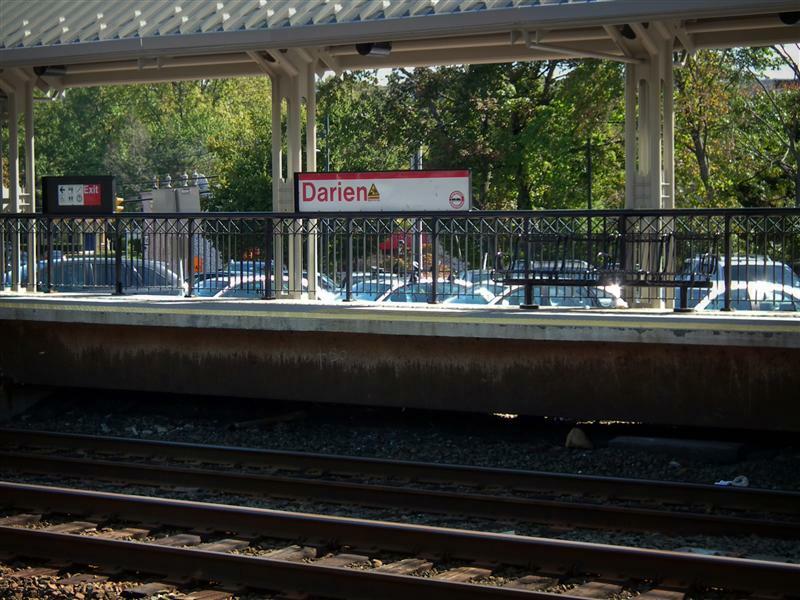 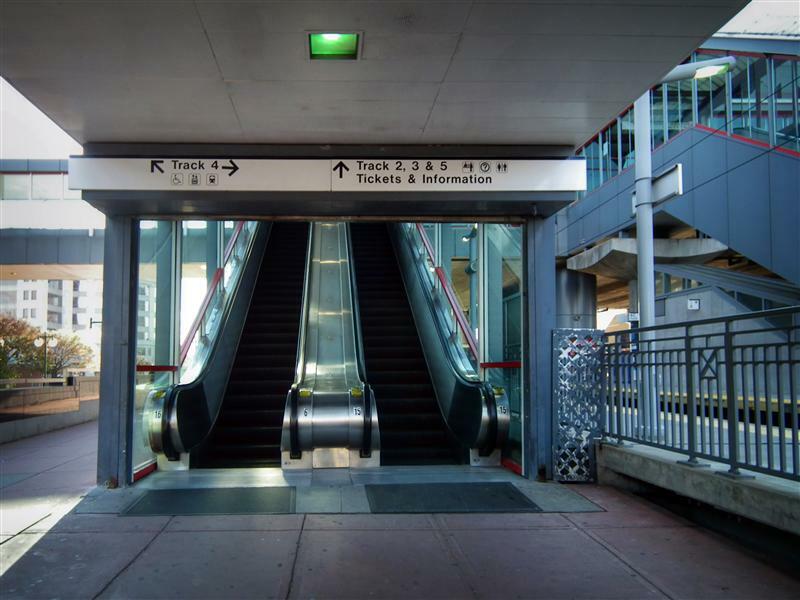 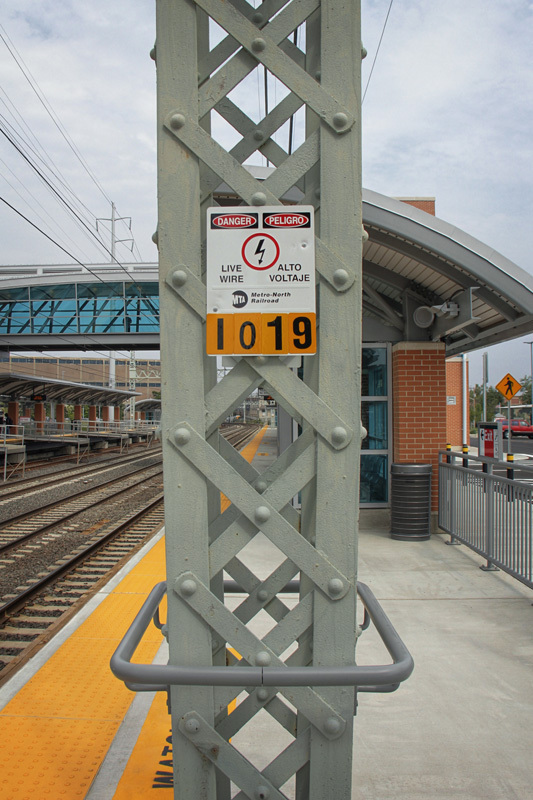 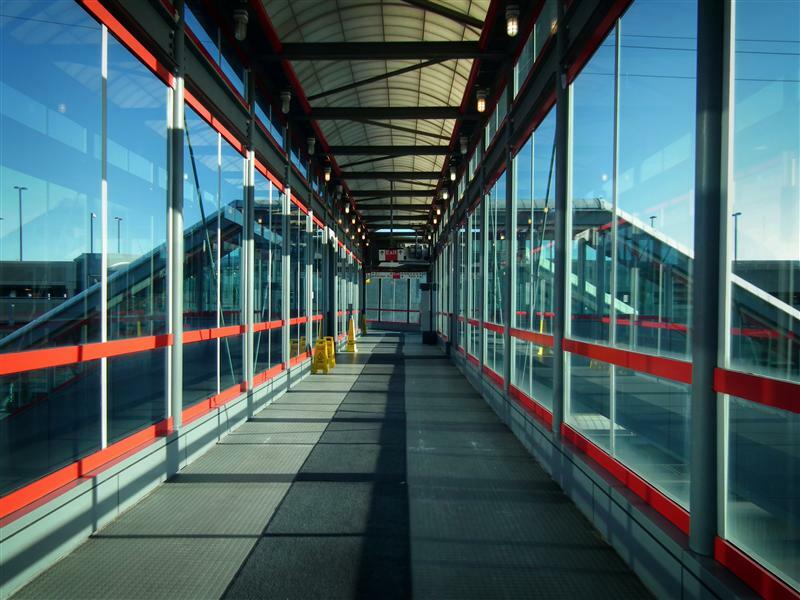 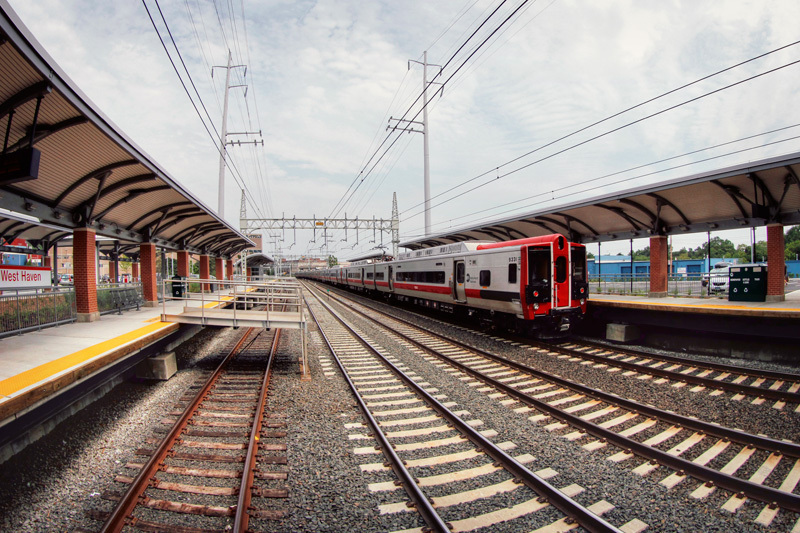 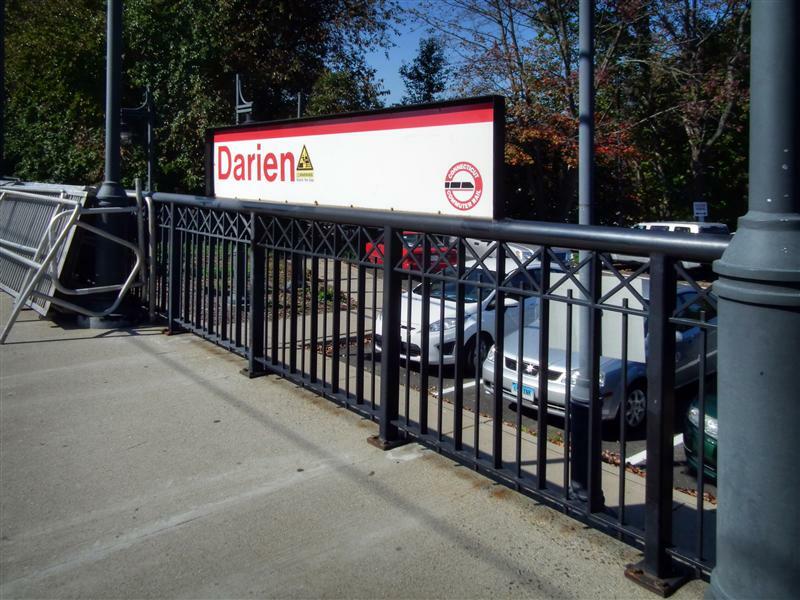 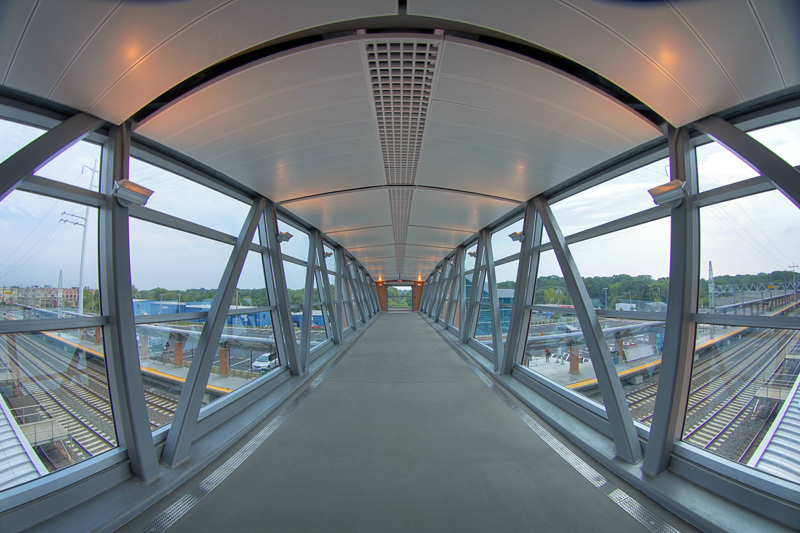 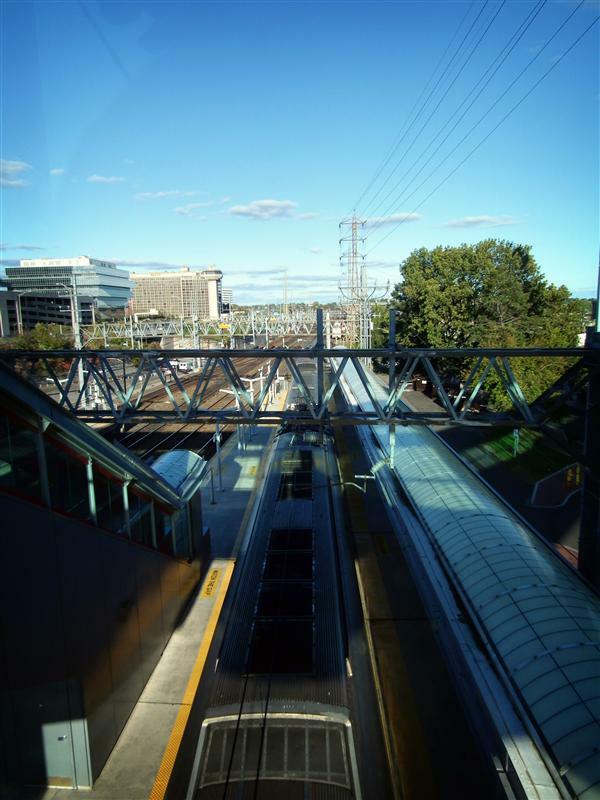 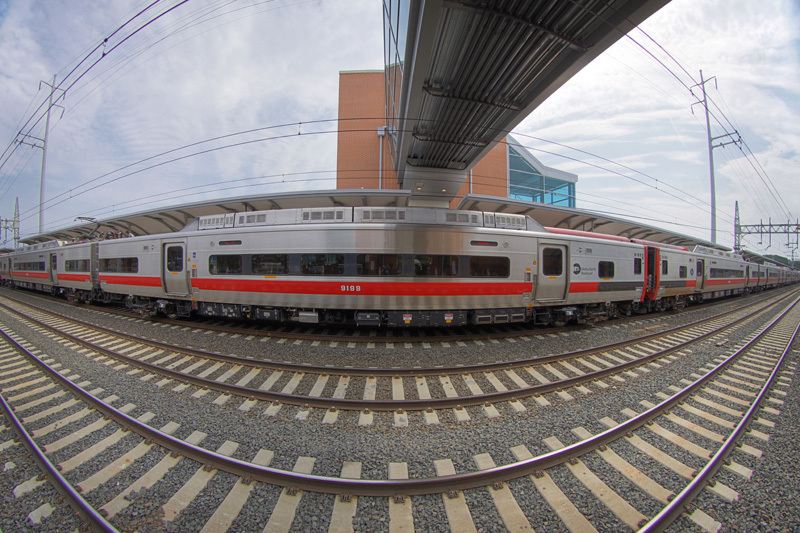 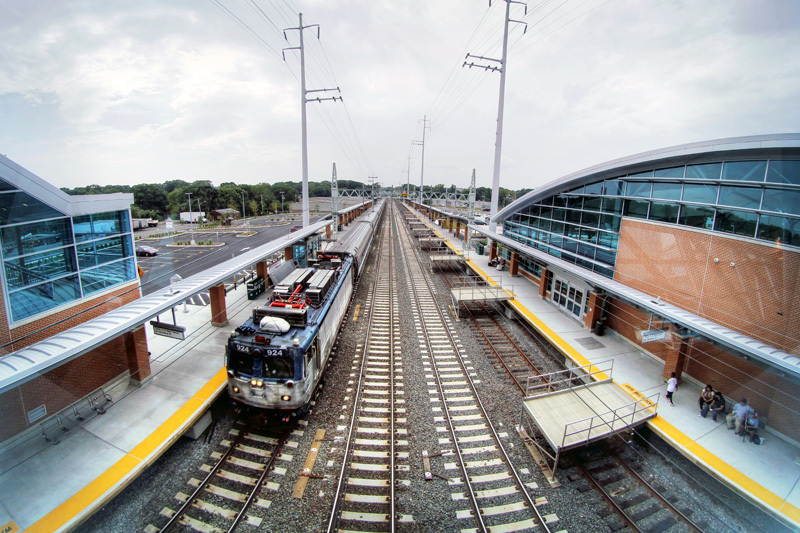 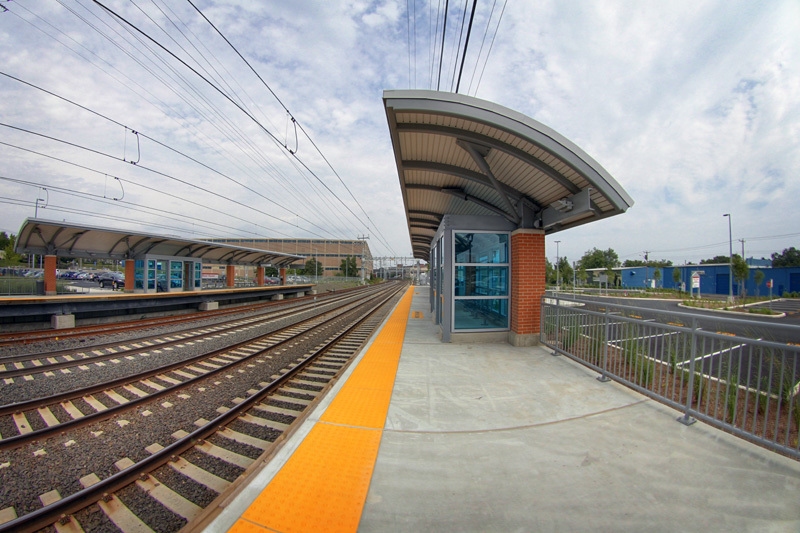 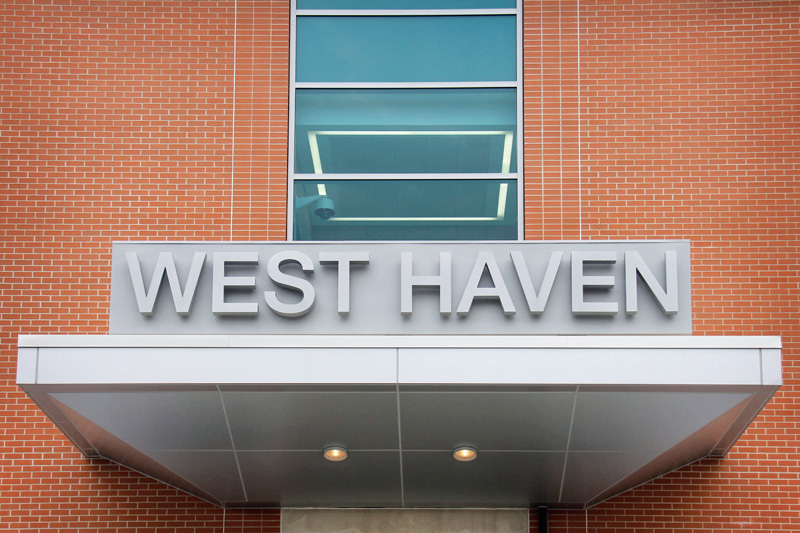 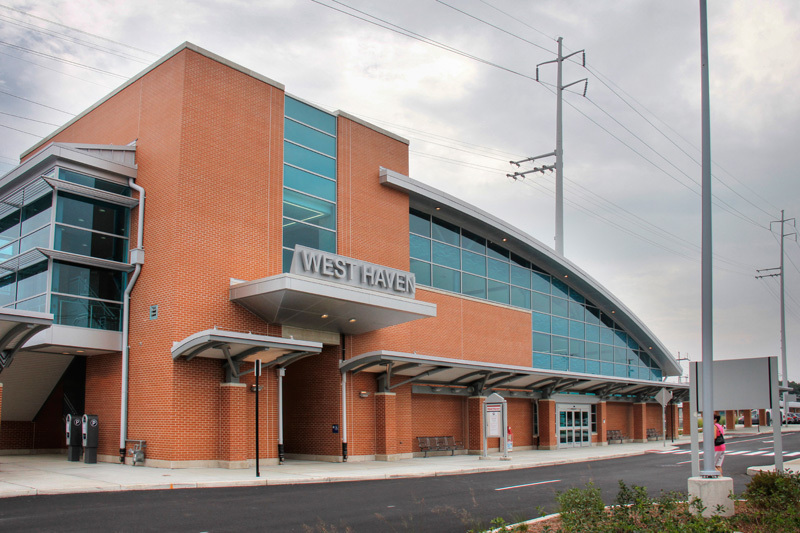 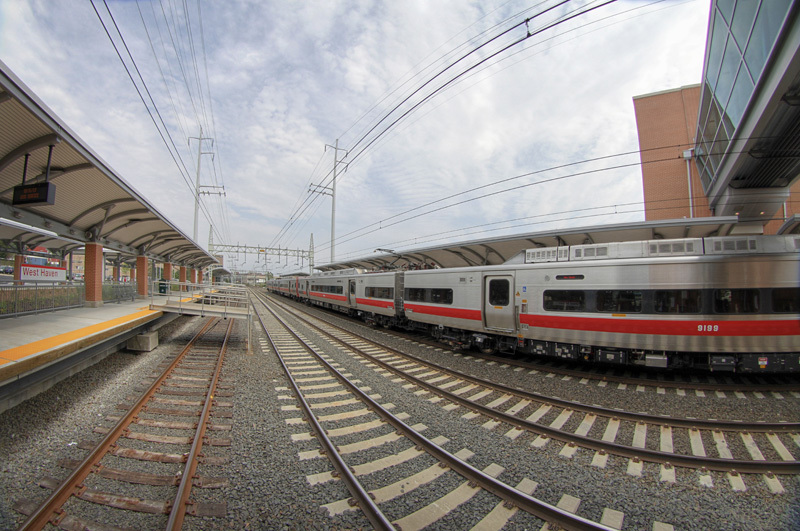 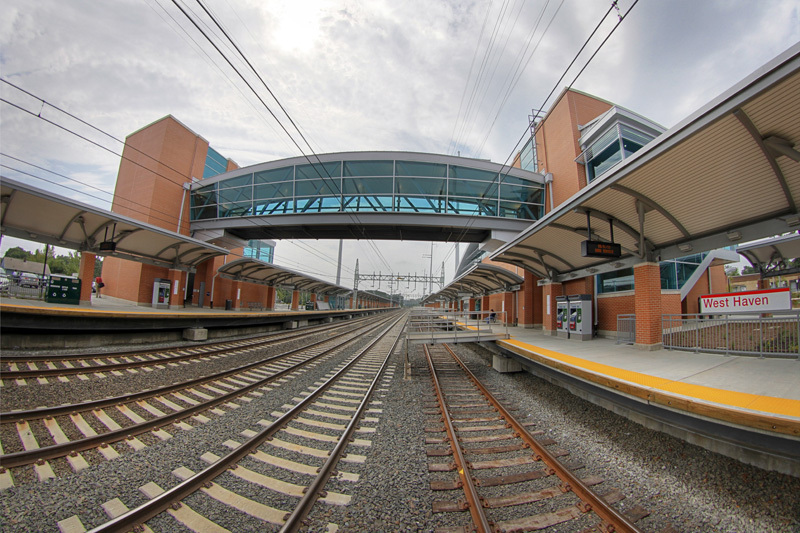 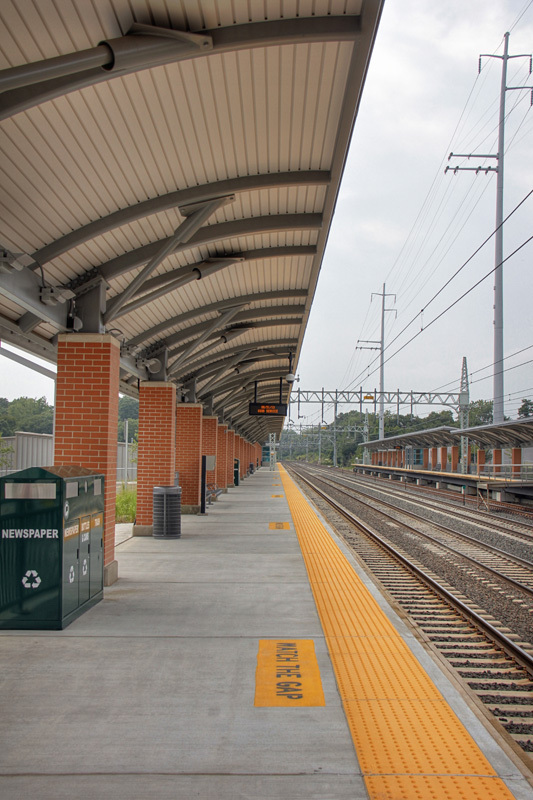 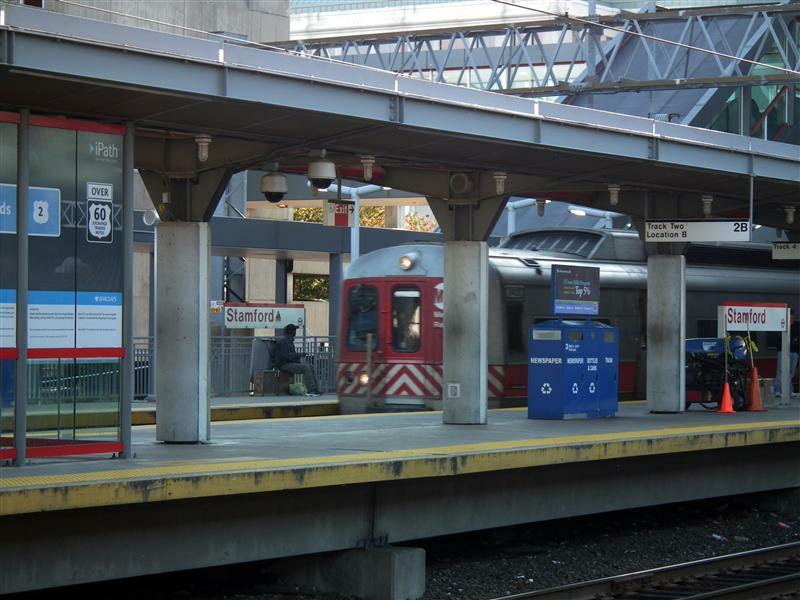 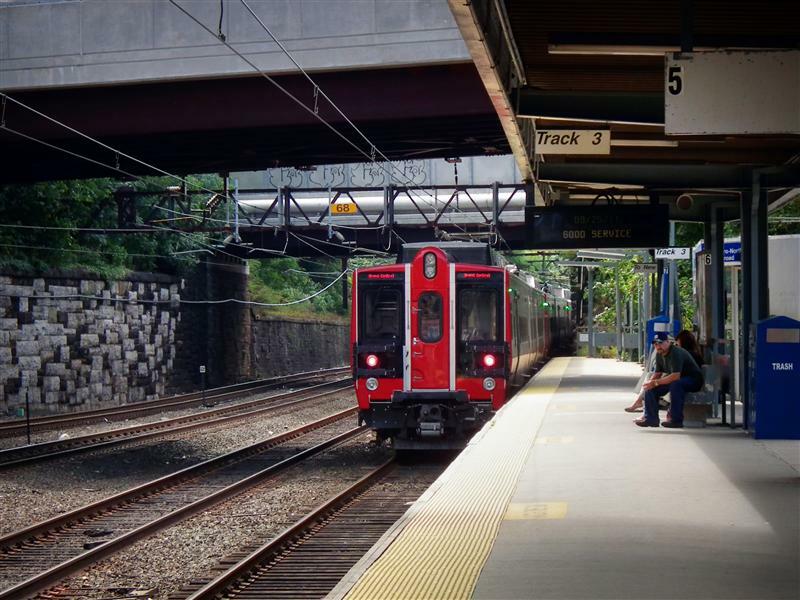 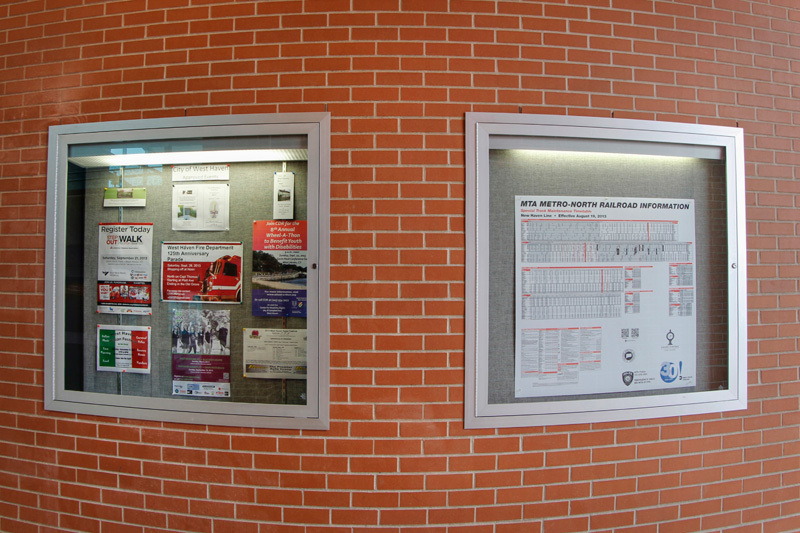 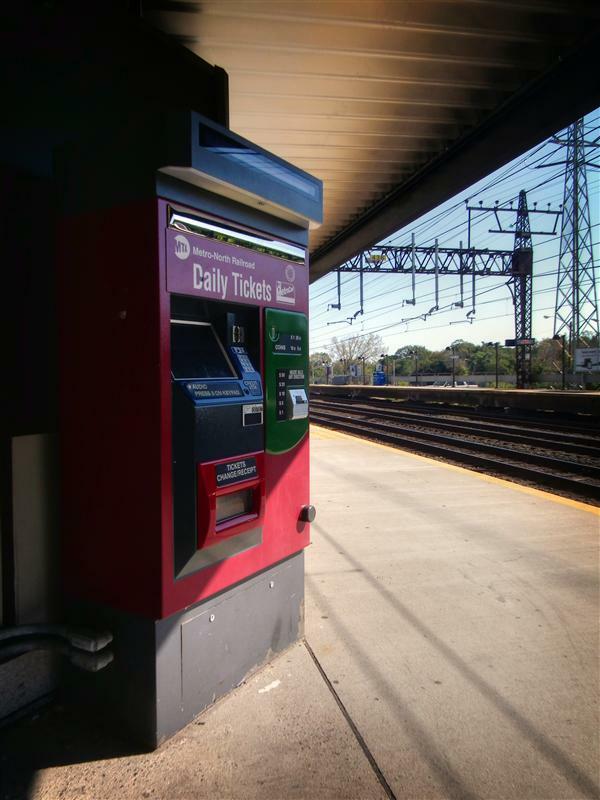 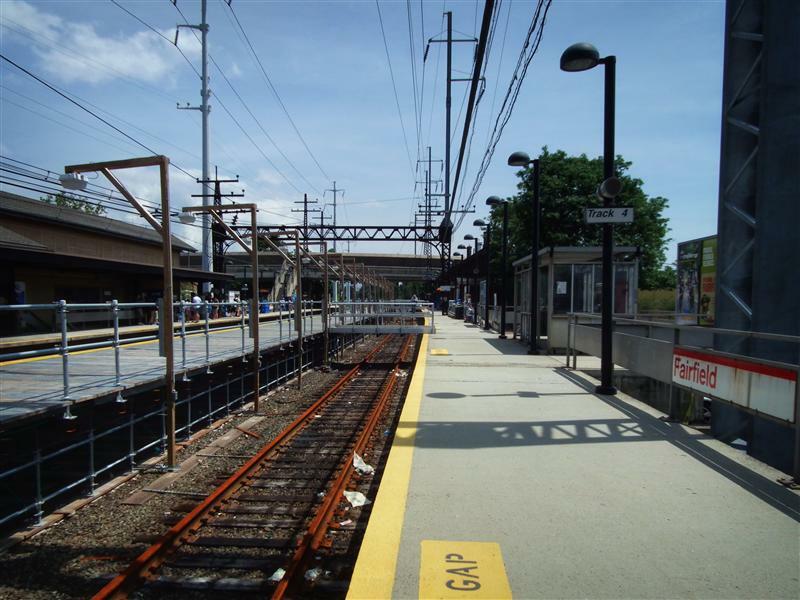 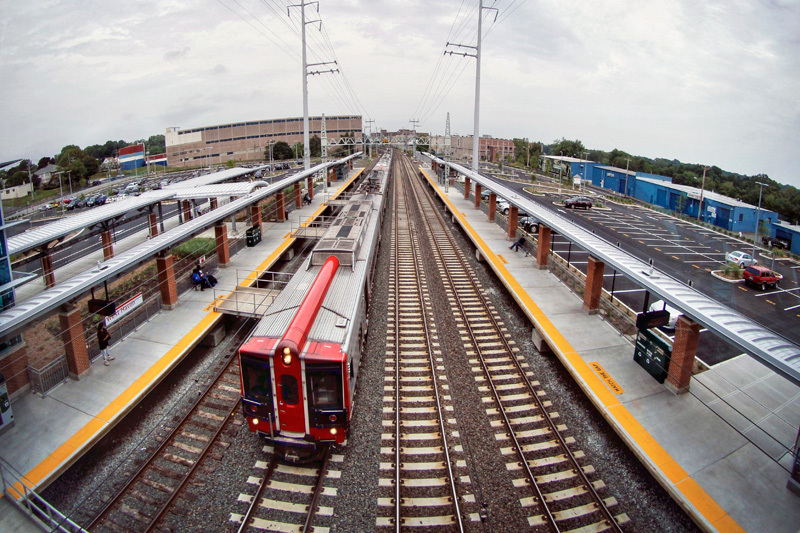 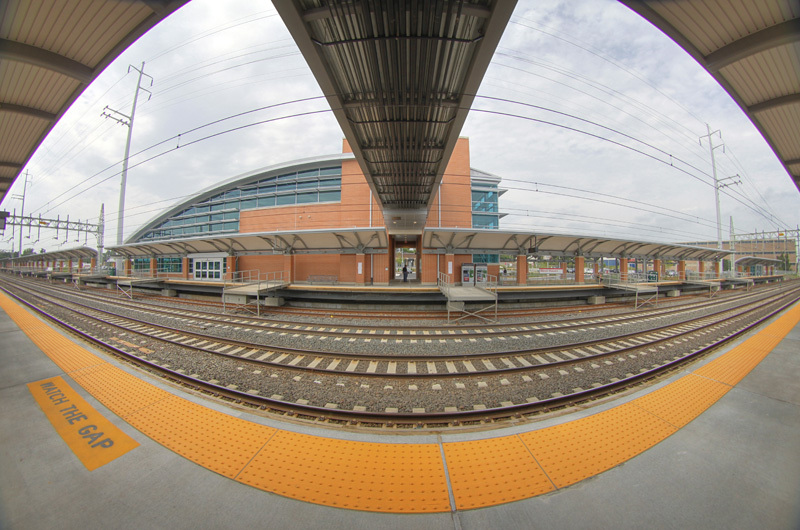 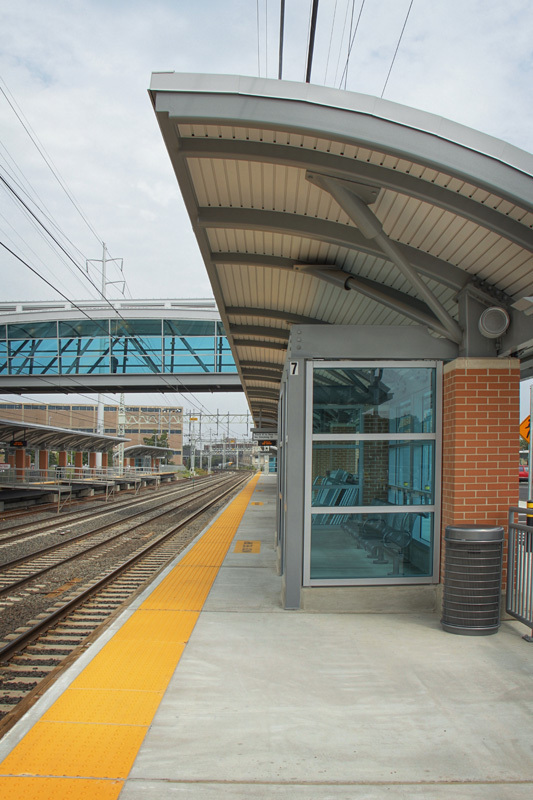 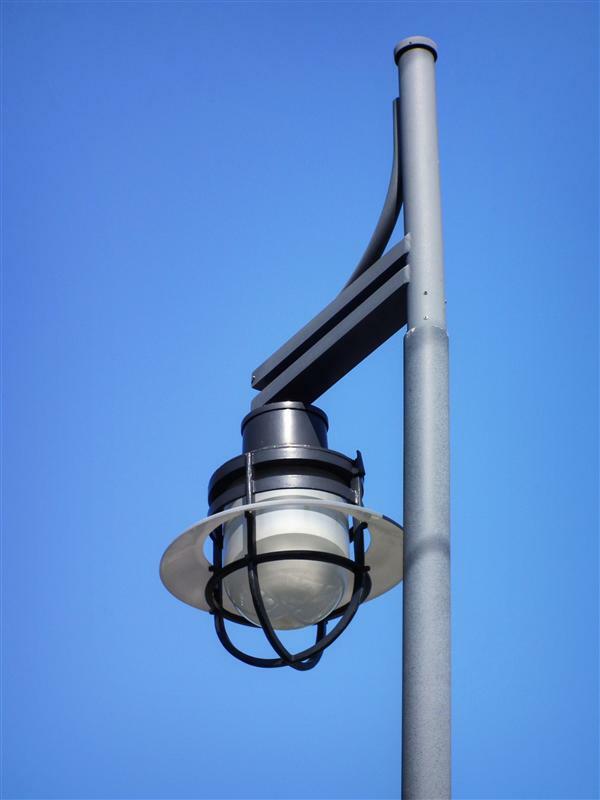 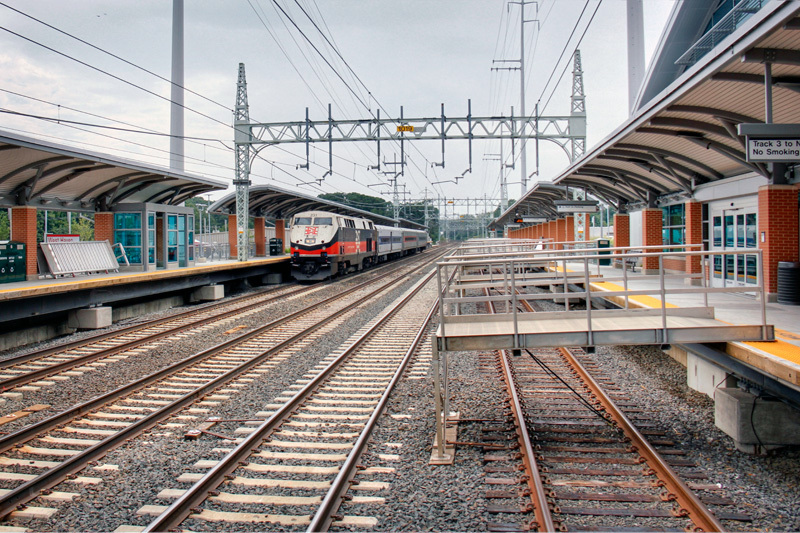 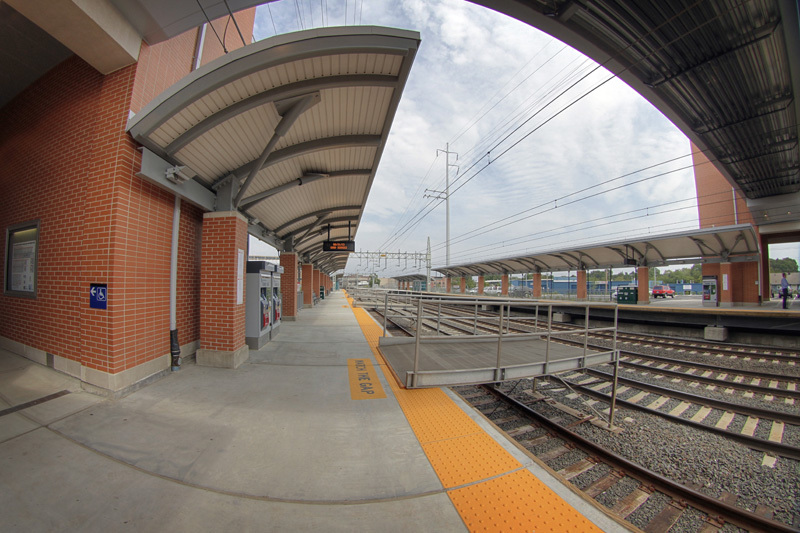 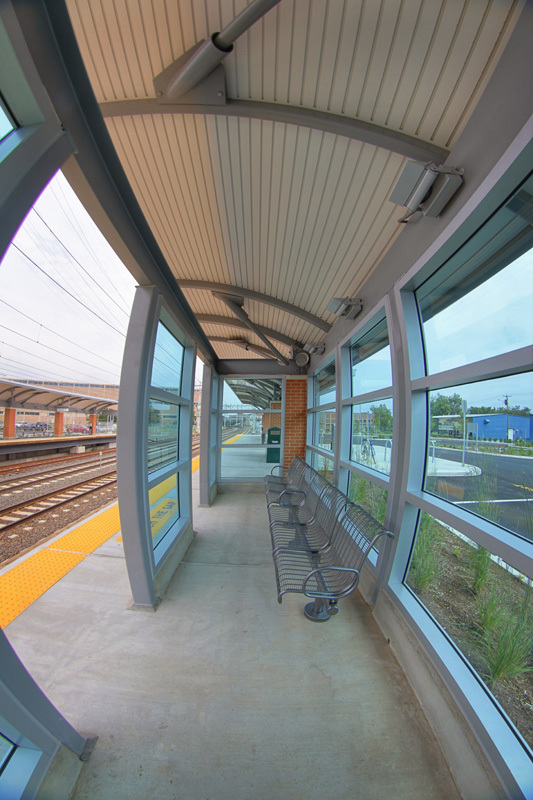 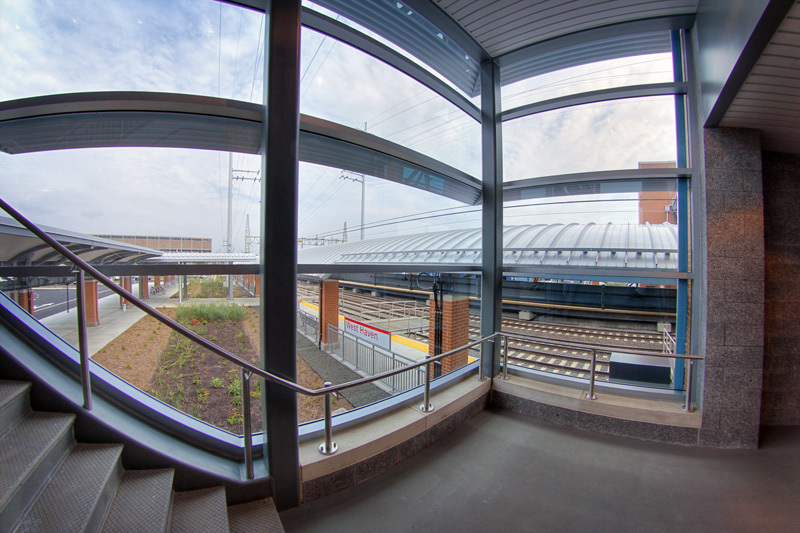 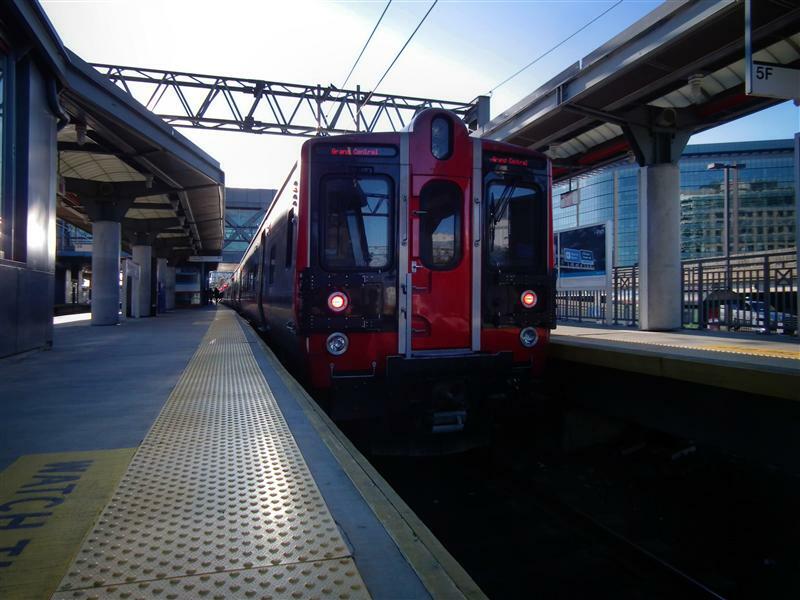 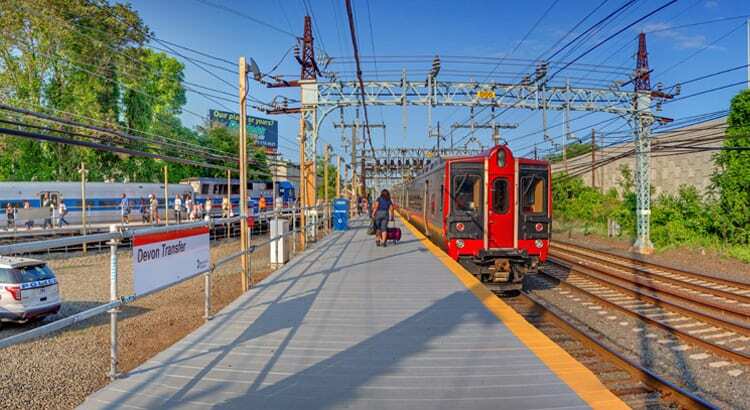 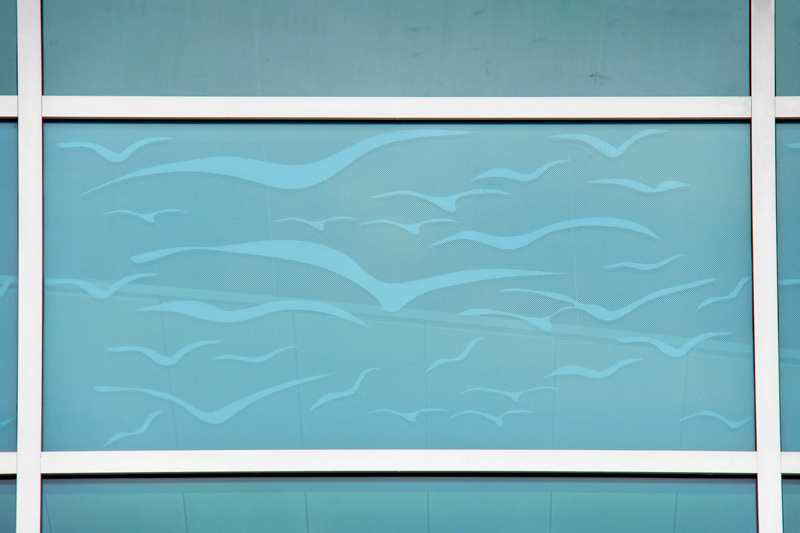 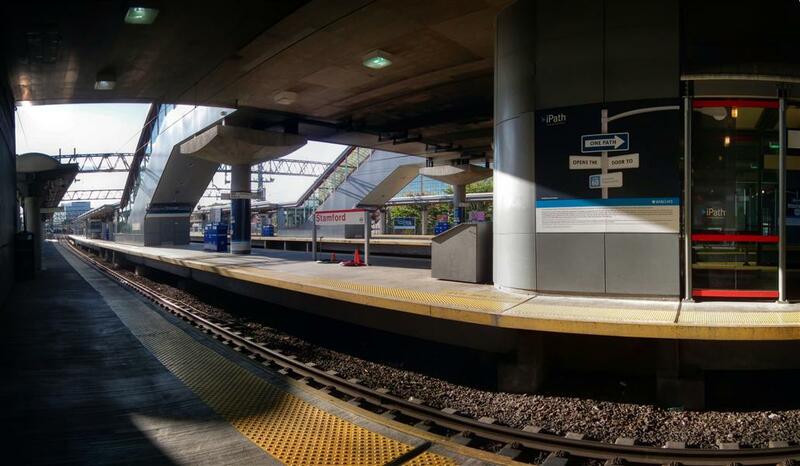 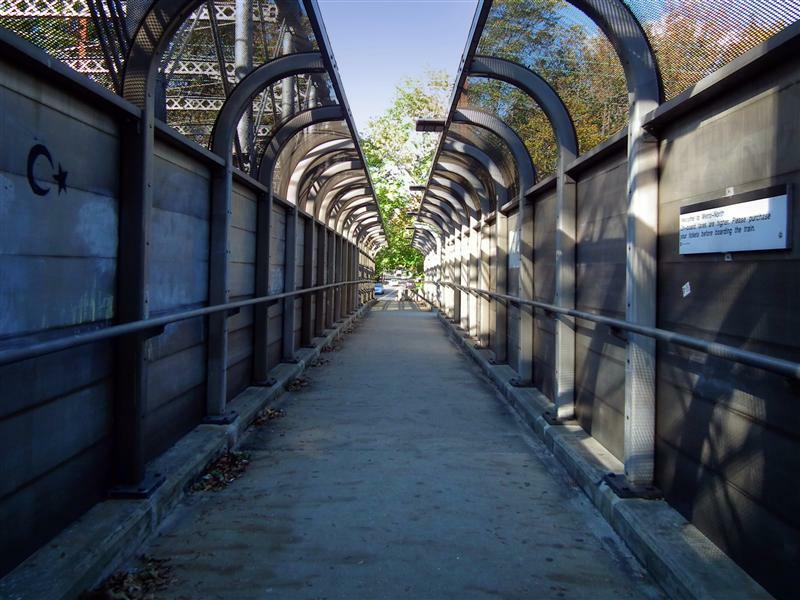 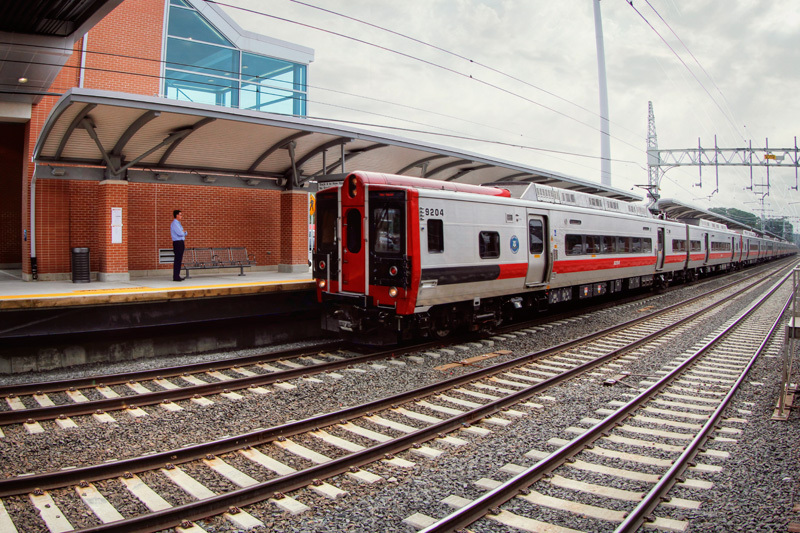 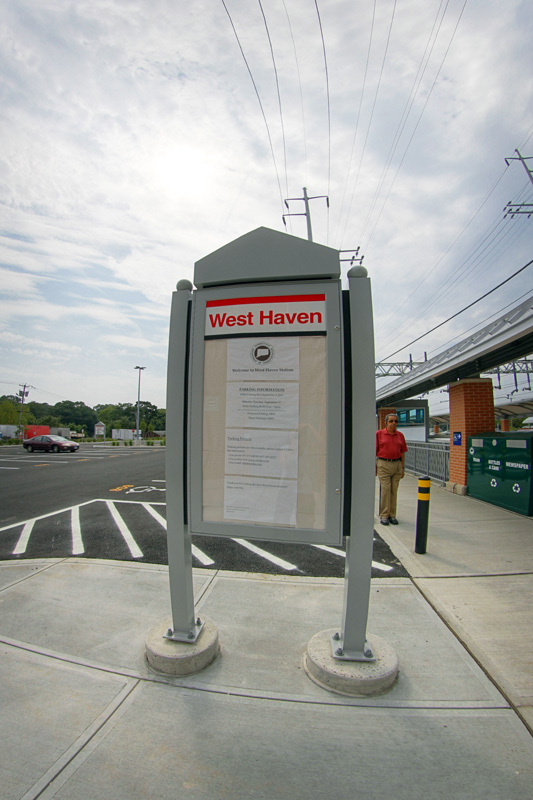 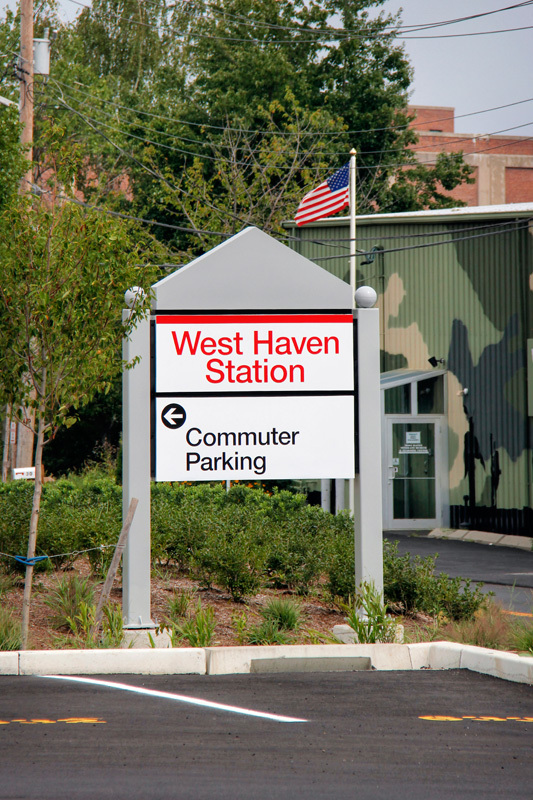 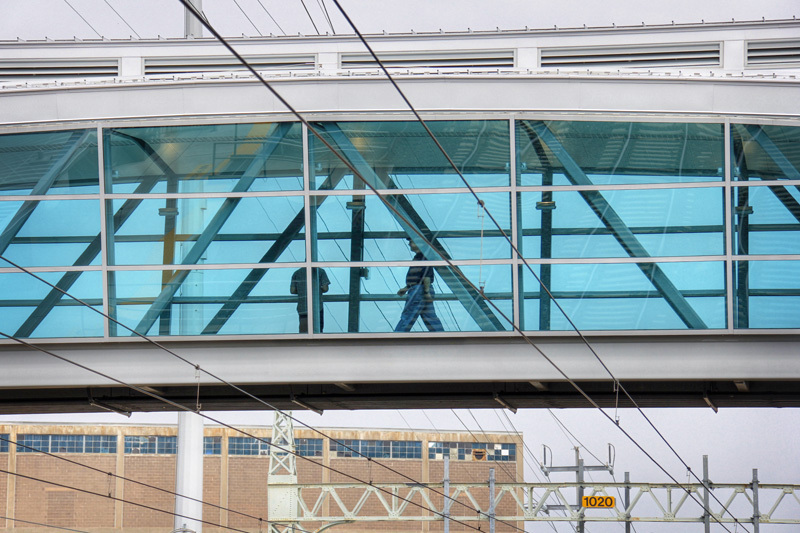 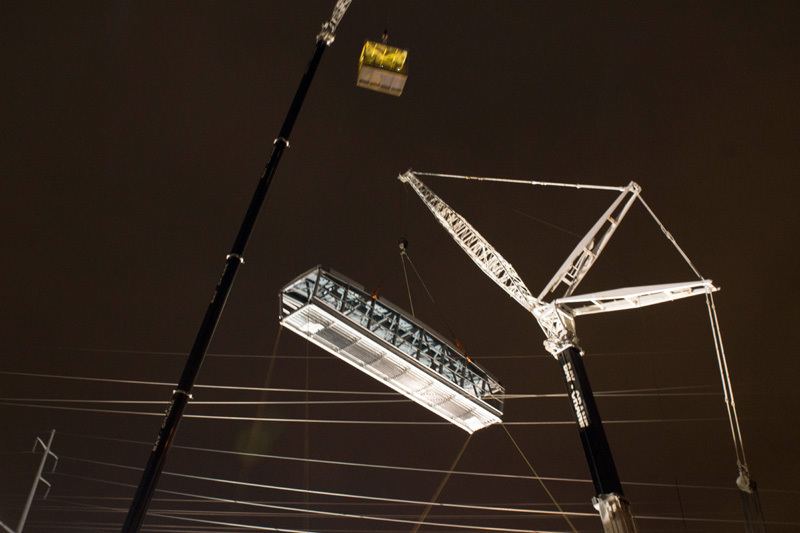 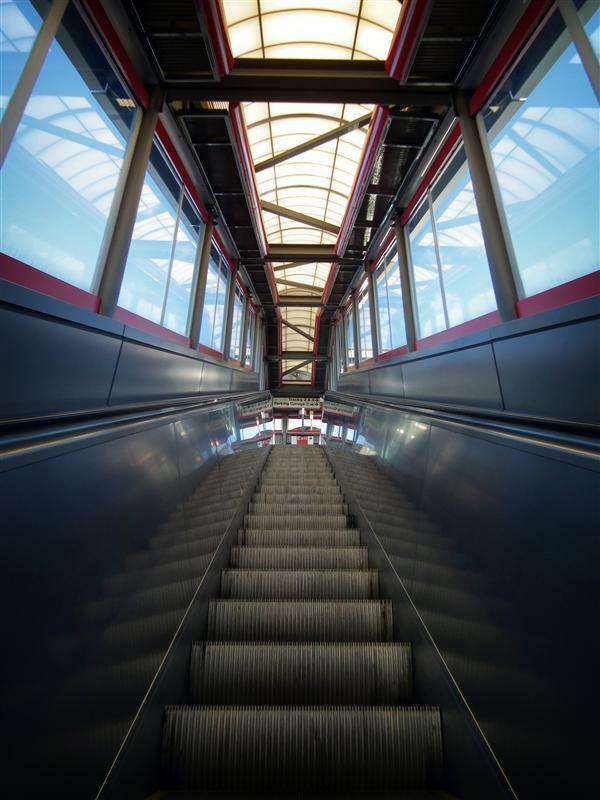 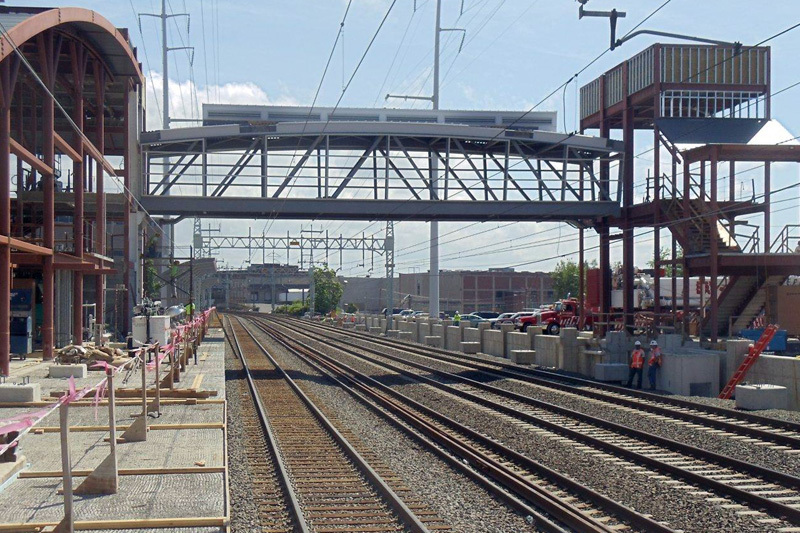 Using the same building design at multiple stations was a cost-saving measure.